Today students reviewed the rules for adding integers. 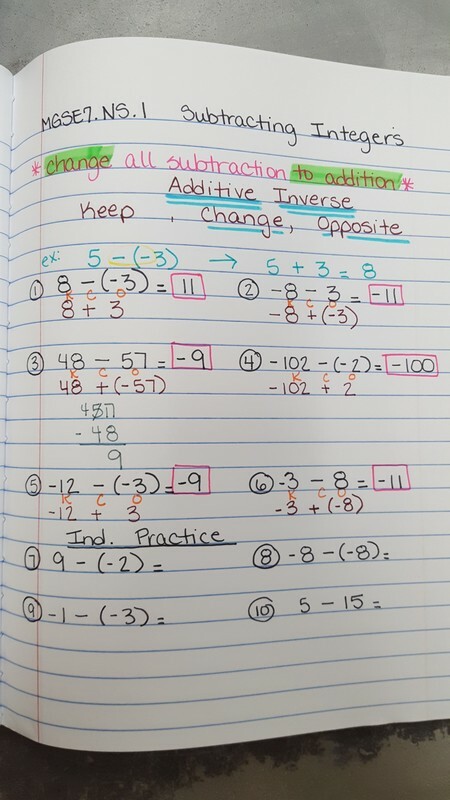 Then, they learned how to subtract integers by applying "additive inverse". Today students learned how to add integers in 1st, 6th, & 7th periods. Many finished notes and learned how to play Integer War. Please have your homework finished when you come in tomorrow. 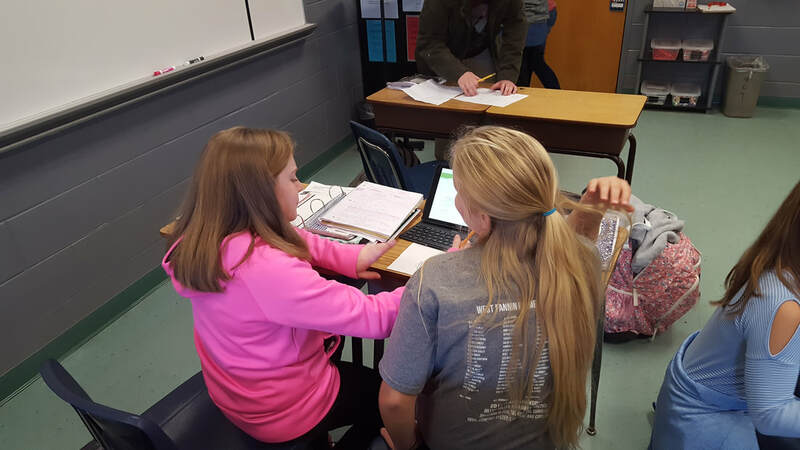 4th Period: Today students worked with their partner on their Math Mystery Packet. Then, we did a Quizizz over Area and Volume. 1st period: we had to be quiet for what seemed like our whole lives. 4th period: We continued working through the packet from Friday. Today each class period worked on a different assignment. 1st Period worked through an interactive digital breakout called, "Extreme Sarcasm". 4th period worked through a Math Mystery Packet with a partner. In 6th & 7th periods students learned how to add integers with 2-colored counters. We worked through an interactive flipchart. Today was Day 1 of Testing. After testing was over students went to connections for about 25 minutes and then back to 1st period. We proceeded through all of our classes for the remainder of the day. Tomorrow we'll rotate through all classes again. Today we reviewed Expressions. See paper below. Today students worked through their packets. We were able to go over the information in the packets during 1st & 7th periods. However, 6th period had to have a friendly Battle Royale competition! Good Job to the winners! Tomorrow students will have an open notes quiz over Number Systems. The blue group won the competition! After determining the winner of the tie off students worked in one of 3 different groups on a dividing fractions review. Tomorrow we'll finish it up and have a Battle! 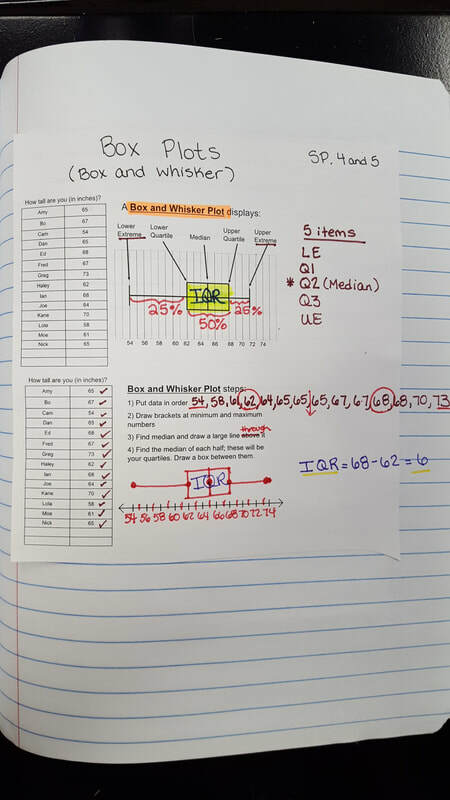 Today students in 1st, 6th, & 7th periods worked through their classes weak areas in a number systems packet. Tomorrow we'll go over their areas in detail and discuss answering constructed response questions. In 4th period, students finished their Benchmark and then had a friendly Socrative competition working through the Number Systems standards. Continue working through the weekly homework sheet. Today students continued working through USATestPrep. Today we worked through some number system standards in Review for Milestone's. Students also received their weekly homework sheet. Today students continued working through USA Test Prep. Today students worked on their Benchmark II on USATestPrep. Today students continued working on their Milestone's Pre-Assessment. They've done such a great job with this! They're almost done! Today we continued working through our Benchmark II. Today we split into small groups. One group played a review game while the other group worked to complete and go over their study guide from yesterday. Today students began their Benchmark (Milestone's Pre-Assessment). We'll use this data to drive our Milestone's Review. Today students finished up with Box Plots. Then, they received their Statistics Study Guide. We were actually able to complete the study guide in class and go over the answer key! Today students took their Statistics Test. Several did not take theirs today due to absences last week. They'll take theirs tomorrow. Today we continued working with Box plots. Students were able to take a given box plot and identify the LE, Q1, Q2, Q3, UE, and IQR. Then, we worked through a more difficult higher level practice paper in small groups. Tomorrow we'll continue with Box Plots. Today we continued reviewing our Statistics Unit through a fun, interactive, Battle Royale Game. 6th period will need to play a tie breaker at the start of class on Monday. The Statistics Unit test is Monday. Please review your Study Guide over the weekend. Today students reviewed Quartiles from yesterdays lesson. Then, we learned how to use our knowledge and understanding of finding quartiles to create a box plot. See notes below. Today students were given a precursor for the next few weeks. I gave them several dates and events to record in their Agendas. Then, they worked on their Statistics Study Guide with a partner or in a small group for 15 minutes. Afterwards, we went over the study guide and students were given answers. The Statistics Test is scheduled for Monday! Today students learned all about Quartiles and how their used in the creation of a Box plot! Students were very surprised at the simplicity of finding Quartiles. Tomorrow, we'll learn how to create and interpret a box plot. Statistics Test is scheduled for next Thursday! Today students reviewed all the statistics standards through a fun game of battle Royale. 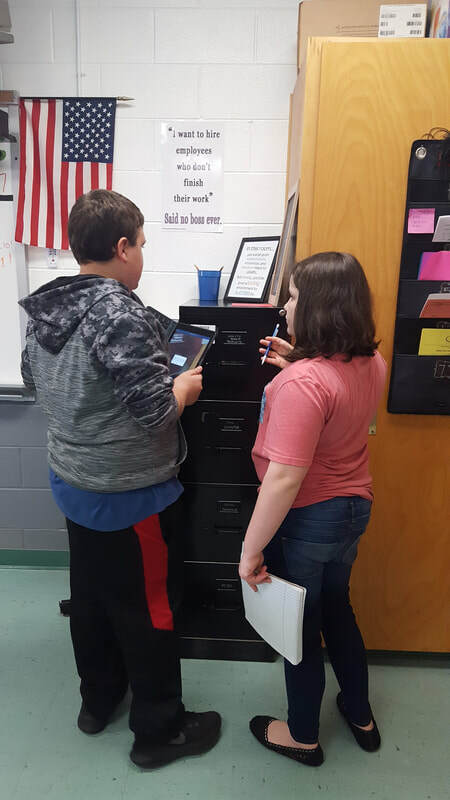 Today students created their own Histogram with a partner using the heights of the students, Mrs. Morgan, & Mr. Queen. We measured everyone's height in inches. Then, student recorded their height on the new viewsonic interactive panel. Afterwards, partners worked together to create a frequency table and use the table to finish their Histogram. Today students continued reviewing box plots & data analysis of other graphs. We covered gaps, clusters, attributes, data displays, and skewed data. Tomorrow we'll play battle royale. Today we wrapped up our data analysis of histograms. 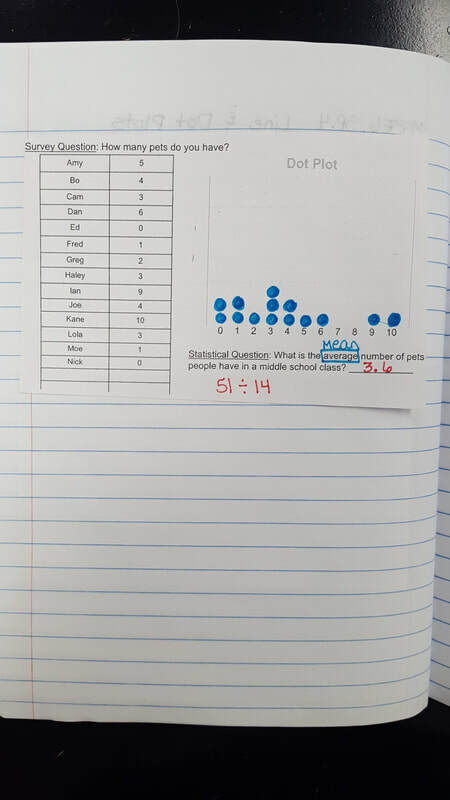 Then, a small group worked on creating a histogram from test grades. Another small group went and completed test corrections with Mr. Queen. 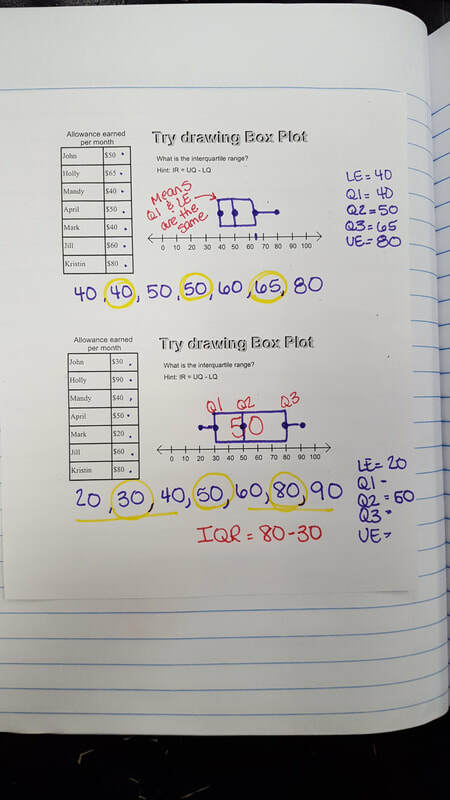 Today we continued working with box plots. 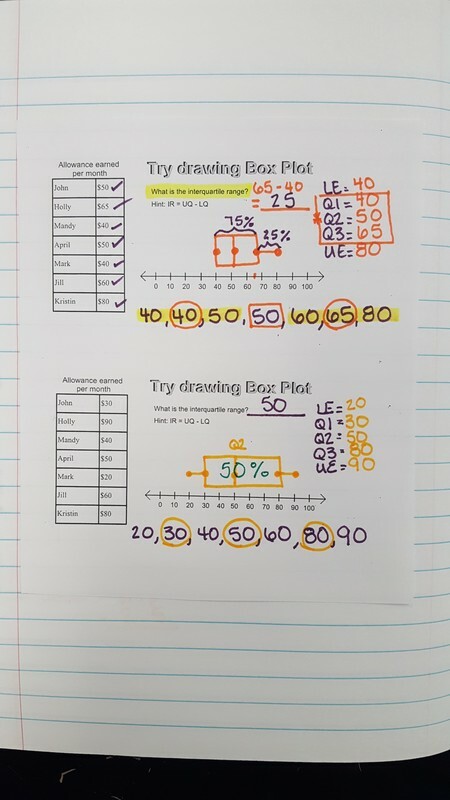 We used one practice paper to learn how to tell which set of data goes with a given box plot. Students completed the paper in class. I did a few of the problems with them. Click the "Box Plot" link for a brief video. Then, we worked together to complete a March Madness paper over Statistics including Mean Absolute Deviation. Today students learned how to create and interpret a Histogram. See notes below under 1st, 6th, & 7th period from last week. Weekly homework sheets are due tomorrow! Today students finished their Box Plot notes from Friday. See notes below on Friday's write up. 4th period: Today we learned all about line and dot plots. See notes below. Today students turned in their weekly homework sheets. My poor 6th & 7th periods did so well today. We had some major technical difficulties in class and had to go old school with the whiteboard. Everyone did so well paying attention and following along that they all got a piece of candy! We learned about Box plots today. 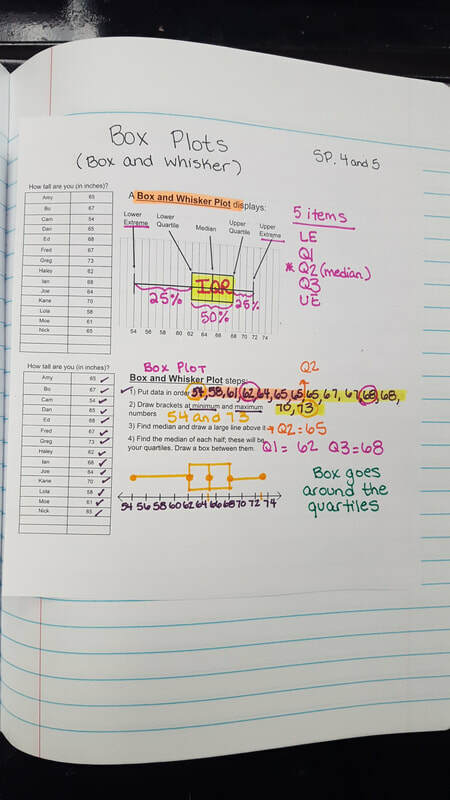 We used our knowledge and understanding of Quartiles to create some box plots. 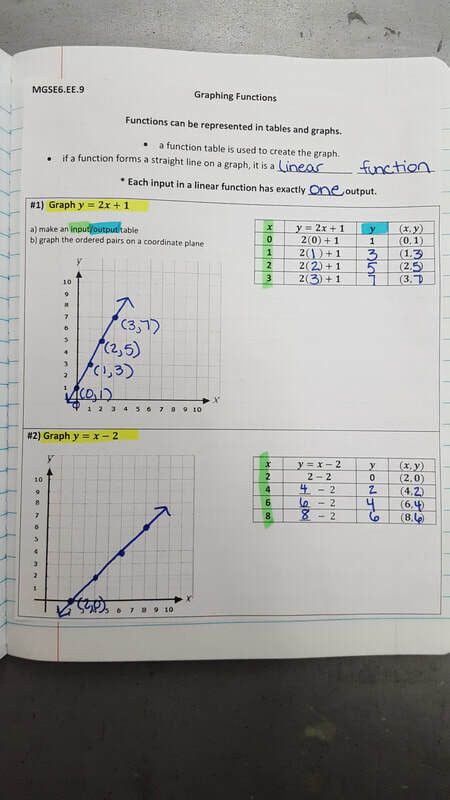 We'll continue working with box plots and graphs next week. Today our world was totally thrown off kilter. We had to use Mr. Pass' room during this class period. Students finished their Easter Activity from yesterday and received candy for doing so well!! Mr. Queen and I also gave them additional class time to work on their homework sheet that was due in class today. 1st, 6th, & 7th periods: Today students learned all about Quartiles. 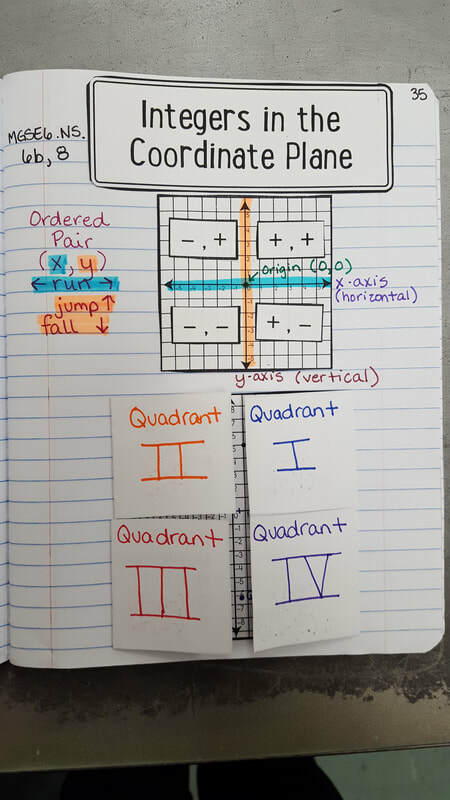 Quartiles are the start to creating a Box Plot. They did amazing with these! Weekly homework sheet is due tomorrow for 6th & 7th period classes!! Today students continued working with Mean, Median, Mode, & Range. They've really really been struggling with these calculations due to the various steps involved. Today, they did an Easter Activity. We're pretty sure they liked it. Some still need to finish. They'll finish up first thing tomorrow. Then, we'll move on to line & dot plots. Today we finished with Histograms. 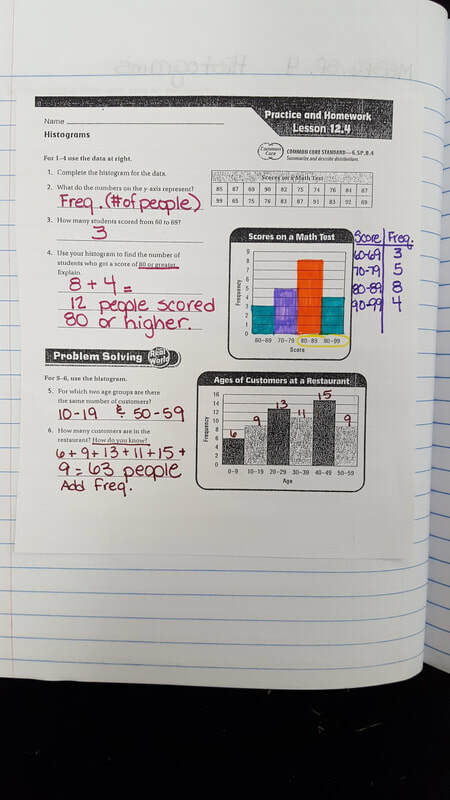 We completed a sheet over histograms with real life applications. Then, I introduced Quartiles and Box Plots. Tomorrow we'll learn how to find Quartiles. Today we took our knowledge of measures of center, range, and outliers and applied it to a tic-tac-toe choice board. Students chose 3 real life applications from 3 separate categories to complete in class. They worked on this in small groups. 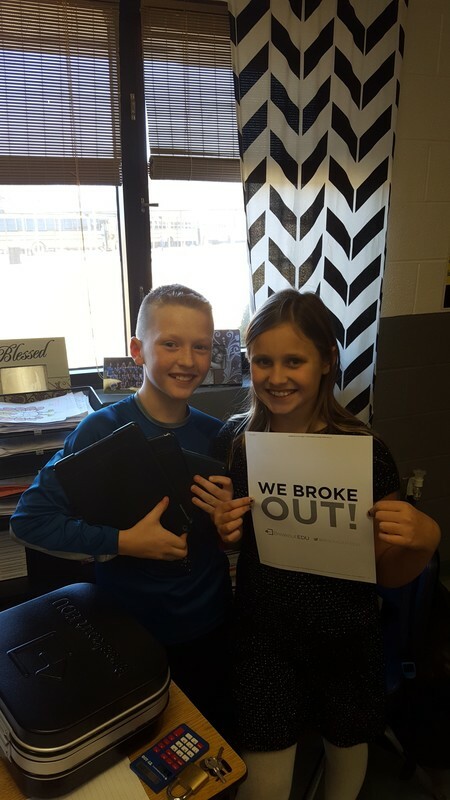 Students were able to get help from Mr. Queen and Mrs. Morgan as needed. Today we quickly reviewed line plots & dot plots from yesterday. Then, we moved on to learning about histograms. 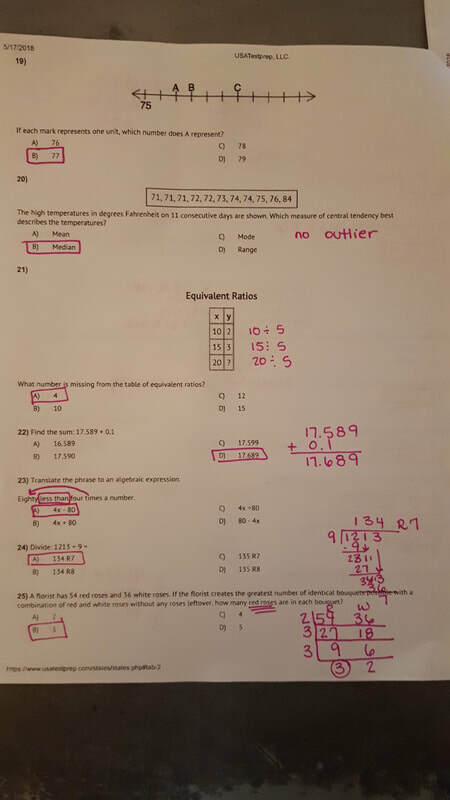 Tomorrow we'll finish up with Histograms and move on to Quartiles. 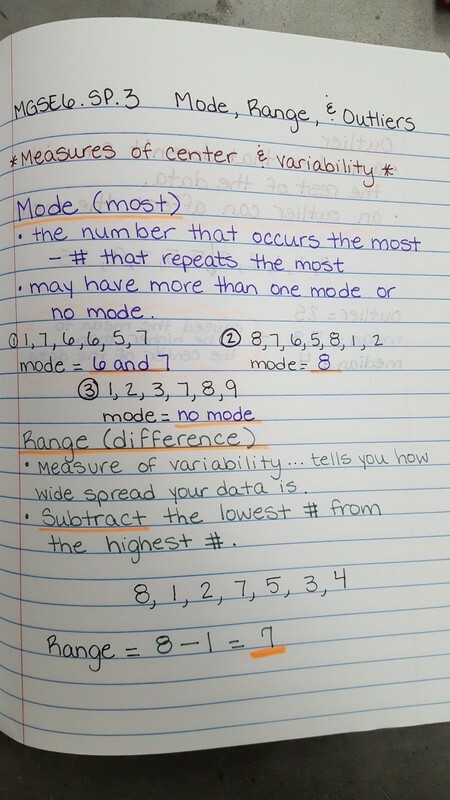 Today we finished notes over mode, range, & outlier. Then, students worked in small groups to finish the back of a practice sheet from Friday. Tomorrow students will complete a choice board. Today we quickly reviewed the content from last Thursday & Friday. Then, students learned all about line plots and dot plots. See notes below. 1st & 7th period also received a practice sheet that's due tomorrow. 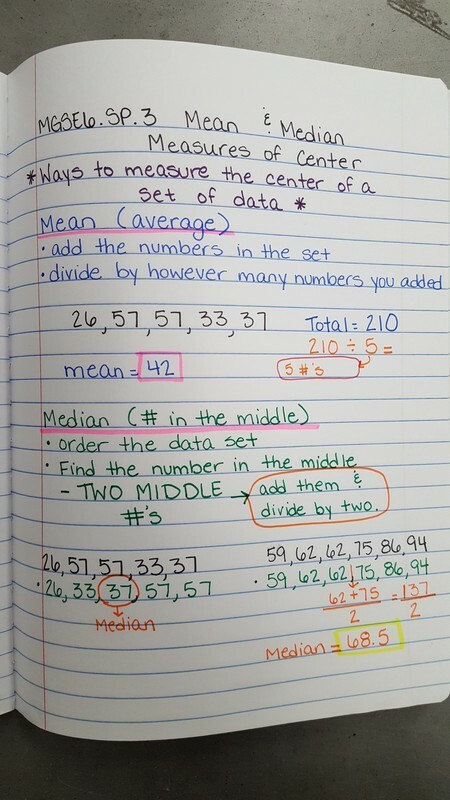 Today we reviewed finding mean and median from the notes on Friday. Then, we moved on to talking about mode, range, & outliers. We only got to begin notes today. We'll finish them tomorrow. 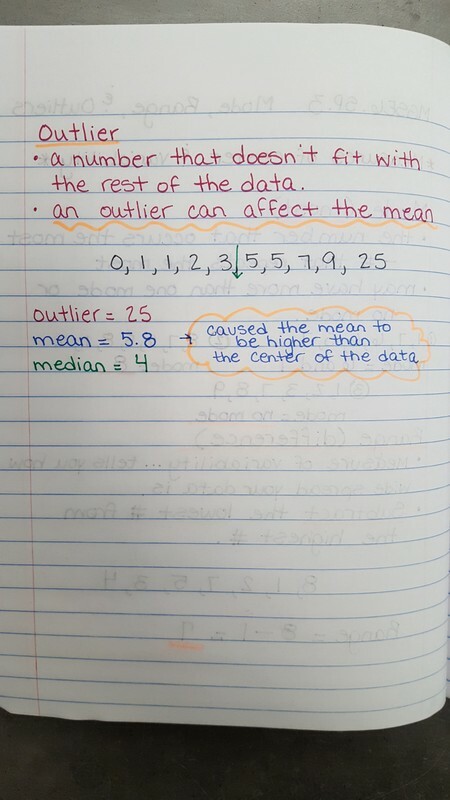 Today students learned how to find the mode, range, & identify outliers. They are to have #2, & #4 completed on the paper from yesterday when I return on Monday. Today was the Geometry Test. I will be absent the next two days. Mr. Queen will be going over Statistical Questions tomorrow and mean and median Friday. There are supporting videos posted below. Today we reviewed Tuesday night's weekly homework assignment. 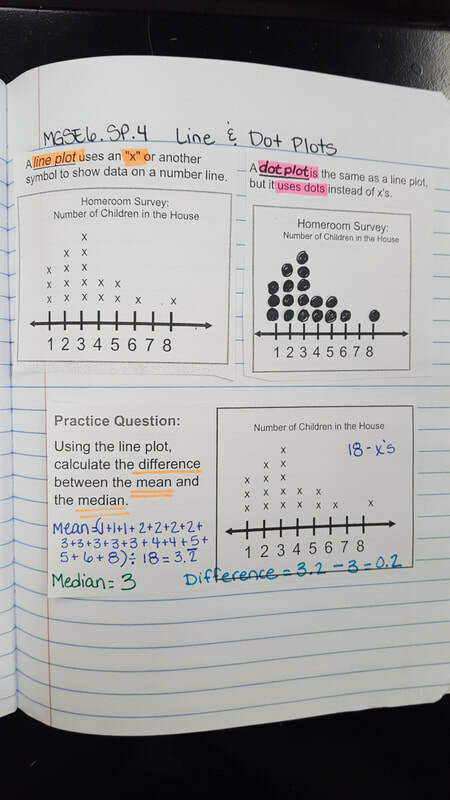 Then, students learned how to find the mean and the median. Afterwards, they practiced what they'd learned independently. We'll quickly review the practice when they come in tomorrow. 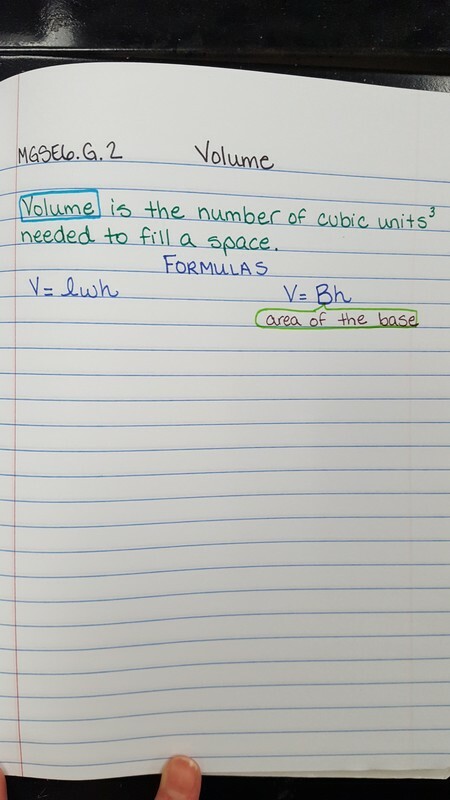 Today students finished up their Volume task from yesterday. Then, we worked out the problems on our study guides together. The test is tomorrow and will be multiple choice. Today students learned all about Statistical Questions. We discussed what statistics is and what a statistical question is. Tomorrow we'll learn about measures of center. Today we continued practicing finding the volume of rectangular prisms with fractional edge lengths. It took a few examples to get students back on track from Thursday and Friday. Tomorrow we'll be working through the study guide for Wednesday's test. The study guide can be found below. Feel free to print an additional copy. Today was Geometry Test day! 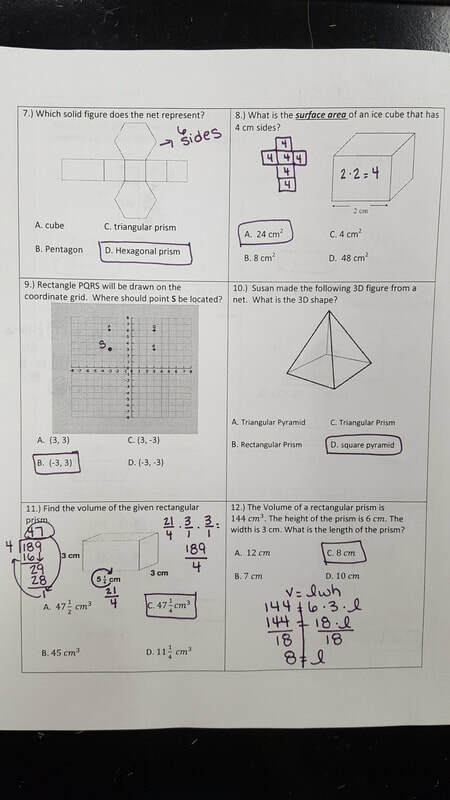 Today those who finished and turned in their homework stayed in the classroom and got to find the volume of rectangular prisms using Snap Cubes. Those who did not turn in their homework went out of the room with Mr. Queen and worked on times tables. Today we checked the Volume practice students finished last night for homework. Then, students worked on their Study Guide independently for about 10 minutes. Before the end of class we reviewed each problem of the Study guide and I went over all the answers. Test is tomorrow. Weekly homework sheet is also due tomorrow. Today we began learning all about Volume. 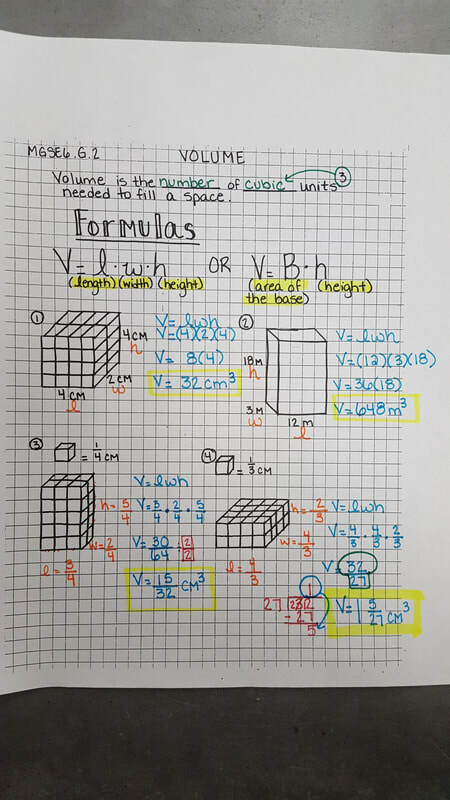 Several students remember volume from Elementary school and were able to tell Mr. Queen and I how to find it when given the dimensions. Students tried working 3 problems on the whiteboard before we even began notes! Several of them earned Rebel passes and Emoji stickers for getting the problems correct. Then, we took notes over Volume. Mr. Queen and I were so thrilled at how well everyone did with the fractional edge lengths. Tomorrow we're going to try working with snap cubes. 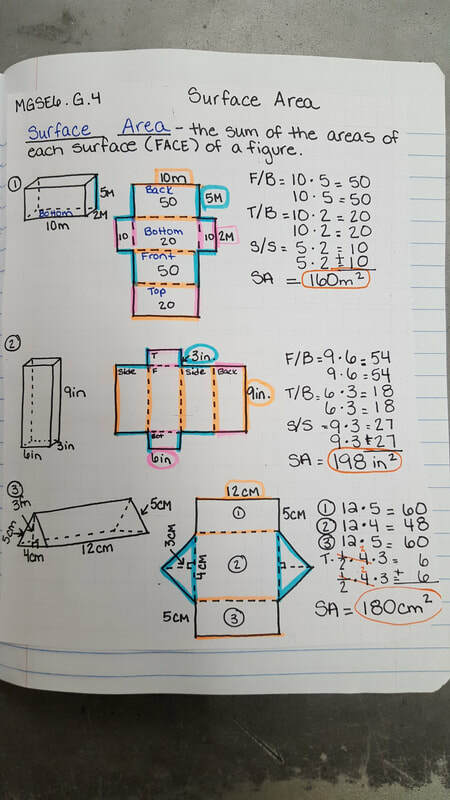 Today we finished working with finding volume of rectangular prisms with fractional edge lengths. Many students didn't finish their class work assignment and need to finish for homework tonight. Today we reviewed Geometry vocabulary, area, and surface area. Today we began learning about volume. 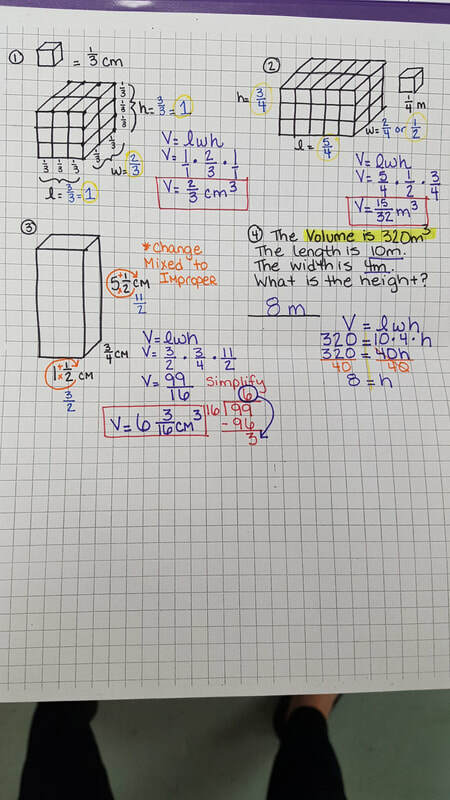 We began with a brief review of volume from last year...simple length x width x height (2 cm x 3 cm x 5 cm). Then, I showed students the difference between 5th & 6th grade volume...fractional edge lengths. We managed to almost finish notes today. We'll wrap up our notes tomorrow and then work through some good practice problems. 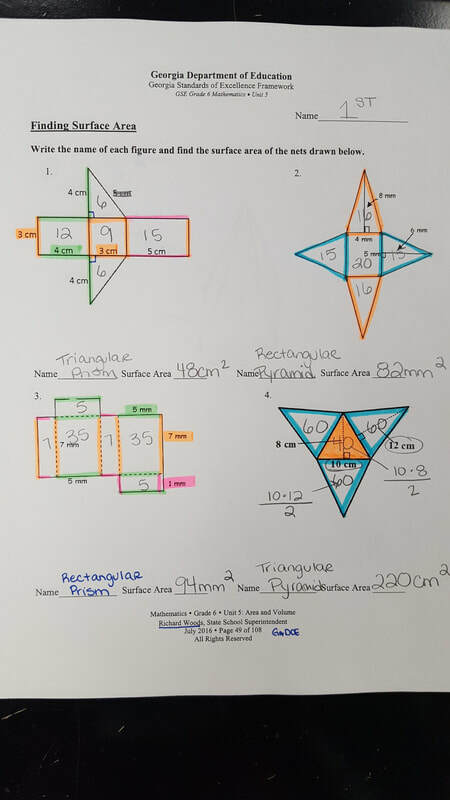 Today we finished working on finding surface area of prisms and pyramids. Students also received their weekly homework sheet today. Today we continued working with Surface Area of 3D shapes. We worked with prisms and pyramids in particular. Today we learned about Surface Area! Students did really well with this concept. See notes below. Homework sheets are due tomorrow! Today we finished learning about 3D shapes. We matched the 3D shapes with their nets and the description of their nets. We also broke them down into their faces, edges, & vertices. Then, we moved on to Surface Area. Today we got to talk about how to find the surface Area of a rectangular and a triangular prism. We mainly looked at how to break it down using small square. Review the video below. Today students continued learning about 3D shapes and their nets. We finished our Slotted notes over 3D shapes (face, edges, & vertices). Then, students worked in a group to investigate 3D shapes and their nets. Tomorrow we'll finish up our practice over faces, edges, vertices, and labeling shapes and move on to Surface Area. Today students received their Weekly homework sheet and got about 8 minutes to work on it in class as I checked notebooks. Then, we reviewed how to find the Area of Composite Figures from Friday. 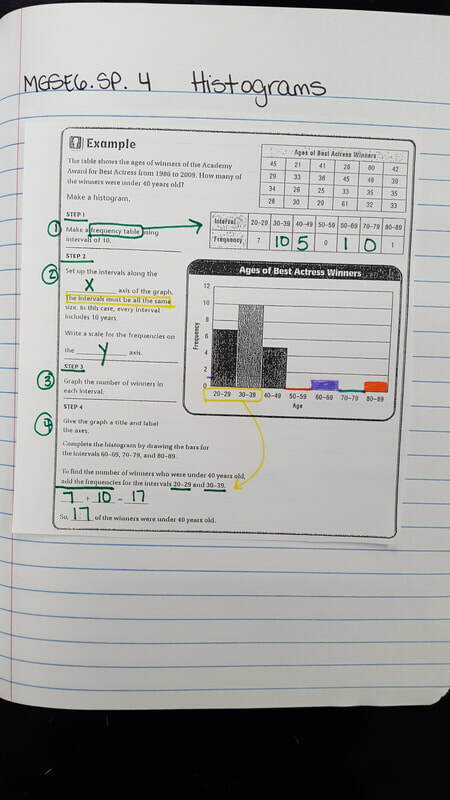 We completed our Area of Composite Figures practice sheet. In 1st and 7th period we were able to begin learning about 3D shapes (polyhedrons) and their nets. Tomorrow we'll continue our lesson on 3D shapes. 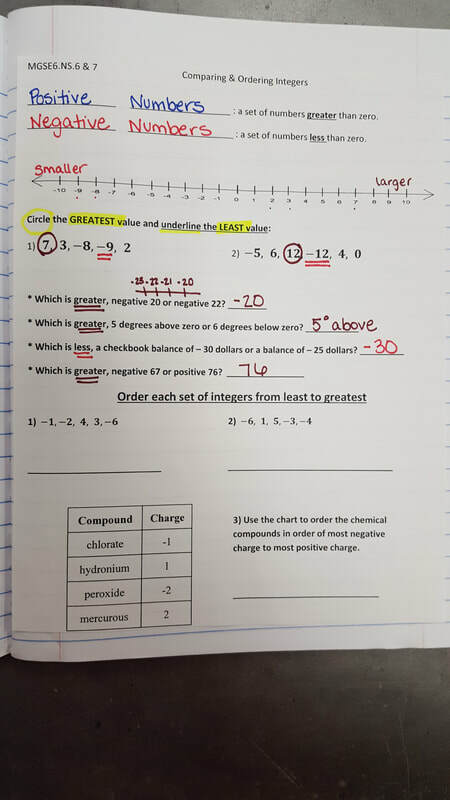 Today we finished our notes over Area of Composite Figures. 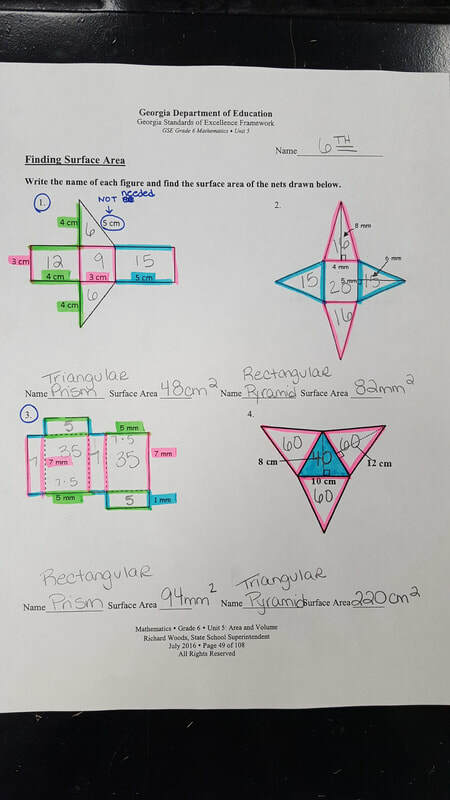 Then, students worked on a few independent practice problems over area of composite shapes. We'll recap on Monday and then move on to 3D shapes and their nets. Today we reviewed Triangles from yesterday and then moved on to Composite shapes. Composite figures are figures that are composed of multiple polygons. Below is a video of composite figures in the real world. In 1st period, we were able to work 3 examples before the bell rang. In 4th, 6th, & 7th we'll finish tomorrow. 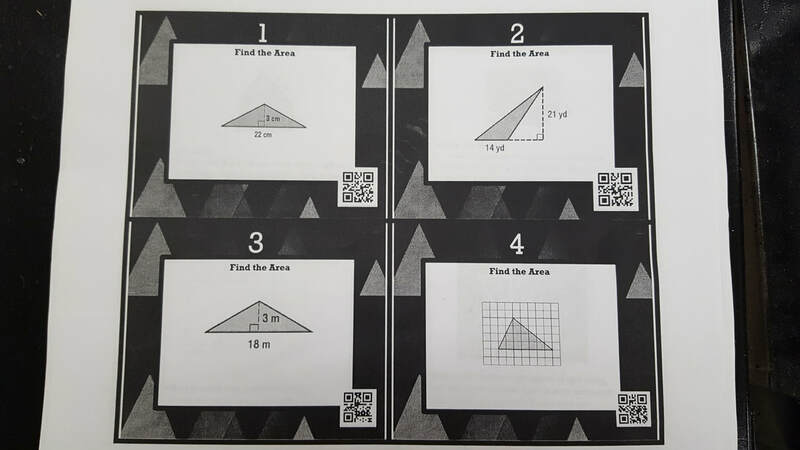 Today students continued learning about how to find the area of a triangle. Triangles can be super duper tricky. 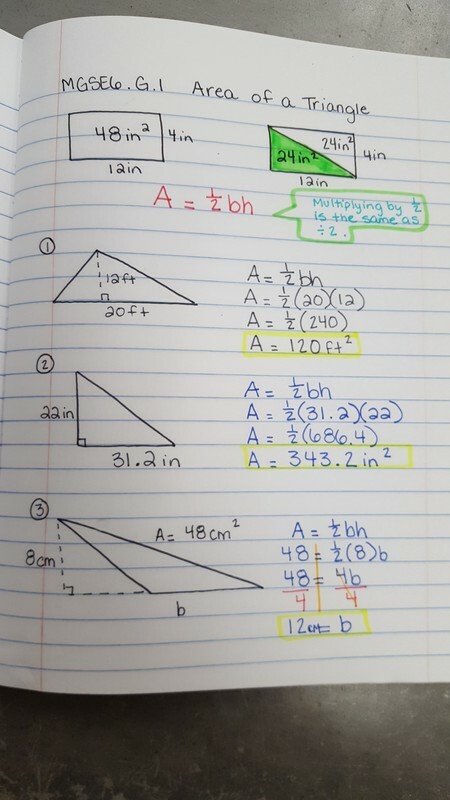 Many students often forget to take HALF when working with triangles. Today we did lots of practice to help ensure we don't forget the half. We finished notes with real world applications and then students worked with a partner on additional problems using QR codes to check their answers. Today we finished up area of rectangles, squares, and parallelograms with our practice sheet from yesterday. We reviewed the real life applications and then folded and stapled the paper in our notebooks. Afterwards, we moved on to finding the area of a triangle. The formula for area of a triangle is derived from a rectangle, because a triangle is half of a rectangle. The video below will explain more in-depth. 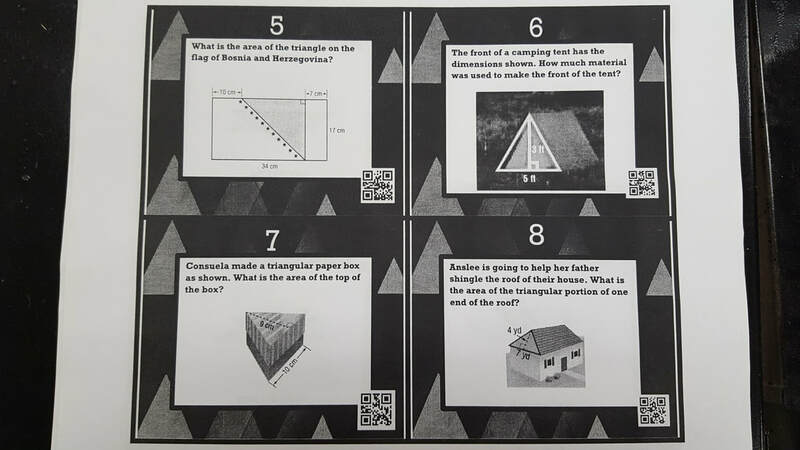 Then, we took notes and students received a "real life applications" of triangles practice. We'll treat it like the paper from yesterday and review it tomorrow and staple it in our notes. Homework: make sure Monday & Tuesday night's homework is complete. 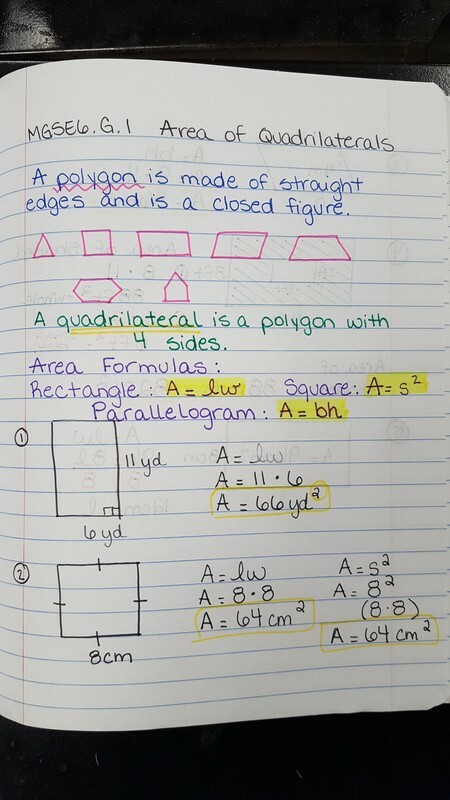 Today students are learning how to find the area of rectangles, squares, and parallelograms. Most of them remembered the shapes from elementary school, but not how to find the area. 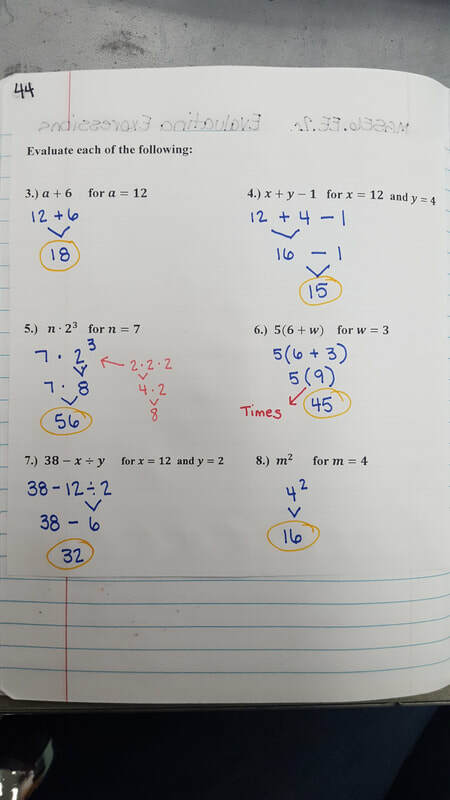 Then, if time allows they're completed additional practice problems that we'll check over tomorrow and staple in our notebooks. Also, the weekly homework sheet was sent home today! 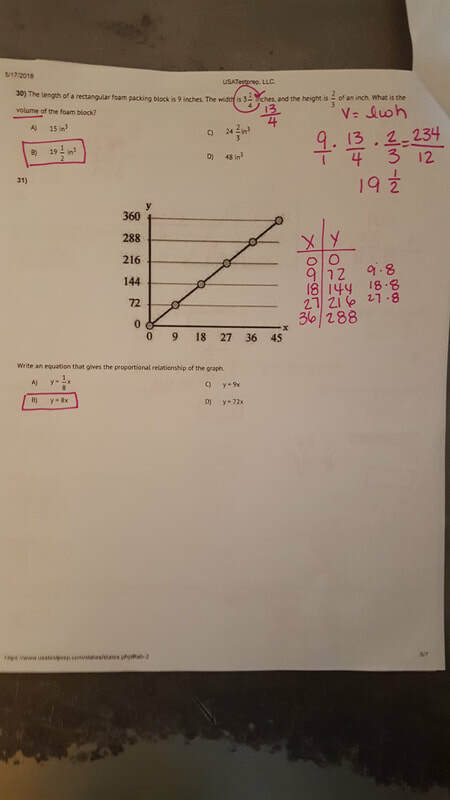 Today we graded our Solving Percents practice from yesterday and then we reviewed Percents in preparation for our quiz tomorrow. Look over your notes & study guide tonight!! Today students reviewed their homework for tonight. Then, they worked on a Cipher Wheel percent activity. Afterwards, they worked on a Percent Problems practice independently. The practice is due in class tomorrow. Percent Quiz is on Thursday. Today students received their weekly homework sheet. They were given about 3 minutes of class to work on Monday night's problems & ask questions. Then, several students received "Progress Reports" of their current standing in math class. MANY MANY students are missing assignments due to being absent. Please have all work turned in by Thursday, February 15th! Then, we moved on to learning how to Solve Percent problems where the percent or the whole number is missing. We took notes after watching about 4 minutes of the Math Antics video below. Tomorrow we'll do a Cipher Wheel Activity with percents with partners. 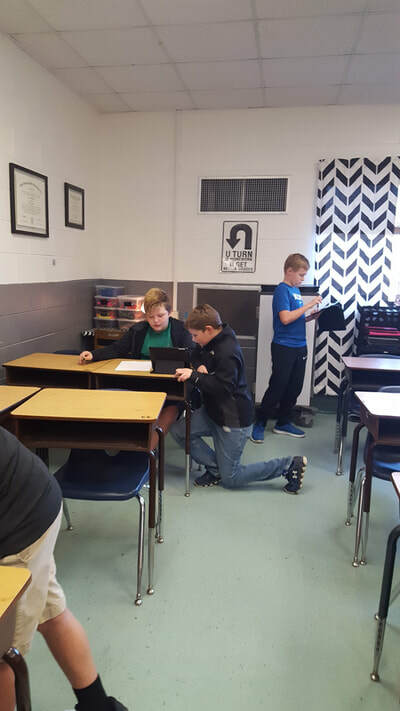 Today students continued practicing Percent of a number through real world applications. 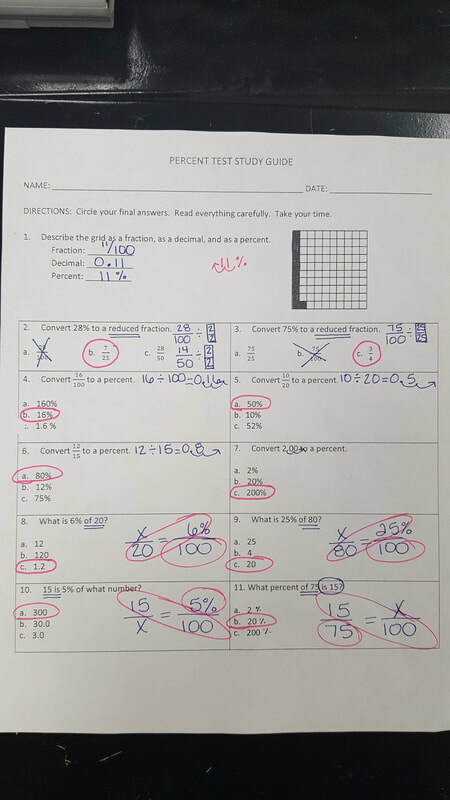 We began class by grading our weekly homework sheet (1st, 6th, & 7th periods) and then graded the Percent of a number practice from yesterday. Afterwards, we worked through an interactive flipchart with real life applications. Monday we'll staple those problems into our notebooks. 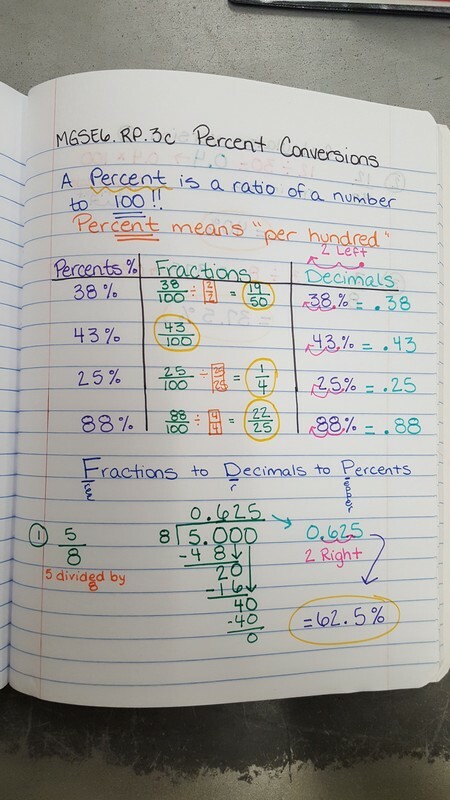 Today students learned how to find percent of a number. They learned how to do so through the use of a very handy proportion formula. The formula is designed to help when the part, whole, or percent is missing. 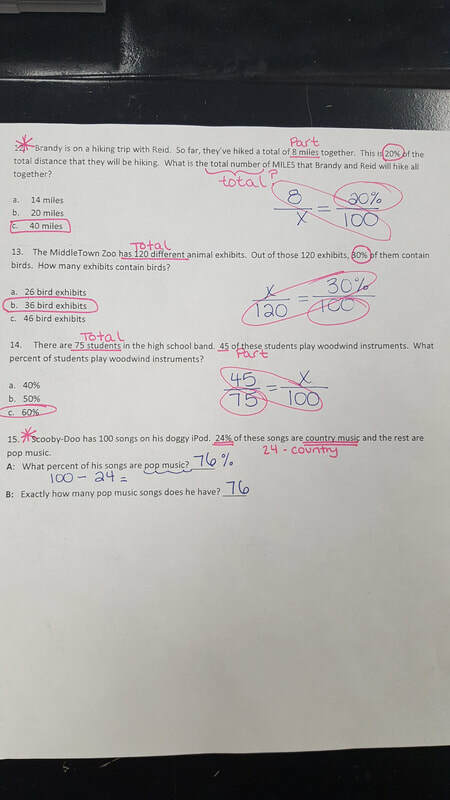 After notes, students were required to complete #1- 10 of the practice paper. Those who did not finish will need to finish up at home tonight. 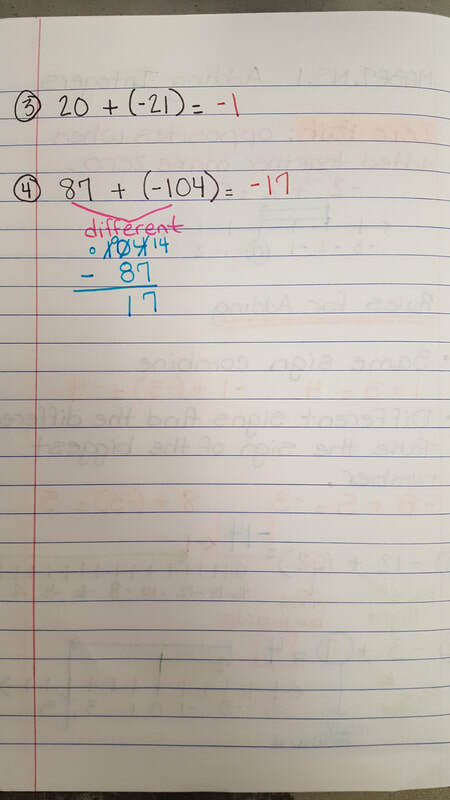 Today students turned in their homework from last night over converting percents to decimals and to fractions. I was VERY disappointed that several of my students did not complete their homework...especially when about 3 of their problems were in their notebooks. Those that did not turn the assignment in are to finish tonight and turn it in tomorrow. They will have 10 points counted off for being late. Then, we played a matching game with partners. Students were given 6 minutes to work with a partner to try and match the correct decimal, percent, & fraction. 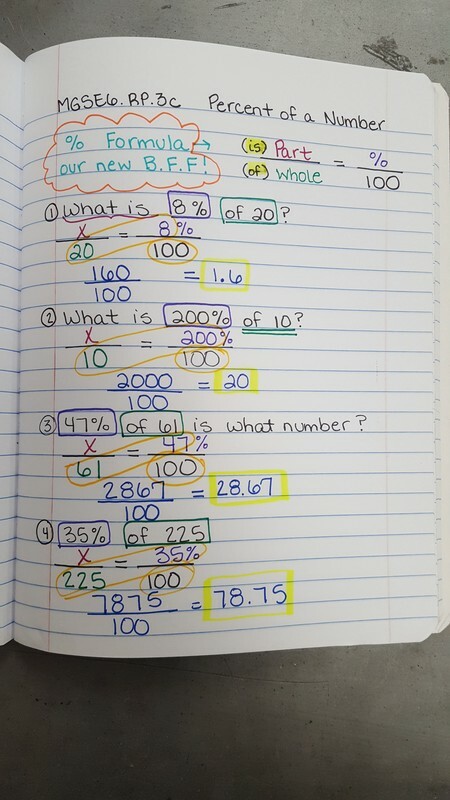 Then, we moved on to learning about how to find percent of a number. Today students continued converting percents. They learned how to take a fraction and make it a decimal and then turn a decimal into a percent today. Students need to finish their class work at home tonight. Today students learned about Percents. We began with their current knowledge of percents. The class completed a Circle graph of what they already knew. Then, we moved on to a flipchart that focused on concrete examples using a 100's grid. Afterwards, we took a few notes. 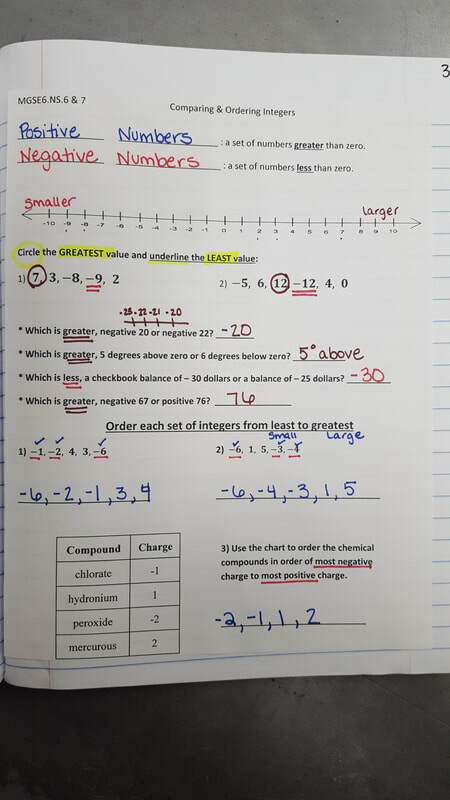 Tomorrow we'll go back to the flipchart for review over converting percents to fractions and to decimals. 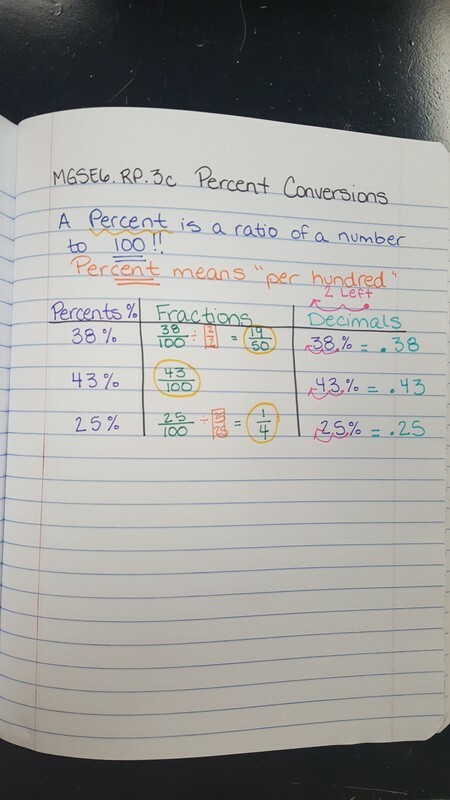 Then, we'll learn how to convert a fraction and a decimal into a percent. Today students worked with a partner to complete a Grocery Shopping activity. Tomorrow we'll finish and complete our study guide. Today we continued learning about Unit Rates. 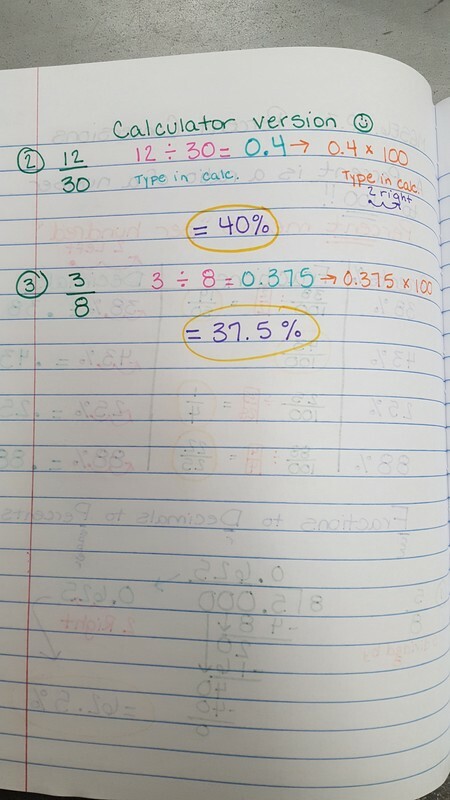 Students worked through a Unit rate paper. 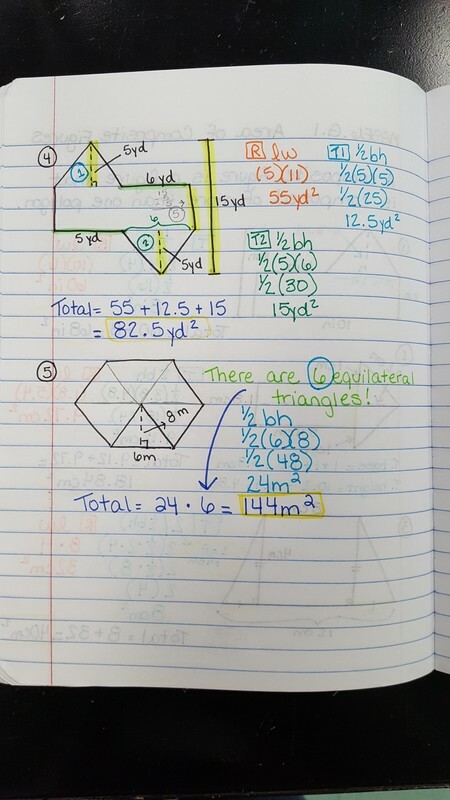 Today we wrapped up our lesson from Friday over Proportions. Then, we moved on to Rates. 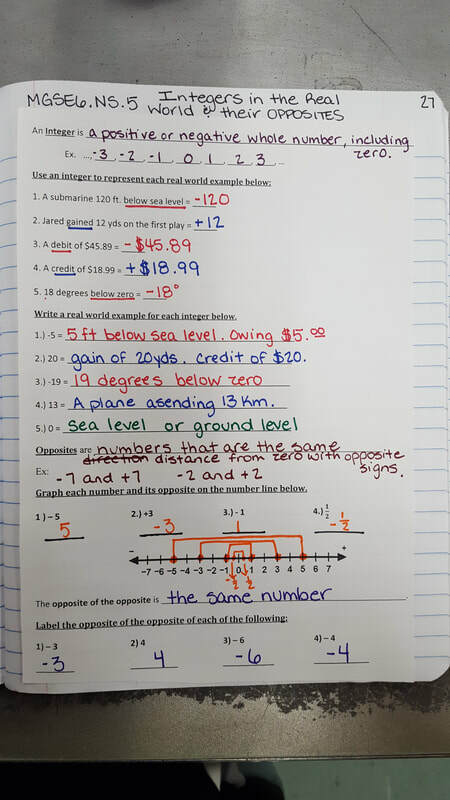 Students have actually been learning about rates through Proportions and didn't know it. We watched the Ratey the math cat video and then took notes over rates. Students should complete The problems that are set up on the Unit Rate Riddle Sheet for homework tonight. Weekly homework sheet went home today! It's due on Thursday of this week. We'll have a Unit Test on Friday. Today students reviewed proportions from Friday. 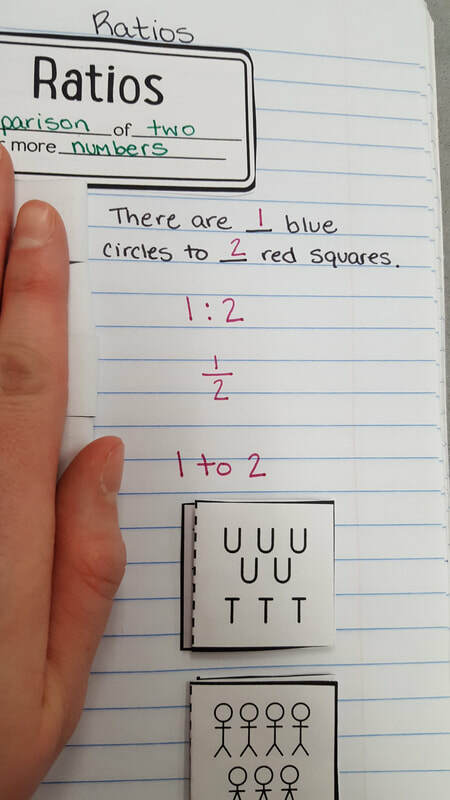 Then, we stapled our Proportion word problems paper into our notebooks. Afterwards, we moved on to rates and unit rates. Students watched Ratey the math cat (see below) and then took notes over rates. Tomorrow we'll continue with Unit rates. No weekly homework sheet this week. Today students continued learning about Proportions. We learned how to work with Proportion word problems. 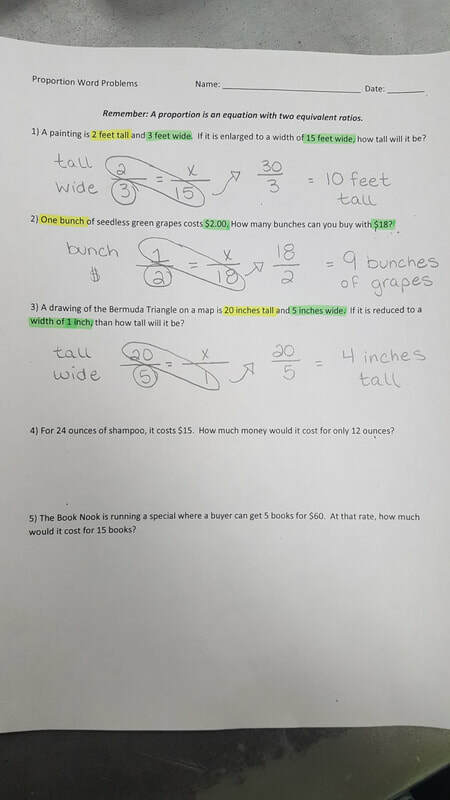 Students learned how to find the two main things we're comparing in each proportion problem. Then, we used our highlighters to help guide us in the set up process. 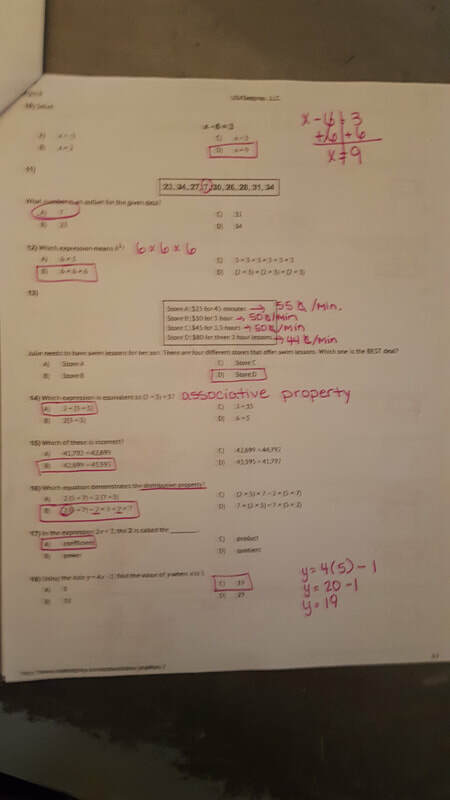 Today students turned in the sheet they had for homework last night after we worked through another sample problem. I also gave them 5 additional minutes to double check their work. Then, we moved on to Proportions. Proportions are an equation with two equivalent ratios. We worked through a flipchart and then took notes. We'll continue learning about proportions tomorrow. Today we went over our homework from last night and then finished the paper. Then, 1st & 4th period chose to turn the paper in as a formative assessment. 6th & 7th periods stapled them into their notebooks. Afterwards, students were given a paper titled, "Ratio Tables and Graphs". This paper has 3 problems on it involving tables and graphs. Students began working on the paper in class and are to finish it for homework tonight. Today students continued working with equivalent ratios. We learned how to compare ratios in order to determine which are equivalent. Then, we moved on to learning how to graph equivalent ratios. 6th period: Complete #1-10 for homework tonight. 7th period: Complete #1-5 for homework tonight. Today students turned in their weekly homework sheet from last week. I did not assign a weekly sheet for this week. We are incredibly behind on our lessons. Therefore, any class work that isn't completed will go home and need to be completed and turned in the next day. Today we quickly reviewed Ratios & moved on to learning about Equivalent Ratios. Students learned how to apply equivalent ratios to ratio tables. We used ratios of certain colors of paint to achieve understanding of the concept. 1st Period: We're just a bit ahead in this class. 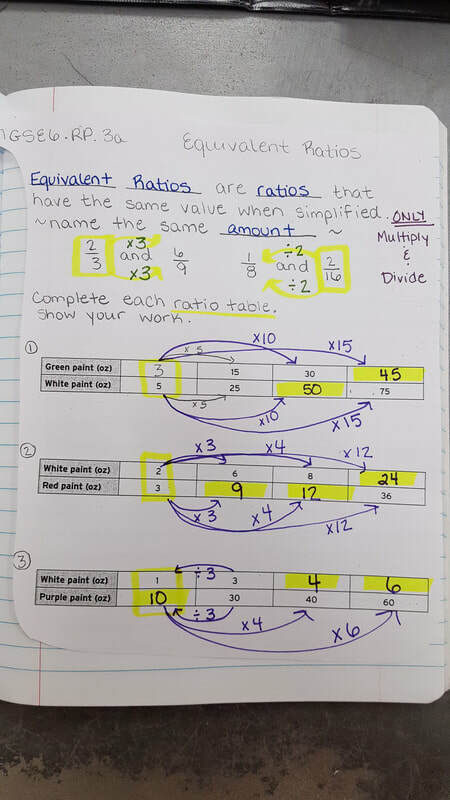 Students recapped "Ratios" from Friday. Then, completed a "Fruit Loop" Ratios activity. 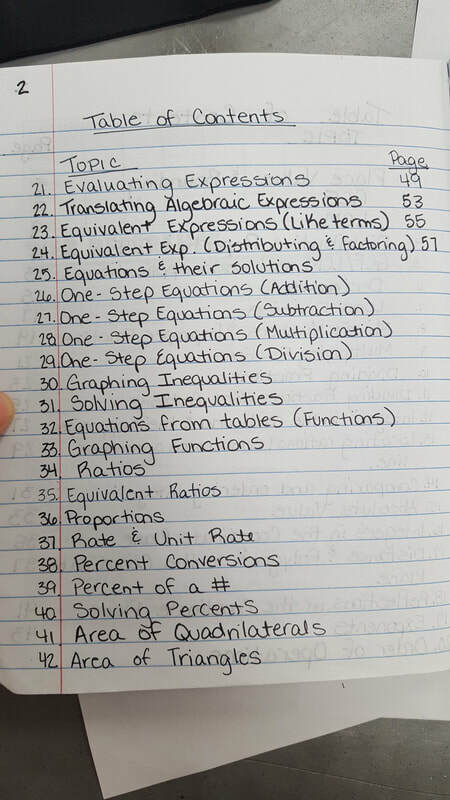 4th, 6th, & 7th periods: Today students took notes over RATIOS! Which means they also learned what ratios are and how they're used. They also received their weekly homework sheet that's due on Friday! Due to time--> 7th period will need to cut/paste their notes in at home. NOTES ARE POSTED BELOW ON FRIDAY'S DATE!! Today students wrapped up functions and we moved on to Ratios after checking this weeks homework sheet. Ratios are the comparison of two or more numbers. We began with the simple ratio of boys to girls in the class. Students also watched both videos below and we pasted a foldable into our notebooks. Today we finished working through Backwards functions and then students completed a review over functions for a grade. Homework Sheets were also turned in today. Today students learned how to work backwards functions. We worked several together and then they worked with a partner on as many as they could in about 6 - 8 minutes. Tomorrow they'll be given a few more minutes to finish up independently after we check our homework. 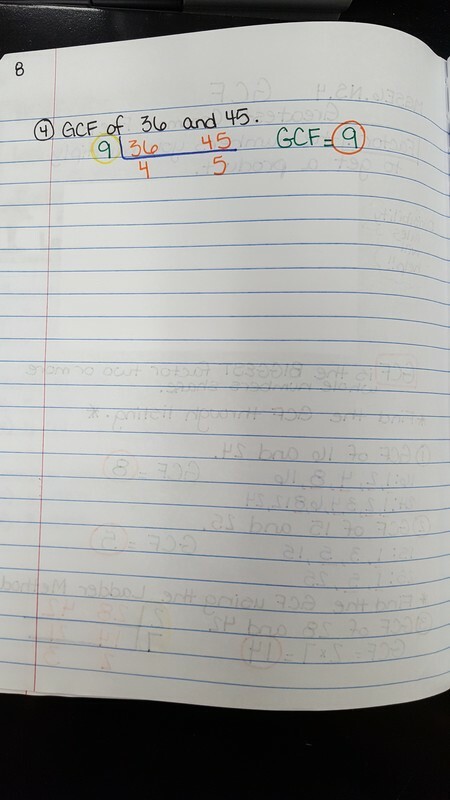 Then, students completed an assignment in USATestPrep. Please encourage your child to work through USATestPrep at home. Today students learned how to take an equation set equal to y and use a function table of x values to find the y values. Once they completed the table they then turned their x and y values into Ordered pairs and graphed them on a coordinate plane. 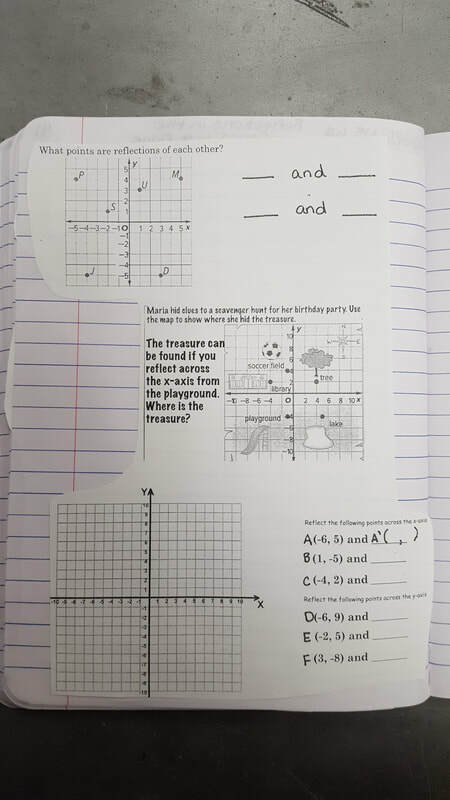 We finished our notes over graphing functions and then students completed a practice sheet (continued notes) with a partner of their choice. Tomorrow we'll look at "Backwards functions". Today students received their weekly homework sheet. 1st & 7th period are both required to complete Monday night's problems as well as the rest of the weeks. However, 4th & 6th period are not required to complete Monday night's problems. Today students finished reviewing function tables from Friday's lesson. As soon as we wrapped up with our lesson over function tables we watched a brainpop video about graphing linear functions. Today were are reviewing functions! We learned all about functions and function tables prior to the Christmas break. However, as most know when we're out of school for 2 weeks everyone forgets almost everything; hence, the review! Today we'll be reviewing function tables with a partner activity. Then, partners will work on an independent function table assignment. Monday and Tuesday we'll conquer graphing functions. Today students will be working through their Mid-Term study guide while called up individually to learn whether or not they're exempt from Mid-Terms. Today we went to see the Movie, "Wonder", and then had our 2nd 9 weeks Reward Day from 1:00 - 2:55. SNOW DAY! We'll grade our homework sheet on Tuesday! You have no excuse not to have it completed. Today we continued working with Function tables. 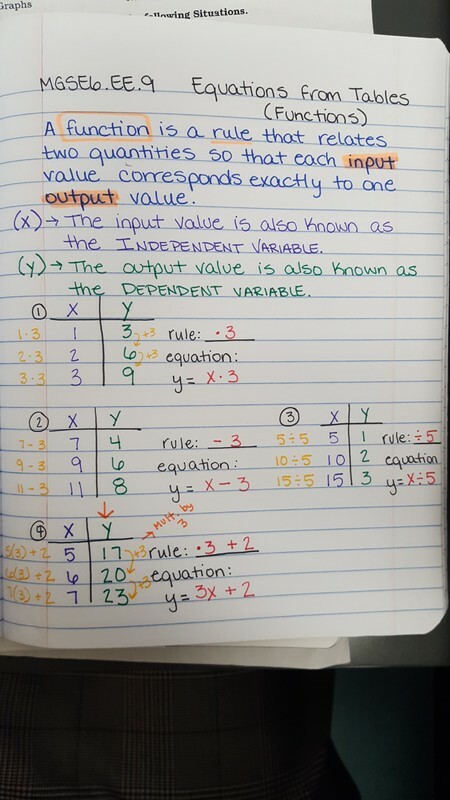 Students illustrated their understanding of how to derive equations from a table of input and output values. 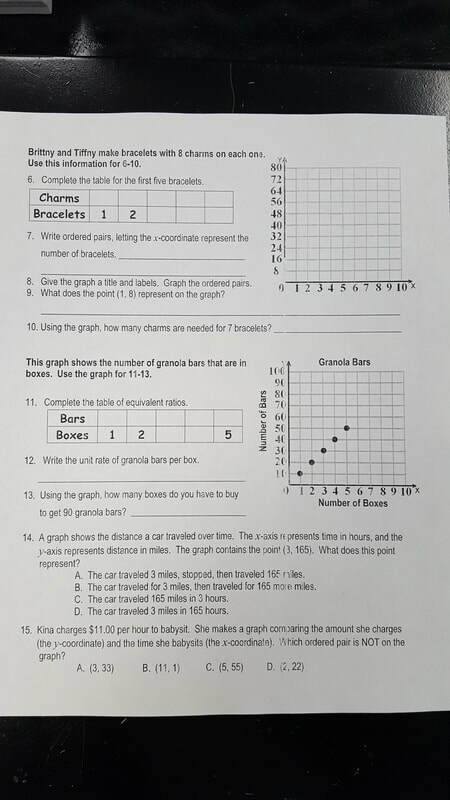 Tomorrow we'll do a partner activity and discuss graphing functions. Today students learned about functions. They specifically learned how to derive equations based on a rule they discovered from a table of x and y values. See notes and video below. Today students took their Unit test over Equations and Inequalities. 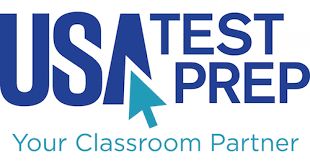 Those who are not too thrilled with their test grade may login to USATestPrep in their spare time and work through the standards we've already covered. Their goal is to turn all the dots GREEN under the Number Systems category and the Expressions & Equations Category. Today we reviewed for our Unit Test over Equations & Inequalities tomorrow. Students were given a study guide to work through independently. Then, we went over the answers. After answering in class, students got into groups and played a friendly game of Battle Royale. Today students continued working through solving inequalities. 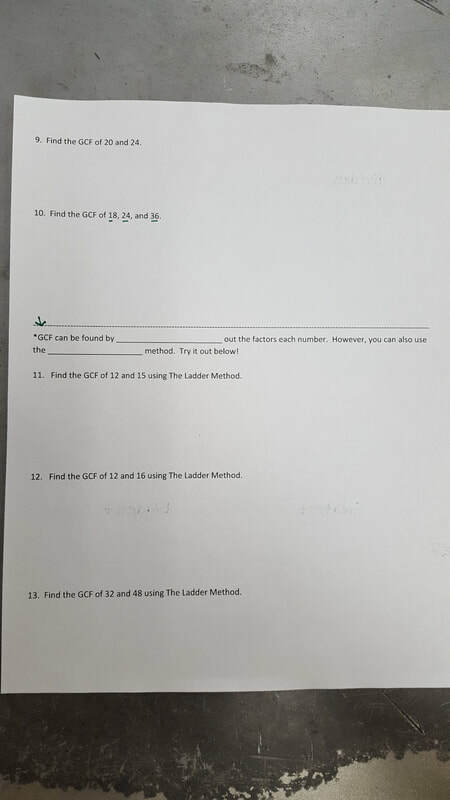 They worked on an independent practice sheet today. Those who did not finish in class will need to finish and turn in this weekend. Today students continued graphing and working with real life inequalities. 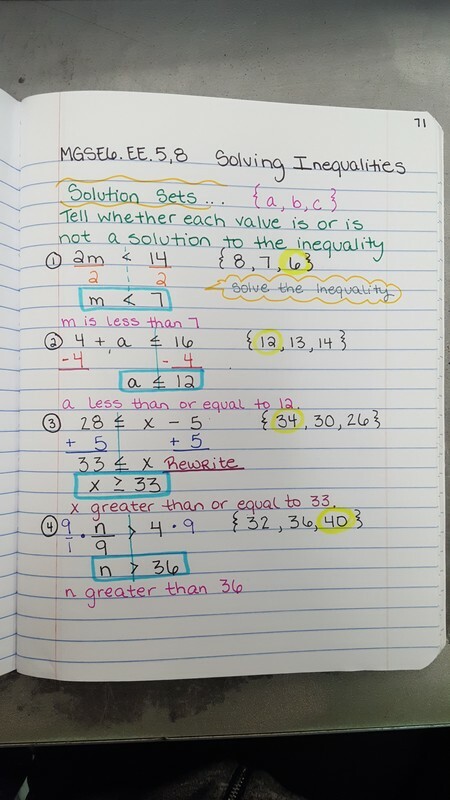 1st and 7th period were able to move on to solving inequalities and using solution sets. Homework sheet is due tomorrow! Today we continued learning how to graph simple inequalities on a number line. Students looked at inequalities in the real world today...such as "Jude needs at least $50". Some students did not finish in class today. Those who didn't finish must finish for homework tonight! 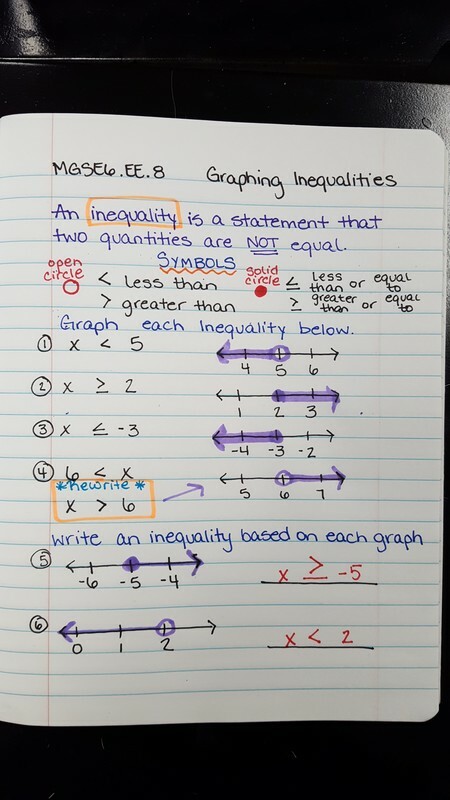 Today students learned about inequalities. We began by watching a Discover Edu video about using inequalities to represent speeds of roller coasters. Then, students learned how to take what we'd learned and represent it on a number line. Today students got to participate in an interactive digital breakout. Only two groups throughout the day broke out on time! They used their knowledge of Expression and Equations to solve a series of puzzles put before them. Their goal was to unlock all the locks and uncover the 3 missing I-pads before time ran out. 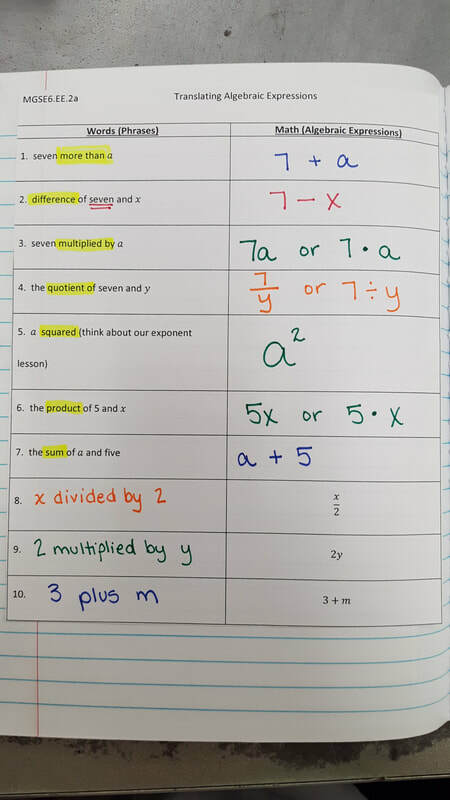 Today students turned in their mixed equations sheet. Then, they worked with a partner or by themselves to solve a series of equation QR codes around the room. Tomorrow is a half day! Weekly homework sheet is due tomorrow! 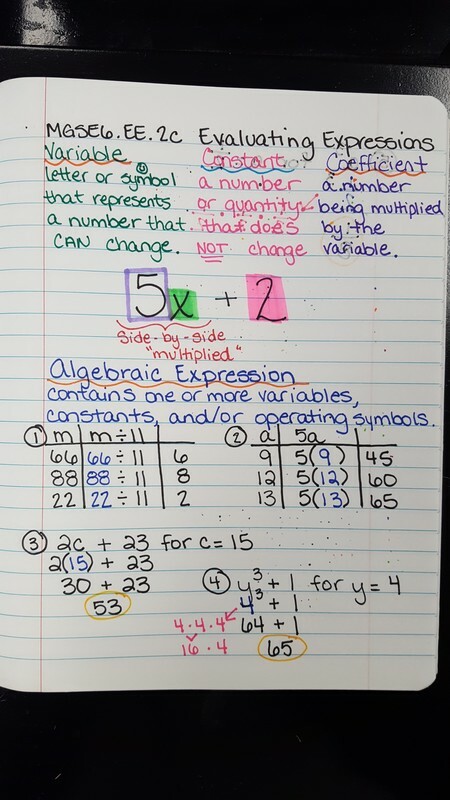 Today students finished notes over multiplication equations. They learned about "Multiplicative inverse" by watching a video located under the "Math Videos & Games" button at the top of the page. Then, we practiced what we'd learned. Today we split into small groups after reviewing tonight's homework problems. 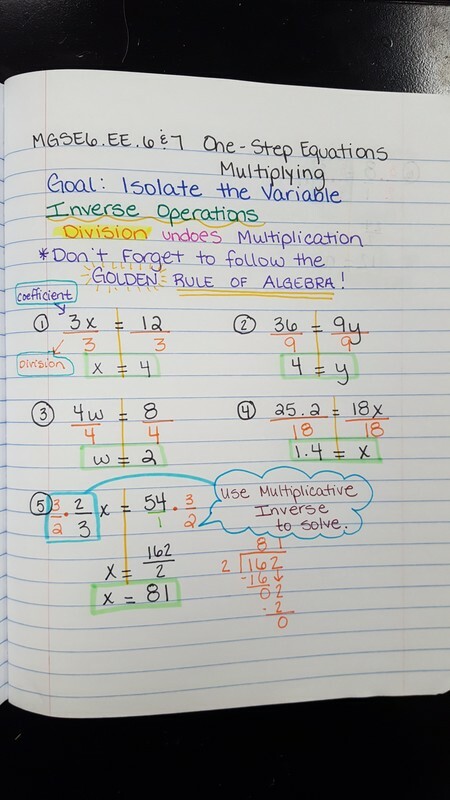 In small groups students took notes over "one-step multiplication" equations. 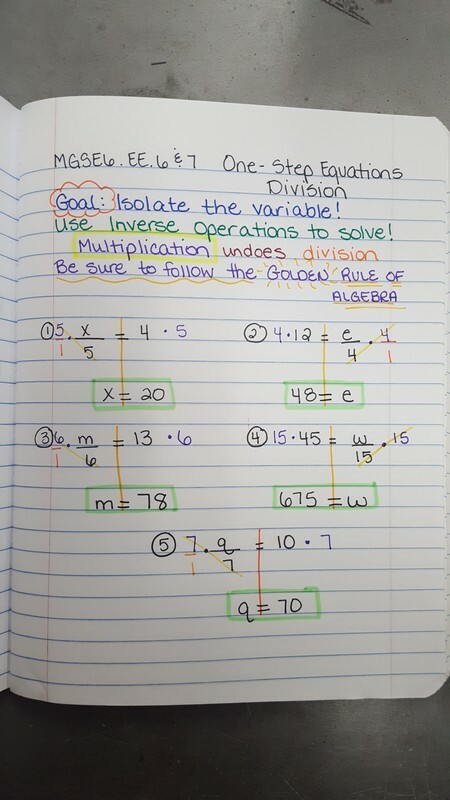 We'll practice tomorrow and learn about division equations. Today students were reminding of items they owe from last Wednesday, Thursday, & Friday while I was absent. It seems SEVERAL students did not turn items in when they were supposed to. Then, we moved on to one-step multiplication equations. We'll finish our notes tomorrow and practice what we've learned. Today students practiced what they'd learned from last Friday about subtraction equations. Weekly homework sheet is due on Thursday of this week! Today will be quite a hectic day with a crazy schedule. Today is the Veteran's Day Program. Due to lunch being scheduled from 11:50 - 12:20 and students heading down to the program around 12:30 some students may not even make it to math class today. 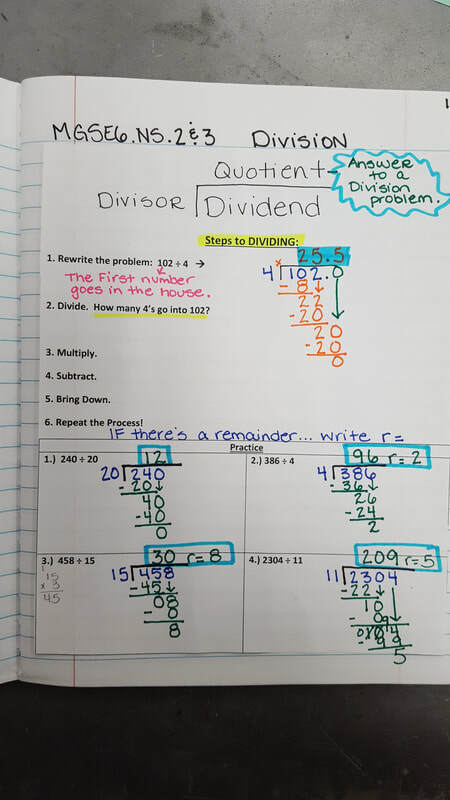 Those that do attend class will be working independently or with a partner to continue reviewing one-step addition and subtraction equations. The answers to each equation will tell them what color to color certain parts of the turkey picture on the back of the paper. 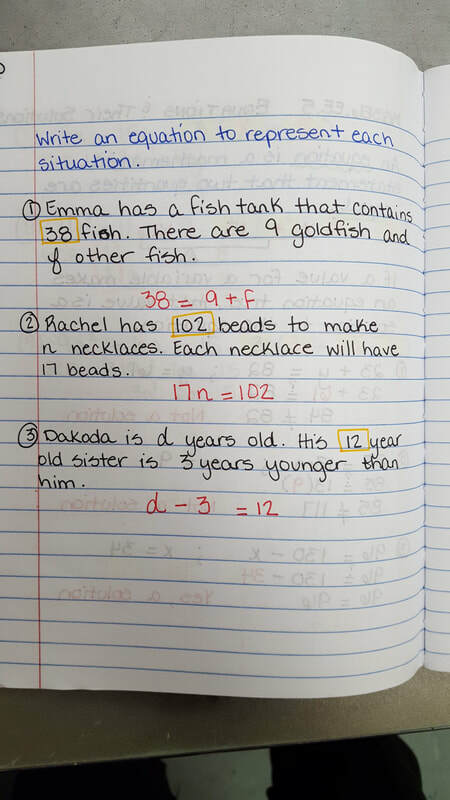 Today students took notes over subtraction equations after they finished with their small group work from yesterday. 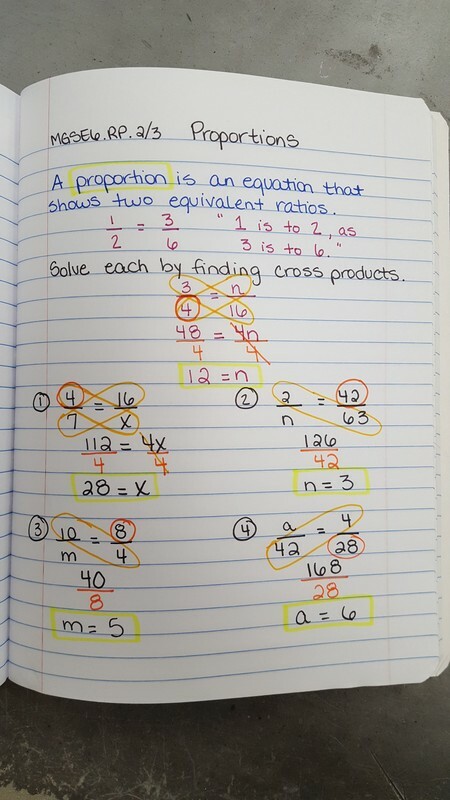 Due to completing work from yesterday and taking notes, we'll practice subtraction equations on Monday in class. Today Mr. Brantley had to fill in for me. I apologize for any inconvenience this may cause. My original sub bailed on me at the last minute and I had to take what I could get. Students should be working with a partner today on an addition and subtraction equations activity. Afterwards, they'll work independently to complete a mixed equations sheet over the same type of equations. Anything not finished in class must be completed for homework. 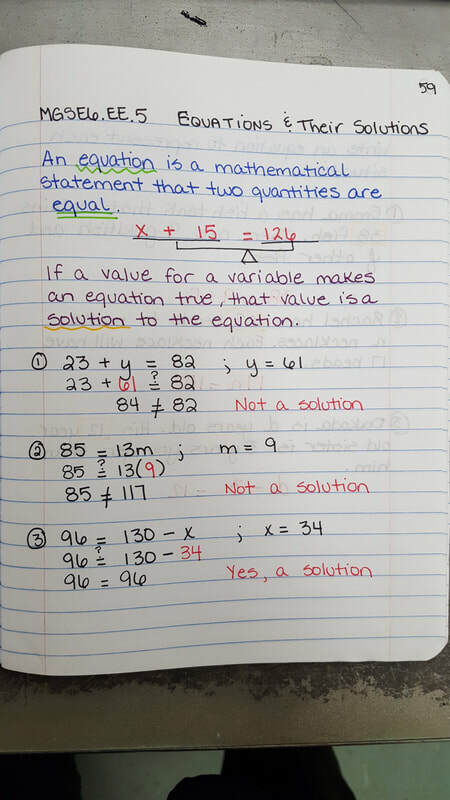 Today students will learn how to solve one-step addition equations. Mr. Queen will be guiding them through the notes after they watch the remainder of the video from yesterday. 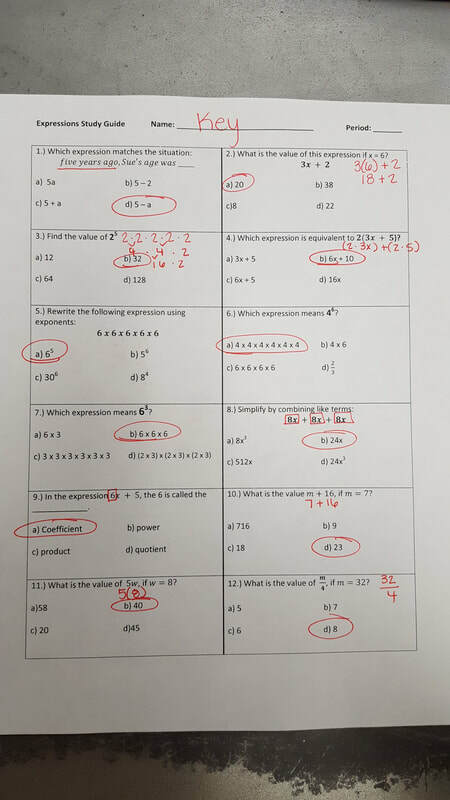 Afterwards, they will split into small groups and begin to complete a practice sheet with the same type of equations and 2 real-world application equations. Today students should have turned in their homework from last night. Then, they took notes over one-step subtraction equations. Afterwards, they received a practice sheet to review their notes. Mrs. Tonti was here as my sub to help them. Unfortunately I am gone to a Technology Conference for the remainder of the week. Today students learned all about equations and how they must remain balanced. They also learned the difference between expressions and equations. 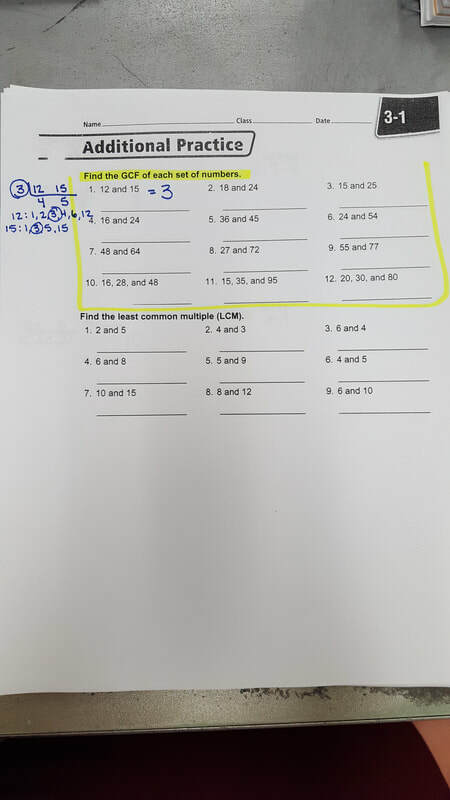 After notes, students split into small groups to complete #1-21 ODD of a practice paper. Today students learned how to solve simple one-step addition equations. 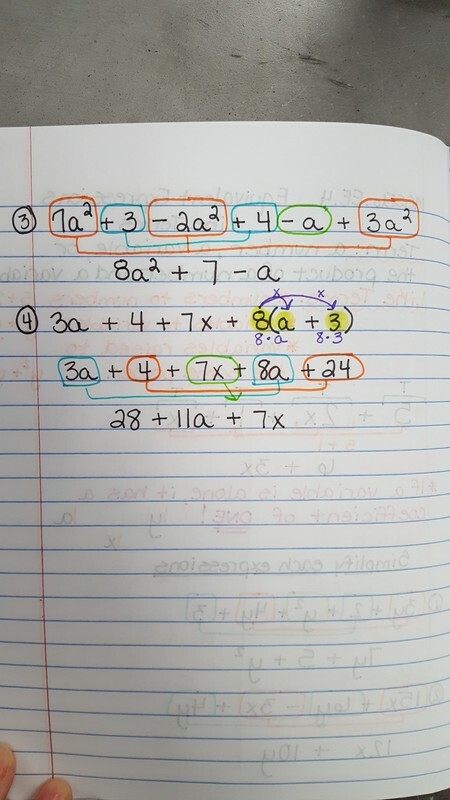 We took notes and students received a practice paper over nothing but addition equations. They are to complete #1-9 for homework tonight! Today students took their Unit Test over Expressions. Today students began learning about Equations. They learned how important it is for equations to maintain their balance. We began our lesson with a brief video clip of Nick Wallenda tight-rope walking across the Grand Canyon to illustrate the importance of maintaining balance. Then, we moved on to Equations and their solutions. We took notes and then completed a practice sheet in class. ​No weekly homework sheet this week. Today students completed their Study Guide for tomorrow's test. Then, the small group with me got to play a quick review game with their group. The group with Mr. Queen worked on missing assignments. See last Wednesday's post for the key to the study Guide. Today students completed their Math Benchmark through USATestPrep. Today we graded our weekly homework sheet. Then, we quickly reviewed the study guide from yesterday prior to the test. Afterwards, students took their Expressions Unit Test. In 1st and 7th period we had enough time after the test to play "Battle Royale". Tomorrow is the math benchmark! Today students had 5 minutes to finish up their weekly homework sheet. Then, they turned them in. We split into our small groups again from yesterday to finish up with factoring. After finishing our factoring practice students had about 10 minutes of "Free I-pad" time prior to working through the Unit Study Guide. Then, we began working through the study guide. You may print our own copy of the study guide from the file above. My group only had time to work through #7. We'll finish up on Monday and then play a fun review game. The test will be on Tuesday of next week. Today we reviewed tonight's homework problems. Then, students turned in their Practice from yesterday if they didn't finish in class yesterday. Afterwards, they received a hard copy of their study guide for tomorrow's test. We went over the study guide and they got all the answers. Then, we played a fun interactive review game called, "Battle Royale". Remember to study for tomorrow's test!! Today we reviewed tonight's homework problems. Then, we split into small groups to finish learning about factoring and to work more in-depth with the concept. Tomorrow we'll continue our Small group work and wrap up our unit over expressions. The unit test will be on Tuesday! 1st, 6th, & 7th period: Today we reviewed Tuesday night's weekly homework problems. 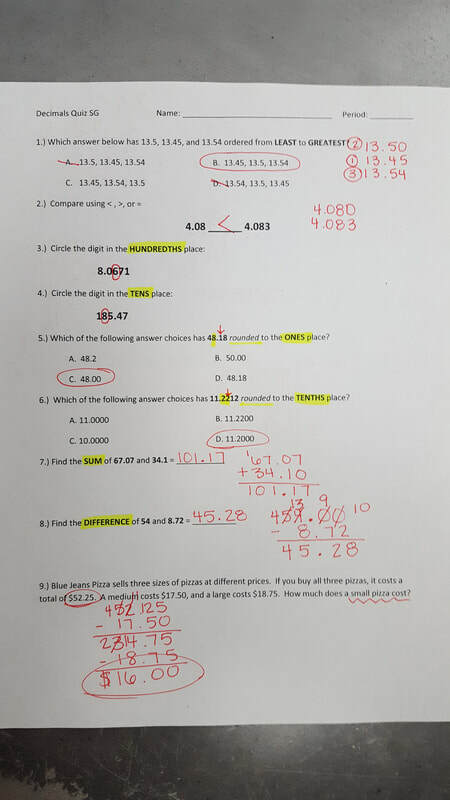 Then, we checked and went over the additional #1-12 on the Distributing practice paper from yesterday. 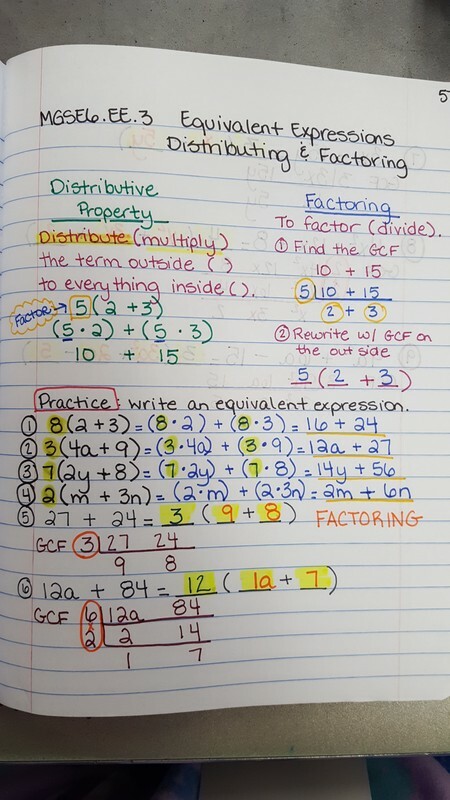 Afterwards, we reviewed factoring from Unit 1. In Unit 1 we factored out the GCF and used it to illustrate the sum of two numbers. In our Expressions Unit we'll use it to create equivalent expressions. I posted a few videos below to help. 4th Period: Today students did not have a warm-up at the beginning of class. Instead we utilized the first 10 minutes of class time so that they could work on assignments they owe Mr. Queen and I. Each student also left class today with an itemized report of everything they've received a grade on in our class this 9 weeks. Many students have failing grades in class currently due to missing assignments. Please ask your child about their print out and their completed or missing assignments. Afterwards, we continued learning how to use the Distributive property from yesterday's lesson to create equivalent expressions. After working together on several problems students then worked independently and one-on-one with Mr. Queen or myself to get the remainder of the problems finished. Prior to the end of class we came back together to check the problems and paste them in our notebooks. At the end of class we had a quick 5 minutes to preview tomorrow's main topic...Factoring. Today students recalled the Distributive Property from Unit 1. 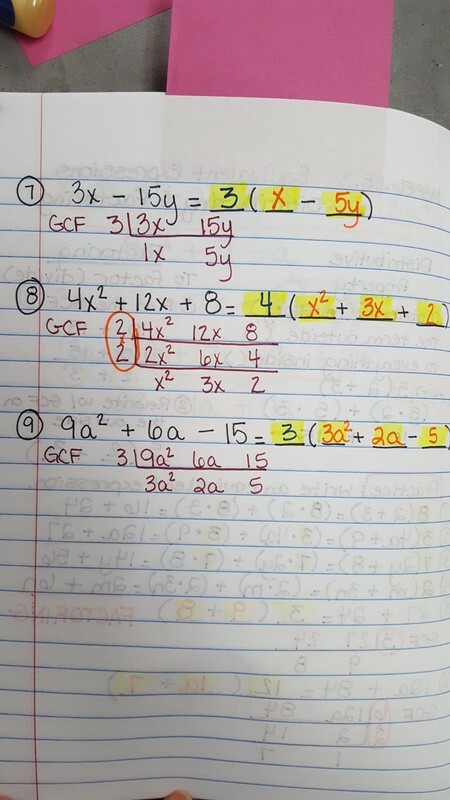 However, in Unit 1 we primarily used it for rewriting the sum of two numbers by factoring out the GCF. 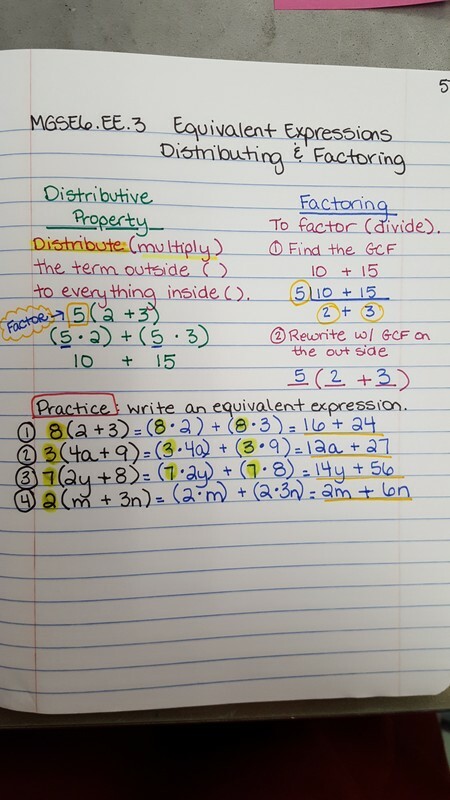 This time students will be applying the rules of the property to distribute and to factor in order to create equivalent expressions. This is the last standard in this Unit. We are hoping to have our Unit Test on Thursday of this week. Students also received their weekly homework sheet. This weeks sheet only has 3 night's due to Thursday's test and Friday's math benchmark. 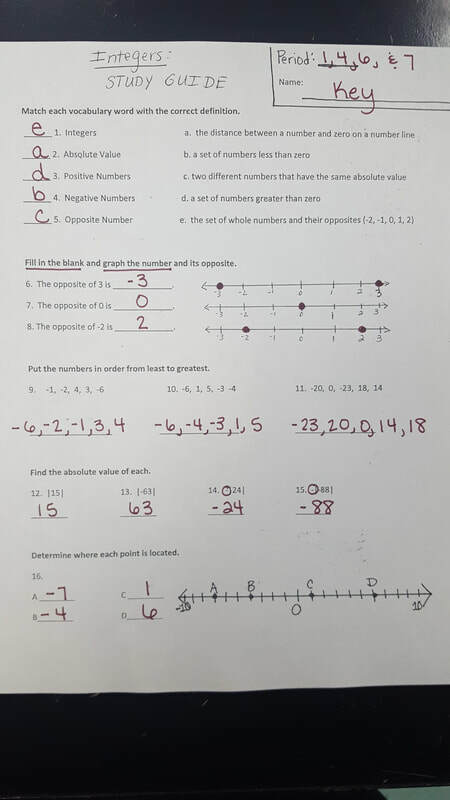 Additional homework: #1-12 on the paper sent home. Today students learned all about the Distributive property and how to apply it to create equivalent expressions. They did so well with this concept!!!! We didn't quite finish notes, so we'll finish up tomorrow! They also received their weekly homework sheet. They only have 3 night's worth of homework due to a hopeful Unit test on Thursday and a math benchmark on Friday. Today we checked our weekly homework sheet. Then, we quickly recapped "Combining like terms"/Simplifying Expressions from yesterday's lesson. Then, students worked with a randomly chosen partner to solve problems posted around the room. Then, they checked their work. 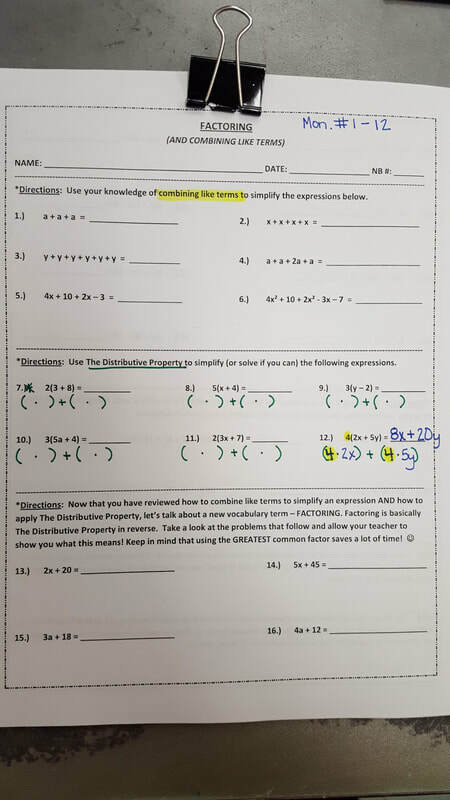 Monday we'll review the distributive property and how to use it with expressions. 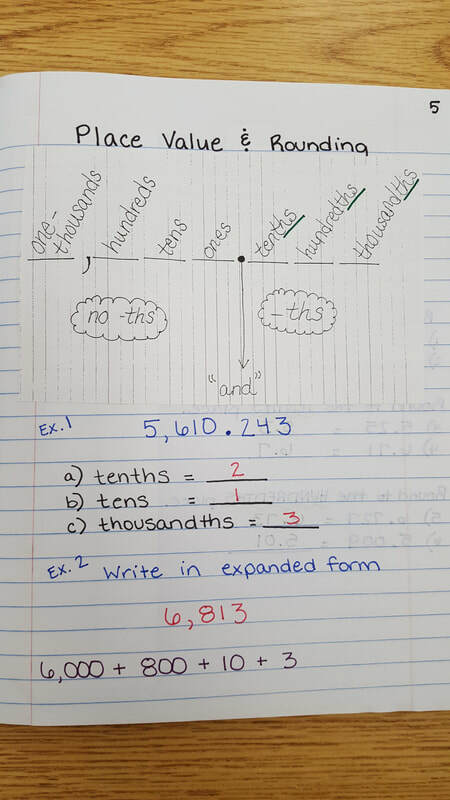 Today students took notes over "Equivalent expressions"...also known as "Combining Like terms". Then, 1st period got to partake in a coloring activity. Today students learned about Like terms. We watched a video clip to get us started and then talked about what the gentleman in the video could've done to make his order less complicated. Afterwards, students used animals at the zoo for their combining like terms activity. 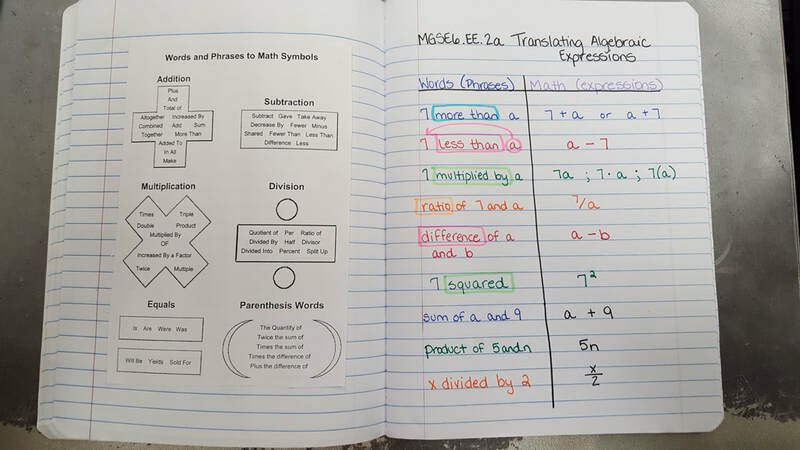 Today students continued working on translating words into algebraic expressions. They completed a practice paper in class with a partner and then worked on a cut/paste...matching activity. Many struggled but it all came together in the end. Today students received their weekly homework sheet. I reviewed and went over Monday night's problems. Mr. Queen reviewed and went over Tuesday night's problems. 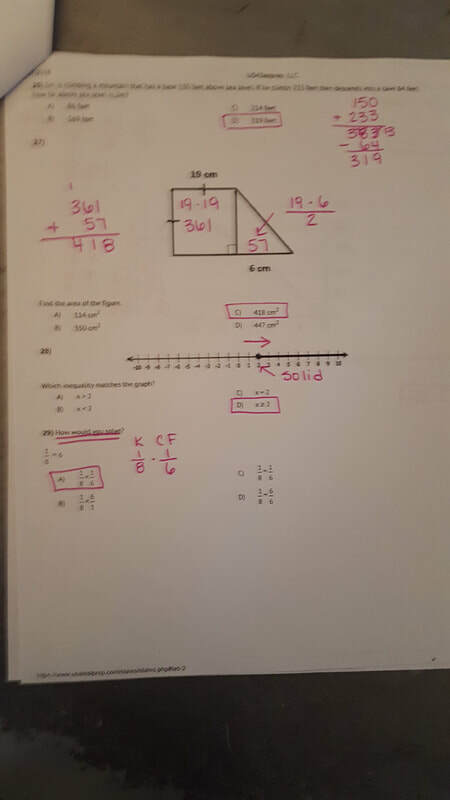 Then, students had 5 full minutes to work on both night's problems in class and ask us for help. Several chose to sit and not work at all. Afterwards, we split into 2 small groups. Each grouped worked on writing algebraic expressions into verbal phrases and then turning verbal phrases into expressions. Tomorrow we'll move on to Like terms. Today students received their weekly homework sheets. We went over all of Monday night's problems in class. Then, students grouped themselves into groups of 3 or 4 and listed math terms that mean addition, subtraction, multiplication, or division. Each group was assigned a different mathematical operation. After 3 minutes we classified each groups words into the appropriate categories on a tree map. Then, we watched a quick Flocabulary video on math terms while students pasted the terms into their notebooks. Afterwards, we took notes. 1st period needs to complete the Translating sheet for homework tonight. Today students received their weekly homework sheet. Then, we learned all about terms we use in math that mean addition, subtraction, multiplication, and division. They worked with partners to group the words into categories. Then, we took notes. Today we graded our weekly homework sheets. Then, we quickly reviewed yesterday's lesson. Afterwards, we moved on to refreshing our memories of vocabulary we use in math, such as, "sum, product, quotient, etc". Students worked in groups to take various math terms and group them into their appropriate categories. Then, we reviewed what each group had come up with before the end of class. Today my 4th period kiddos probably left very unhappy with me. I did NOT have a good report from the sub or Mr. Queen during my absence yesterday. As it turns out several students were very disrespectful to Mr. Queen while he was teaching the lesson. Mr. Queen gave out 8 demerits during 4th period yesterday. I about had a cow! I could not believe my kids had been so disrespectful. I told each student that had received a demerit that they were to sit Silent Lunch for one day. Most of them apologized to me and to Mr. Queen for their behavior, but it was still unacceptable. Then, students took a POP QUIZ over Evaluating Expressions. Today students practiced Evaluating Expressions from our lesson yesterday. Then, they had class time to work on their Homework sheet that's due tomorrow. 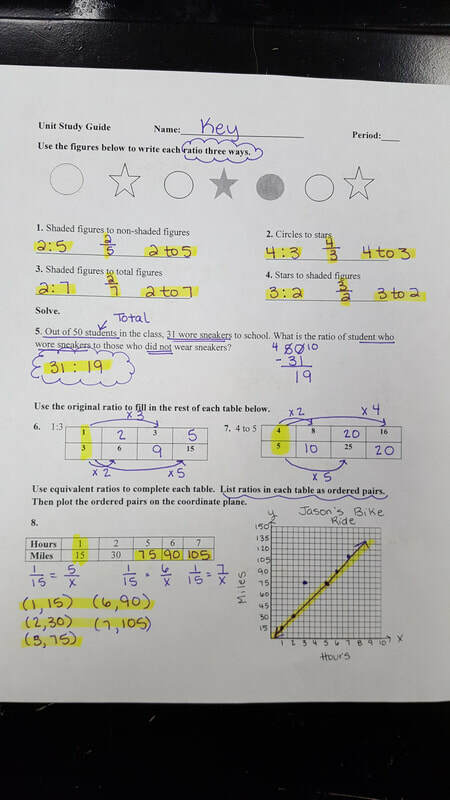 After students finished both they received an additional Evaluating Practice sheet. The additional sheet will be due by the end of class on Monday! Today Mr. Queen gave notes over "Evaluating Expressions". Everyone should have done extremely well with this after our Powerpoint lesson yesterday. Then, students received a practice sheet. Only a few finished in class. The rest will finish tomorrow. 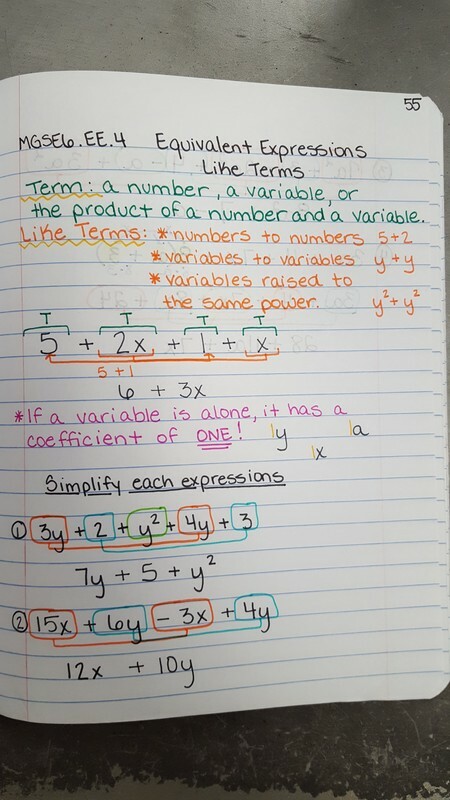 Today students learned all about Variables & Evaluating expressions using substitution. We watched a very catchy "Flocabulary" video about Algebraic Expressions and then took notes. Once we got started students were surprised at how easy it is to sub in values for variables. Tomorrow students will practice "evaluating expressions" with Mrs. Gonzales. I will be attending a Math Technology training here at FCMS. Those who don't stay on task and finish in class tomorrow may come home with additional homework. Hopefully not though. Today students turned in their leaves from yesterday & then we went over tonight's homework. 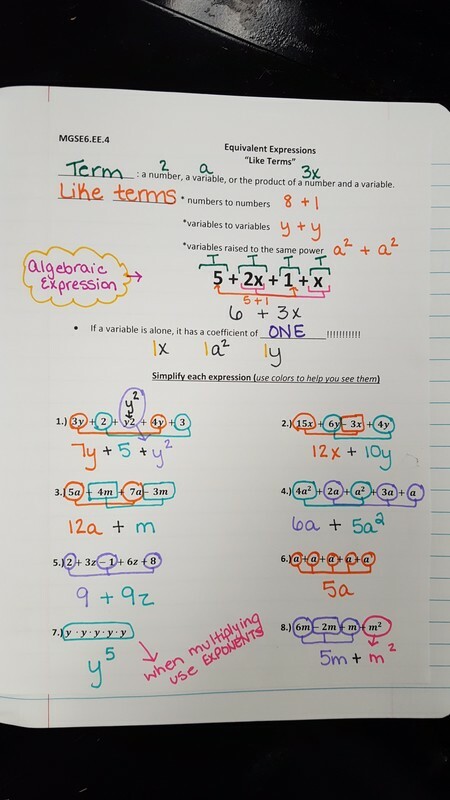 Afterwards, we learned what variables and Algebraic Expressions are. Mr. Queen worked through an interactive powerpoint and students got to come to the board and solve problems. We had a friendly competition going on at the end of class. We ended the class with 3 additional problems written on the board for homework. 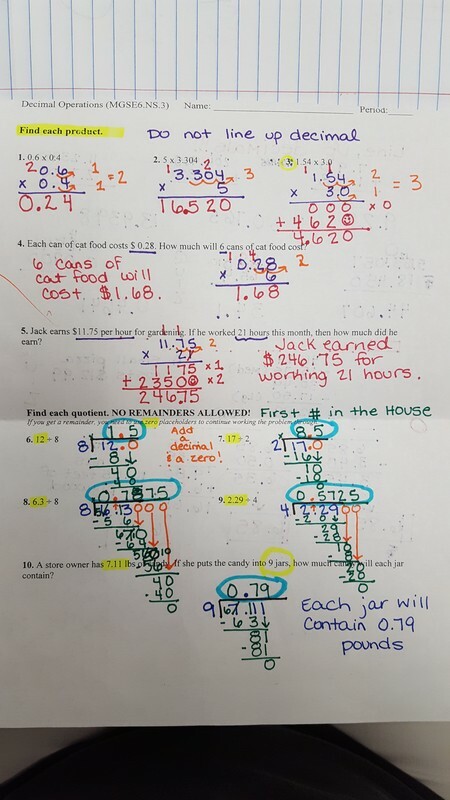 This is NOT mandatory homework, but those that were paying attention and got them written down can complete them, showing all their steps, and turn them in tomorrow to get a "No homework pass". We shall see how many do this. Tomorrow, I, Jodi Morgan, will be attending a Math Training here at FCMS. Mr. Queen will be doing notes over "Evaluating Expressions" with the class. Mrs. Gonzales will be here to assist. Today students worked on their Order of Operations leaves. They had almost the entire class to complete them and turn them in. Those who did not finish must finish for homework tonight. 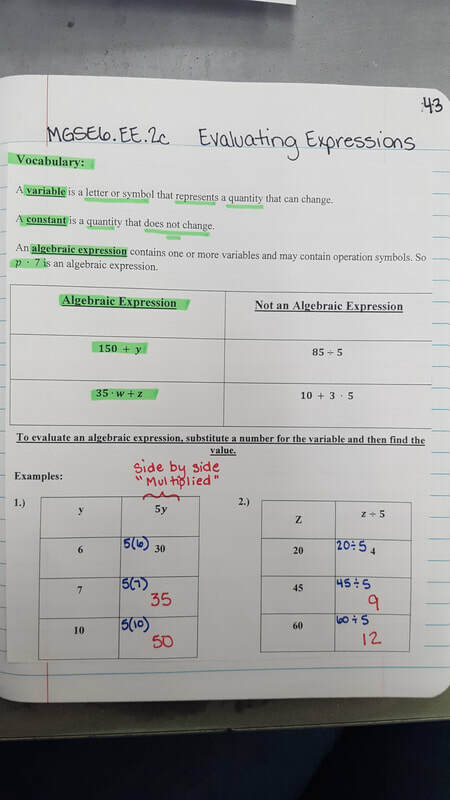 Then, we moved on to learning all about Algebraic Expressions & variables. 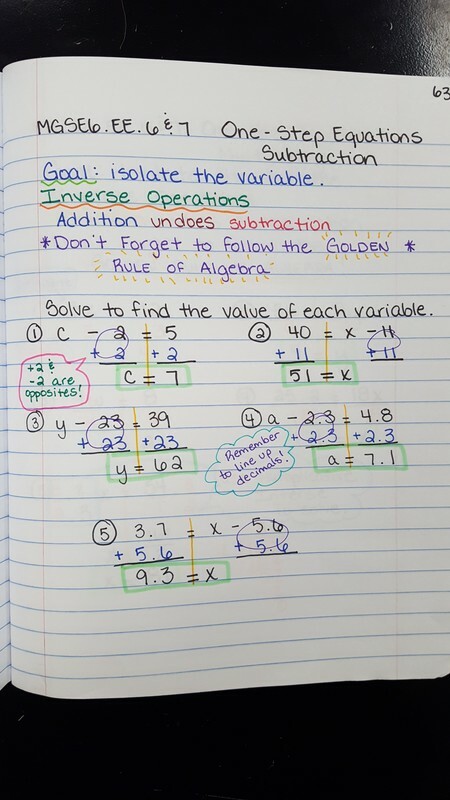 Tomorrow we'll expand on Algebraic Expressions and learn how to Evaluate them when given a value for a variable. Today everyone received their copy of this weeks homework sheet. We're trying a new design this week. 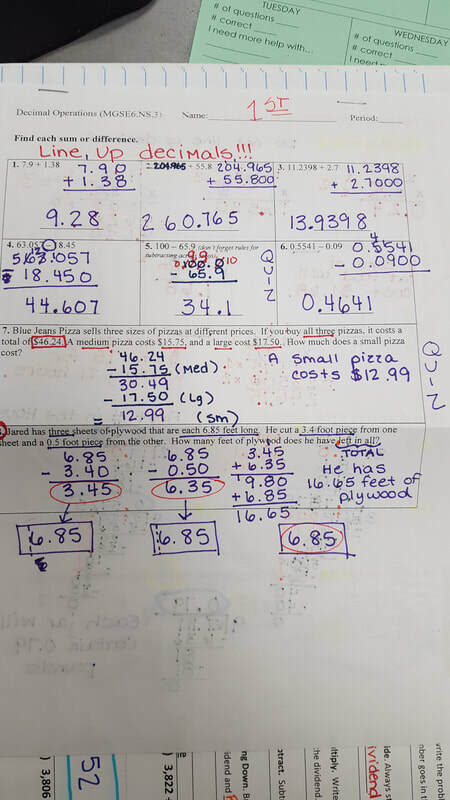 Students will have the problems and then the work space below the problem instead of on the back of the paper. Then, we reviewed Order of Operations quickly. Afterwards, students received their practice paper...a "Maple Leaf" of problems. Students began working and completed as much as they could in what little time they had. Time of limited today due to S.T.E.M. festivities beginning at 1:00 pm. Homework: Complete Monday night's problem set. 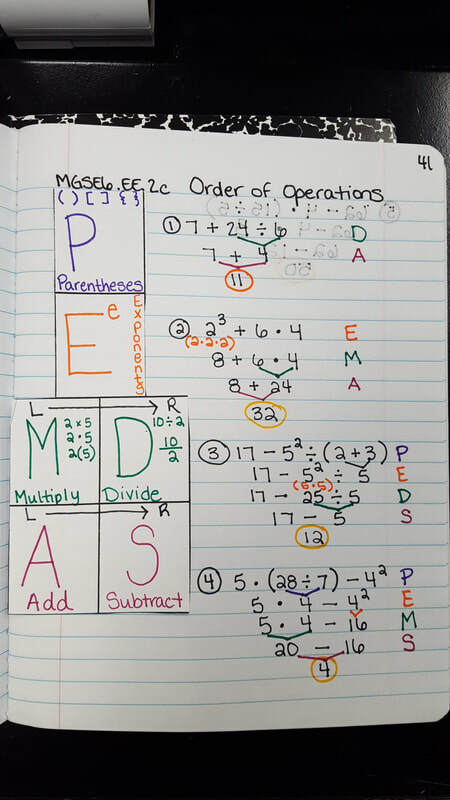 Today we continued learning about the Order of Operations. We finished our notes and then worked through a practice Sheet. Today we learned all about the order of operations. Today it was mandatory to show all the steps. If we don't show all our steps on the order of operations we'll get lost along the way. 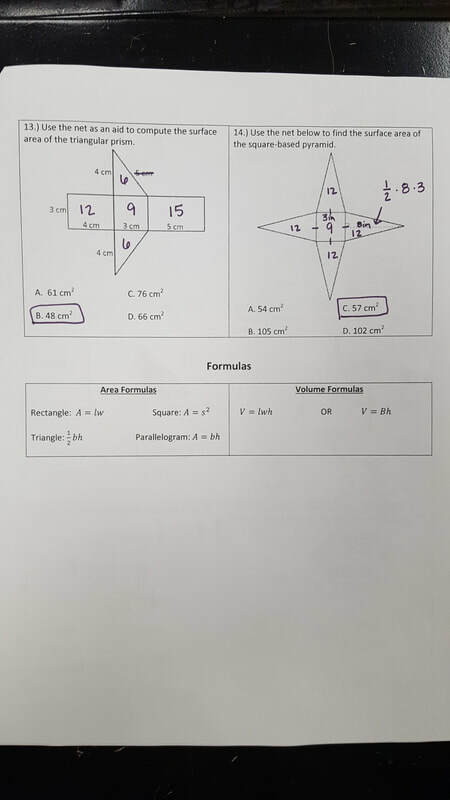 Many students really struggled with this because it was a bit too much work for them. However, if they can't do it this year then they'll struggle even more the next two years. Today students recalled the "Order of Operations". 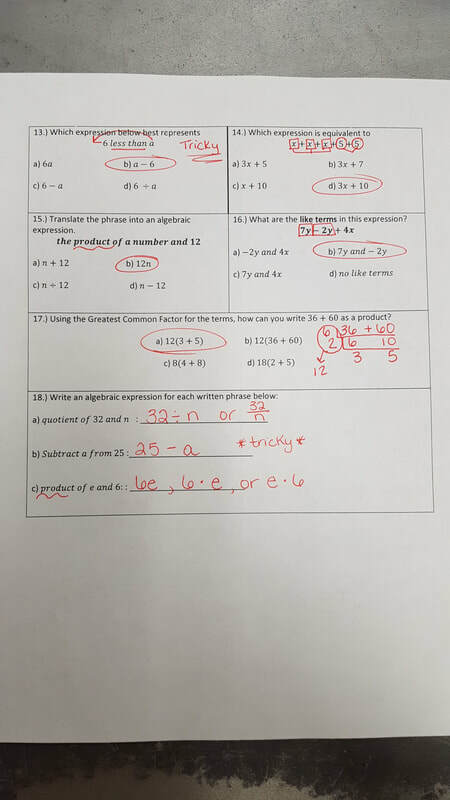 We finished up our "Exponents" practice sheet and then moved on. I do not use "Please Excuse My Dear Aunt Sally" to help students remember. Instead I simply use PEMDAS. I have them make a special note that "MD" are on the same level because they're worked LEFT TO RIGHT, and "AS" are on the same level because they're also worked LEFT to RIGHT. Today students learned all about Exponents. 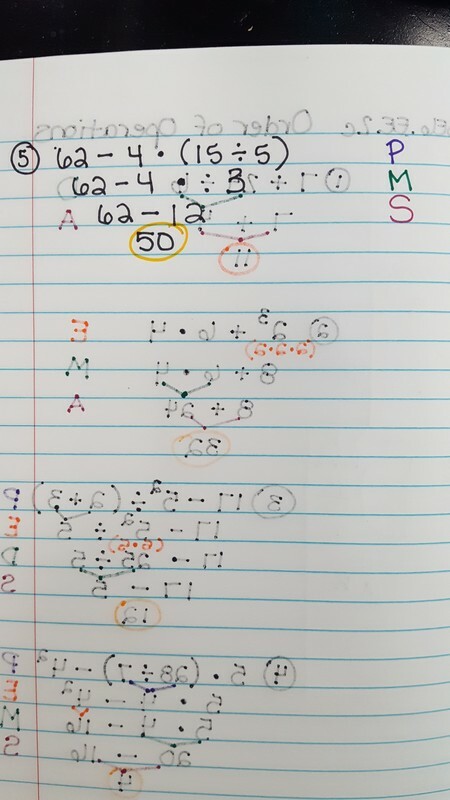 Many remembered these from Prime Factorization in Elementary School and from our cool Ladder Method. We watched a brainpop video, worked through a quick flipchart, and then took notes. After notes students worked on a practice sheet. The sheet needs to be finished for homework tonight! 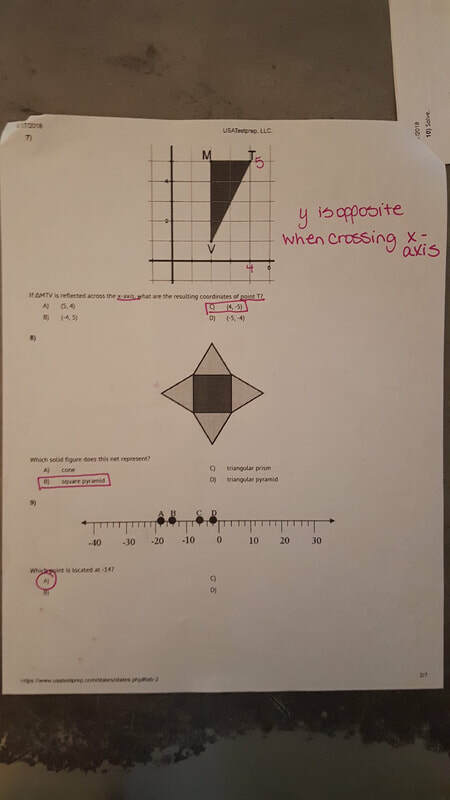 Today students turned in their homework sheets and then took their Coordinate Plane Quiz. We learned what Exponents were today! 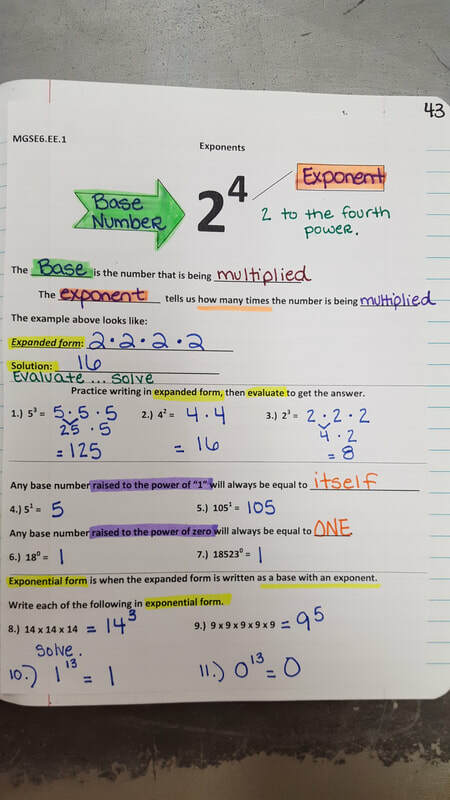 Many students were able to tell me what an exponent was before I explained it! Great Job guys. Next week we'll begin our next Unit...Expressions! 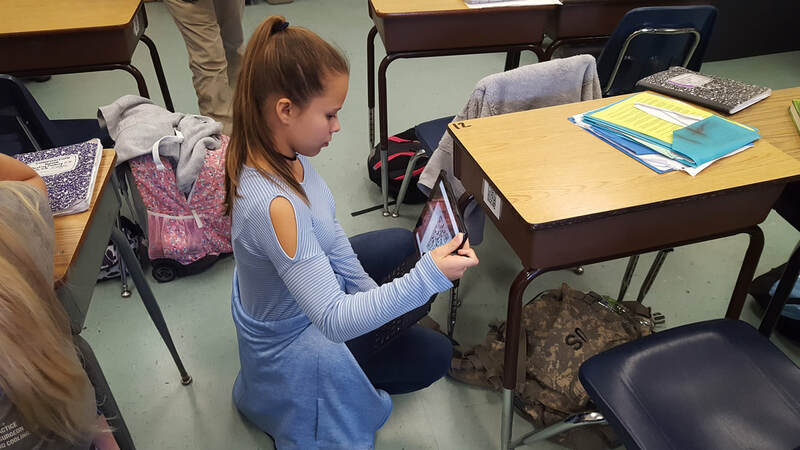 Today students completed a "Socrative.com" review over "Coordinate Planes" in preparation for their Quiz tomorrow. 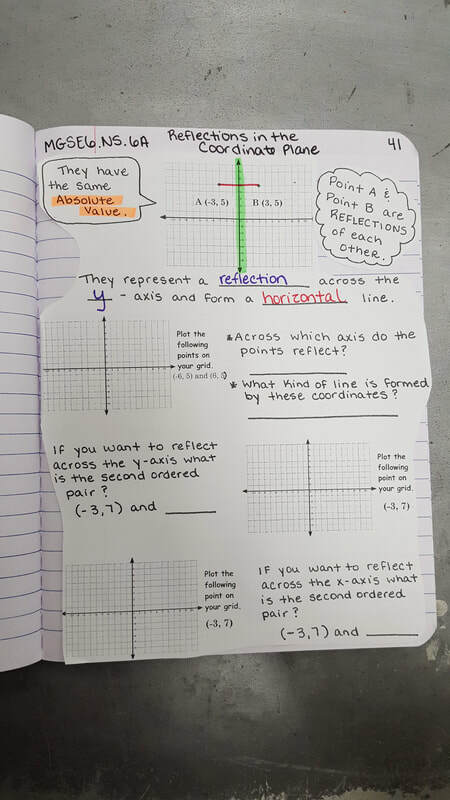 Today we continued learning about reflections in the coordinate plane. Students did pretty well with this concept. We also used a mirror to illustrate the reflections and their locations on the whiteboard. Today we reviewed Tuesday night's homework. 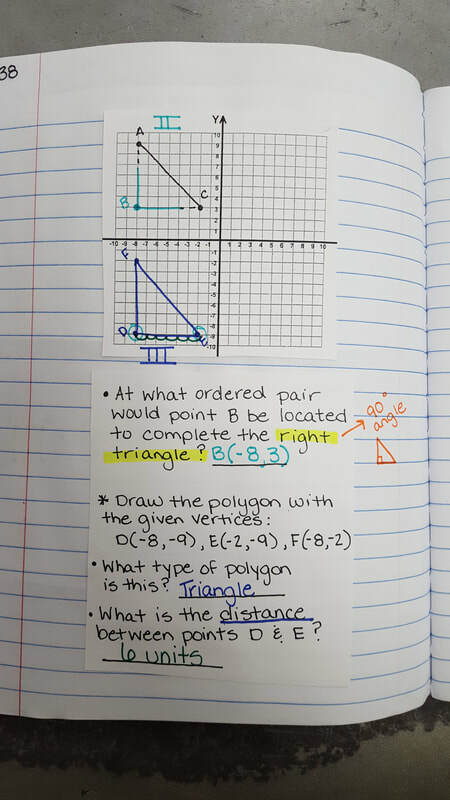 Then, we completed the practice paper over distance and polygon's in the coordinate plane from yesterday. 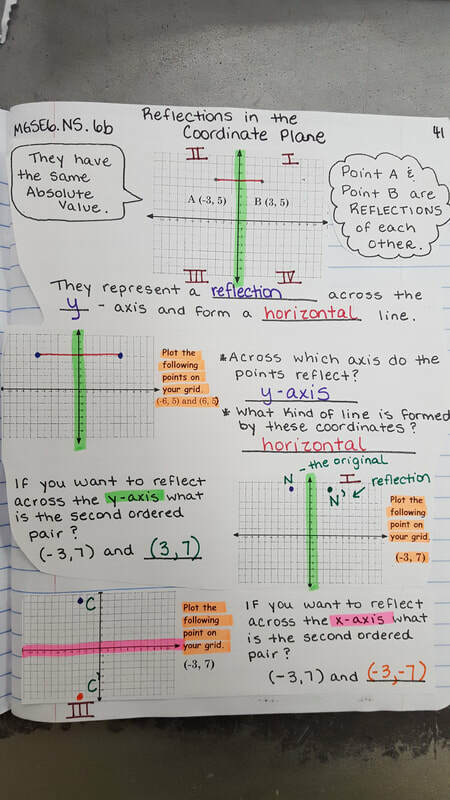 Afterwards, we moved on to Reflections...reflections in the coordinate plane. In 1st period we whizzed through and finished our notes, but in 4th, 6th, & 7th we only briefly got started. Tomorrow we'll finish. Coordinate Plane Quiz is on Friday! Today students received their weekly homework sheet & turned in their character graphs if they did not finish on Friday. Afterwards, we learned how to find distance on the Coordinate Plane and graph polygons. See notes. Today students used class time to complete their character graphs and turn them in. Those who did not finish must finish over the weekend and turn in on Monday. Today students continued plotting in the coordinate plane. They all received their Character Graphs today and got to work on them in class. In 1st, 6th, & 7th periods, students got to choose between Mickey Mouse, Tigger, or a Maple Leaf. In 4th period, most students had to graph the Maple Leaf. 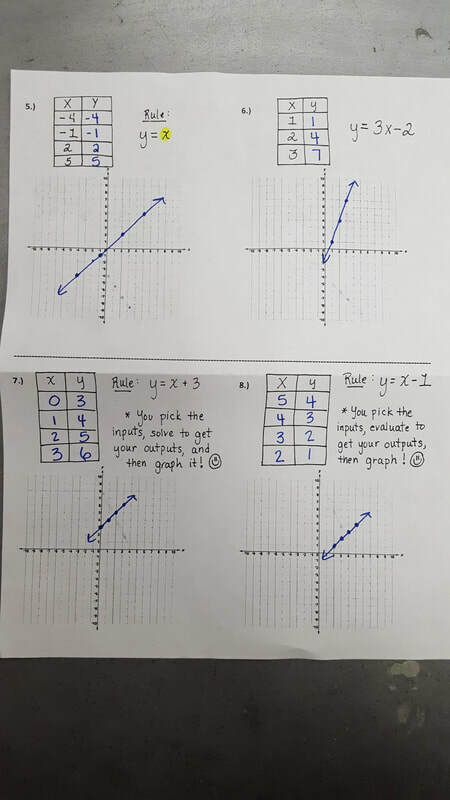 Tomorrow we'll complete and color our graphs and move on to distance in the coordinate plane. 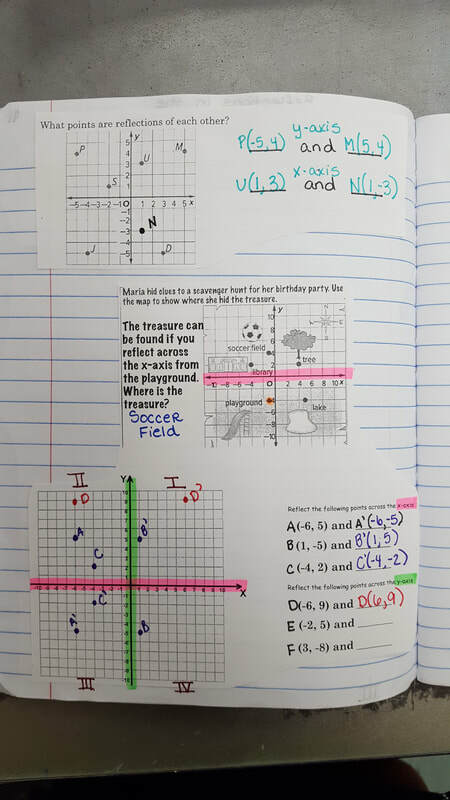 Today we began learning all about the Coordinate Plane. 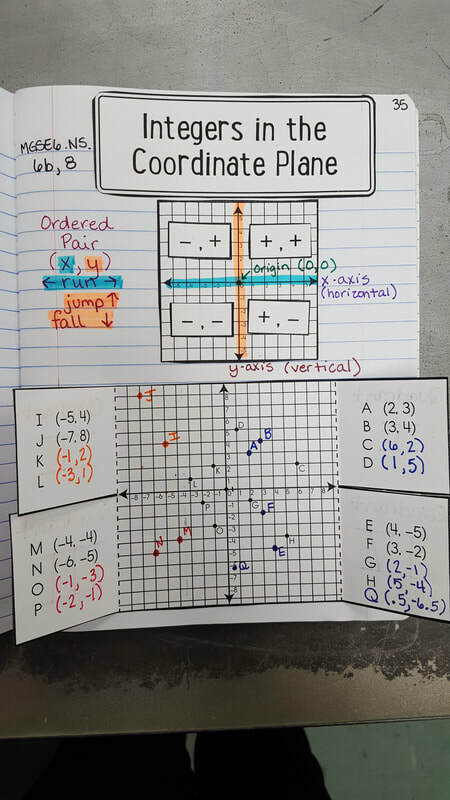 The Coordinate plane isn't a new concept to students. 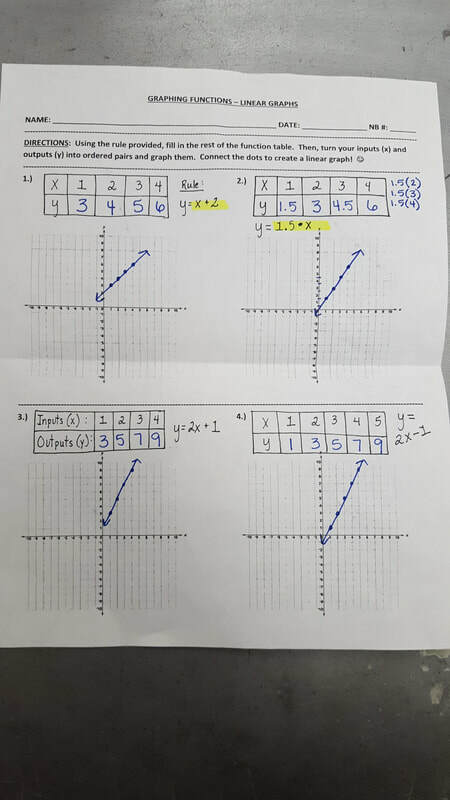 Last year, they graphed within the first Quadrant of the Cartesian Coordinate Plane. This year they will graph in all four quadrants. 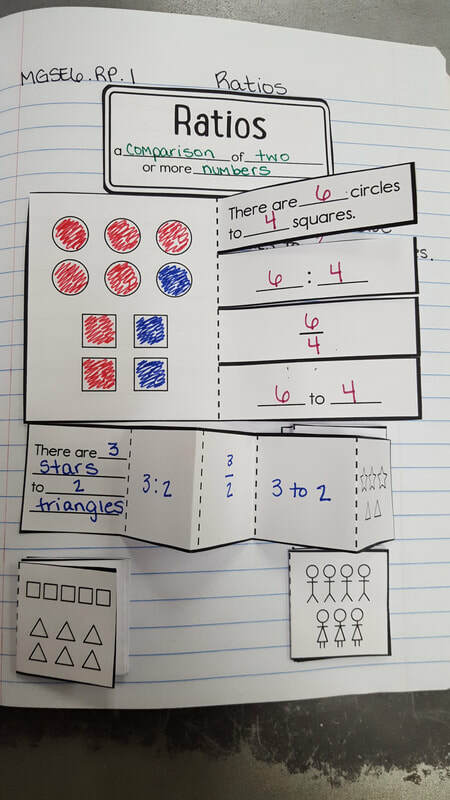 Today we glued in a Coordinate foldable in our notebooks. Tomorrow well practice graphing. Today students took their Quiz over Integers. Then, they received their homework sheet for the week and began working on it. Most students were finished with Monday and Tuesday night's homework prior to leaving class. Today students took a brief "Math Probe" through Google Docs. Then, they completed their Study Guide for tomorrow's Quiz. Homework sheets did NOT go home today! They will go home tomorrow! Everyone should be studying for their Integer's Quiz!! Today we checked our Weekly Homework sheet. Then, students learned all about Absolute Value. It was introduced through a cool "Flea jumping on a number line" task. Then, we watched a Shmoop video and took notes. Today we continued learning about integers and their locations on numbers lines. We took it a step further and learned how to compare them and order them. 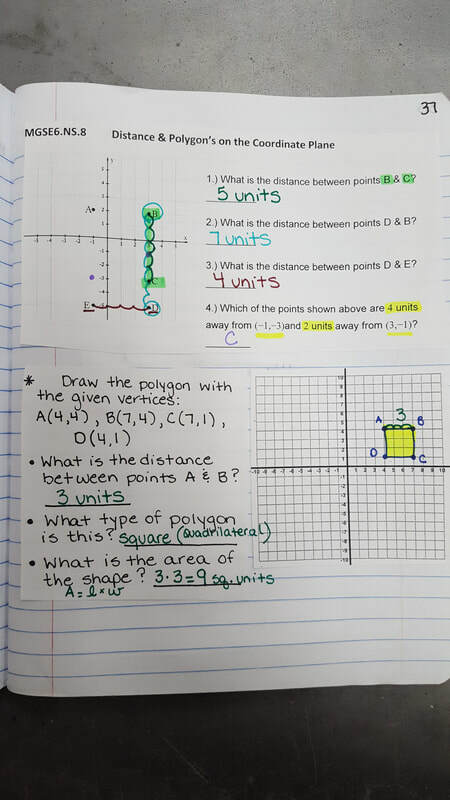 Students completed notes and then an independent practice paper. Today students continued working with the number line. We learned to locate rational numbers on the number line today. Then, we moved on to comparing and ordering integers. 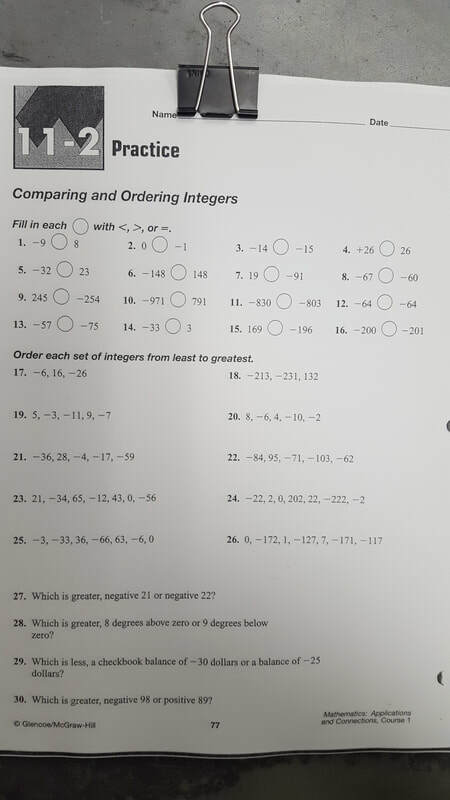 We'll wrap up with comparing and ordering integers tomorrow. Today students learned how to locate rational numbers on a number line. They used FRUIT LOOPS to locate the numbers, then they got to eat their fruit Loops. Today students learned how to locate rational numbers on a number line. 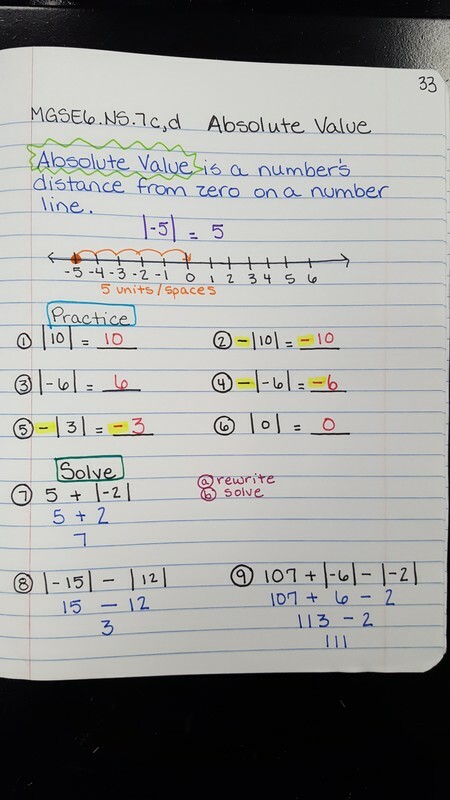 Then, they began working on a practice sheet where they labeled decimals on a number line. 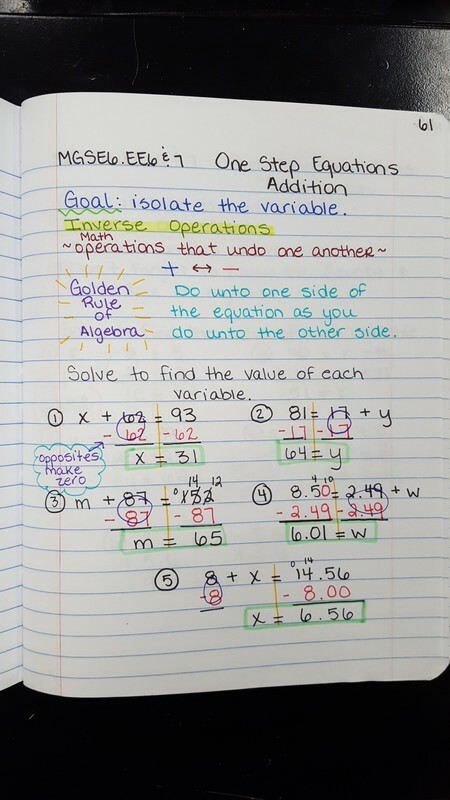 Today students finished their notes over "Integer's in the real world & their opposites". 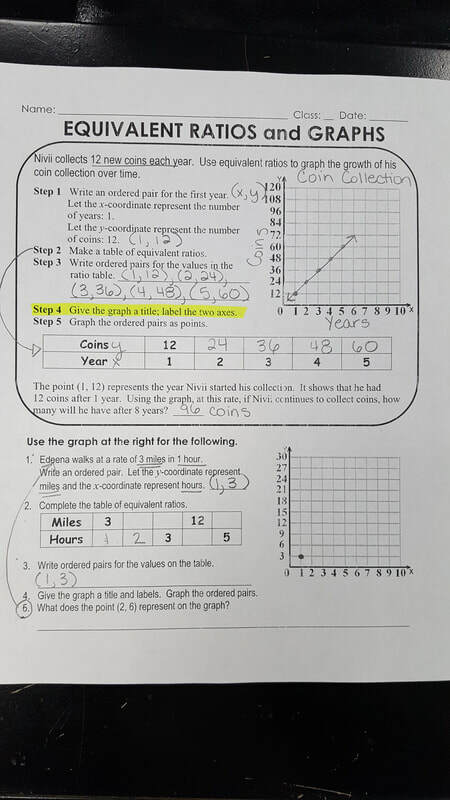 Then, they completed an independent practice sheet that we used as a formative assessment. Afterwards, we moved on to discussing the number line. 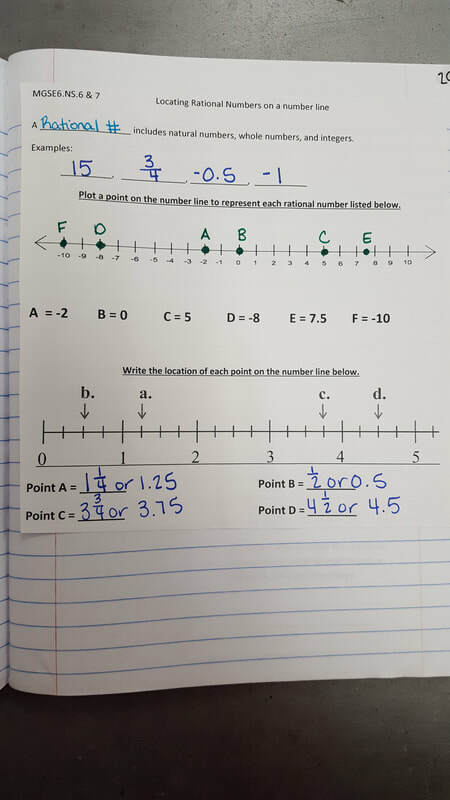 Many students are unfamiliar with negative numbers being on the number line. 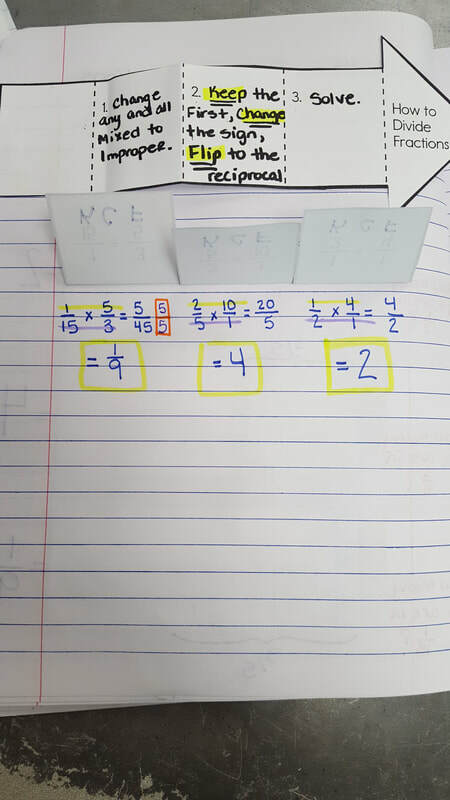 They glued a small number line into their notebooks that I made for them. While they were pasting these into their notebook I played a cool Flocabulary "Number Line" video for them. Once the video was over each student received their own number. The whole class had to place themselves in order on an imaginary number line based upon the number they were given. The trick was that they had 3 minutes to complete this task with out speaking. Some couldn't do it without talking and didn't get to finish the activity. Overall, students did very well with this. 4th period will work more on number lines tomorrow! Today students were introduced to Integers!! We'll be learning all about integers in this unit. We watched the videos below. 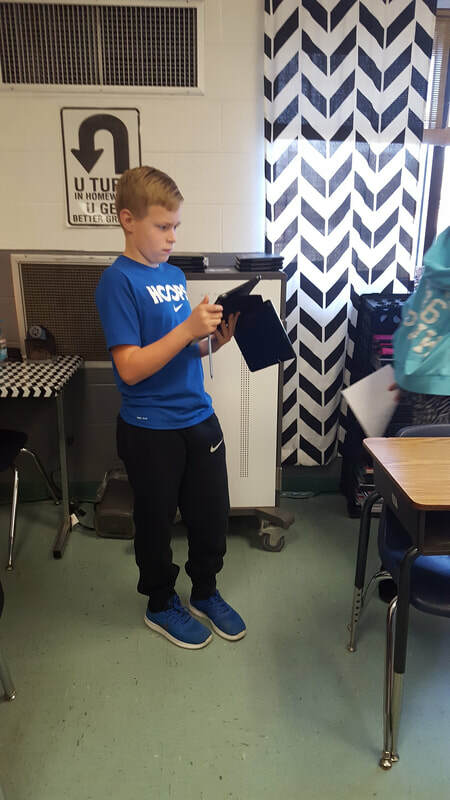 Then, students filled in notes as we worked through an interactive flipchart over integers in the real world and their opposites. Today students finished their Unit 1 Test. Then, in a few classes we got to play a game called, "Around the Room". All students received a copy of next weeks homework sheet today! Today we reviewed our study guide and then began the unit test. We'll finish the test tomorrow. Today students worked through their unit study guide. 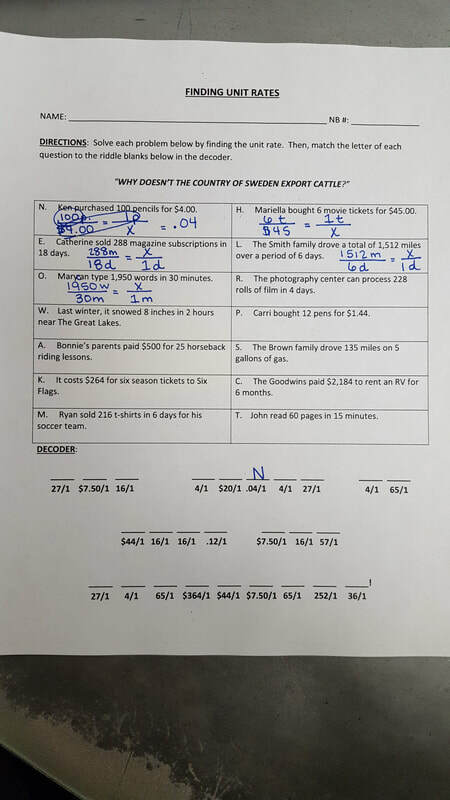 See below for Answer Key! Today students reviewed for their unit test and then began the test. Today we finished our Dividing Fractions word problems. Then, students received the hard copy of their study guides. Tomorrow 1st & 7th period will have their Unit 1 test. Today students learned all about solving Dividing Fractions Word problems. Tomorrow we'll complete our study guide. Today we continued reviewing Dividing Fractions. Then, we split into small groups to work on our study guide for our Unit Test. We will finish the study guide tomorrow. If time allows we'll begin our test tomorrow if not, then we'll have it on Friday. 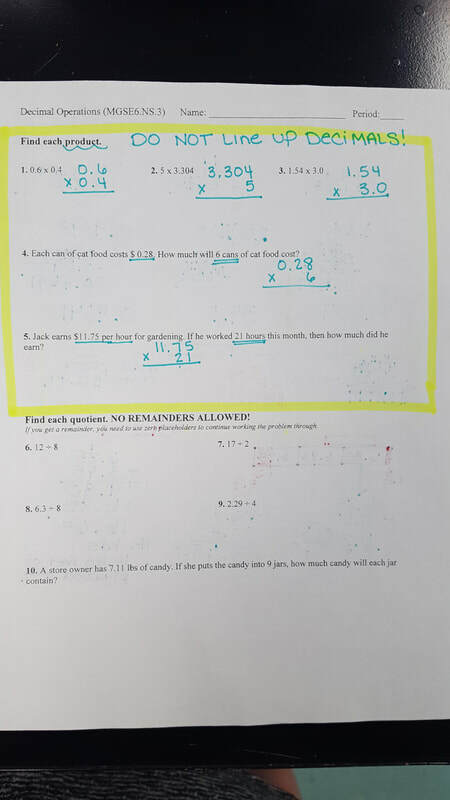 Today students finished and turned in their Dividing Fractions practice sheet after we graded our homework. 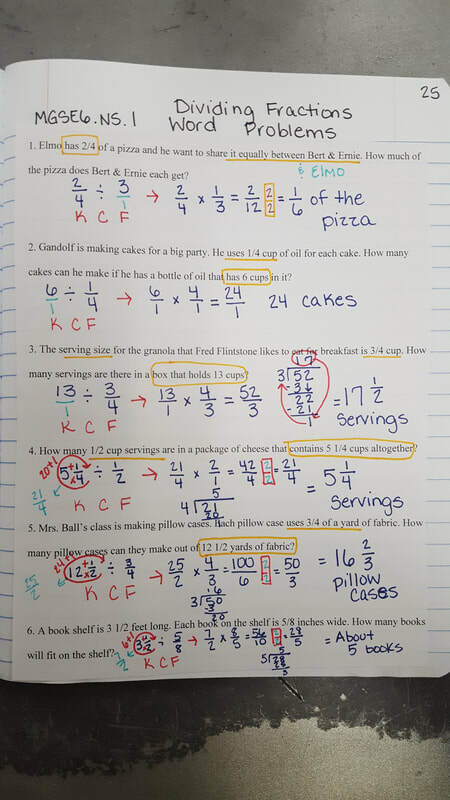 Then, we pasted "Dividing Fractions word problems" into our notebooks. We only got through 3 problems today. We'll finish up on Monday and then complete our Study Guide for Tuesday's Test. Today we took a bit longer grading homework in this class. 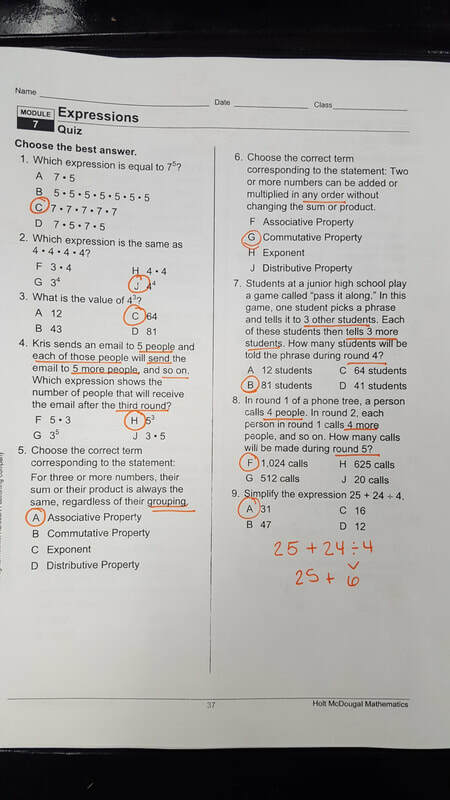 Several students needed problems worked out to see their errors. Then, we reviewed long multiplication. Afterwards, students were allowed to work with a partner to finish their Dividing fractions practice sheet. We will have our Unit Test on Wednesday in this class. Today students were given about 7 minutes to finish up and turn in their weekly homework sheet. Then, we split into small groups and finished our "Dividing fractions" practice paper. Monday we'll move on to working through our Study Guide for the test. Today students took their notes check quiz after working on their homework for 5 full minutes. Then, we continued learning how to divide fractions. 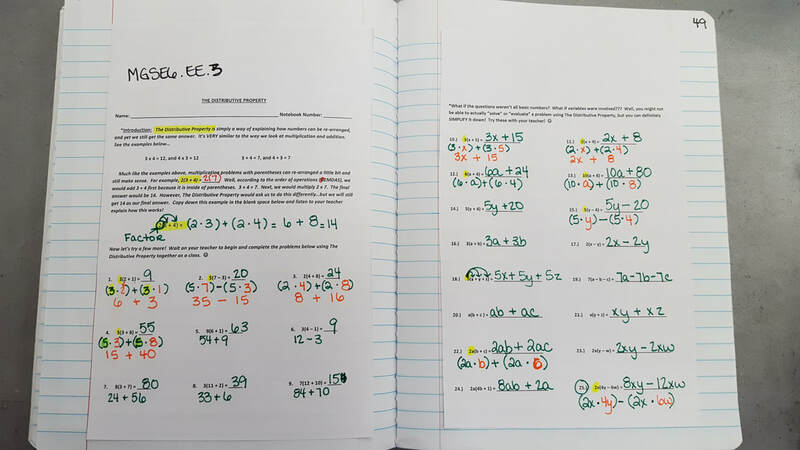 Students worked through a dividing fractions practice paper in class today. 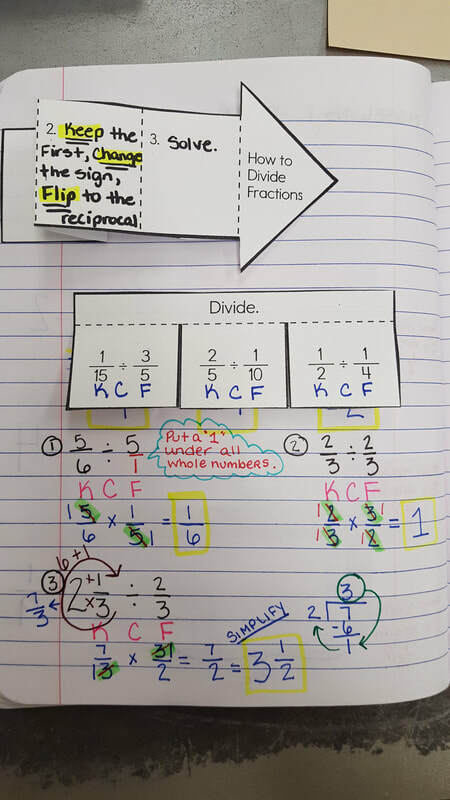 Tomorrow we'll finish the paper and discuss real world division of fraction problems. Today students took the first 5 minutes of class to work on their homework sheet & ask questions. Then, they completed their first "Notes Check" quiz. Afterwards we reviewed dividing fractions on the whiteboard. 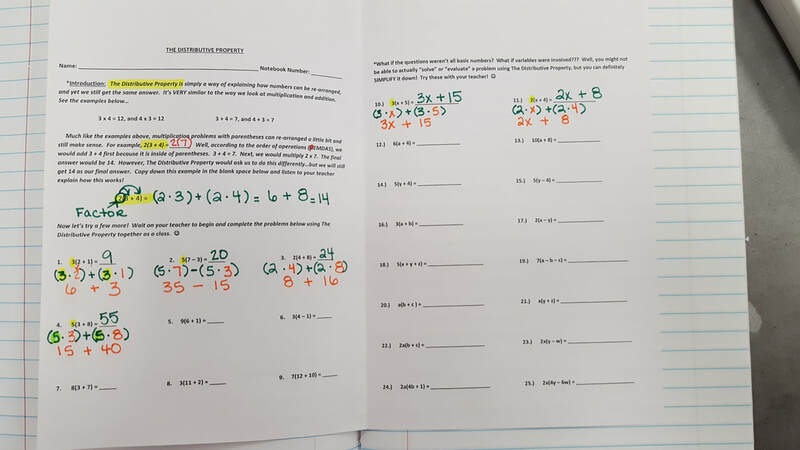 Then, we split into small groups and began working through a "Dividing Fractions" Practice sheet. 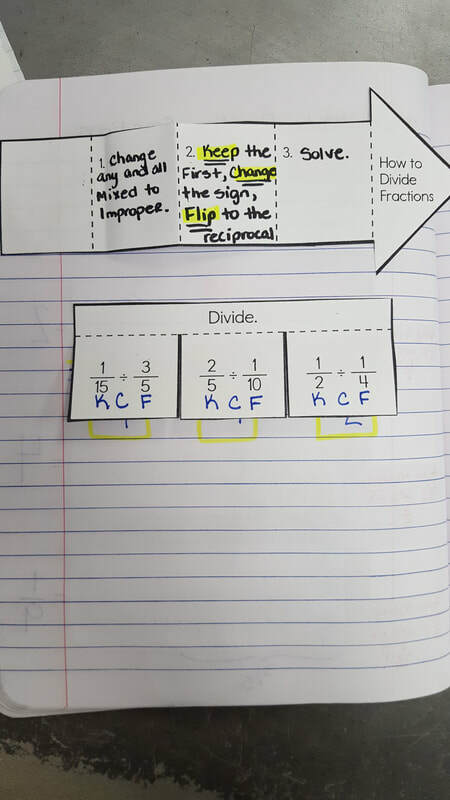 Today students learned how to divide fractions using models and through the "Keep, Change, Flip" method. 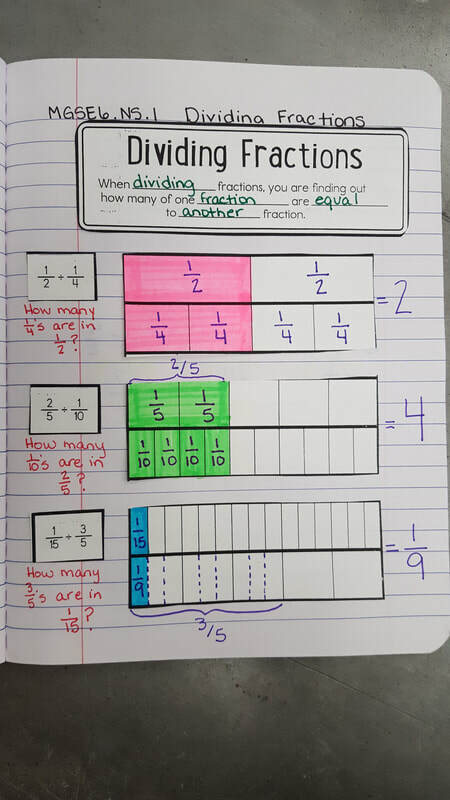 We'll continue dividing fractions tomorrow. Also, tomorrow is our brief Notes check. 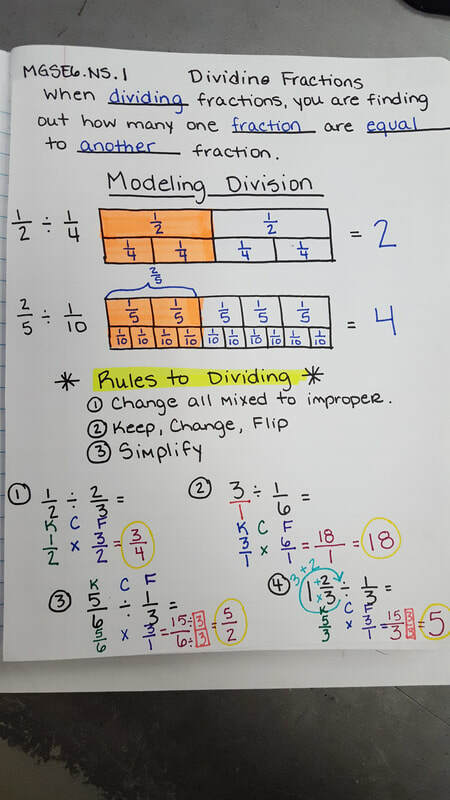 Today students learned how to divide simple fractions through models and the "Keep Change Flip" method. Then, they worked on completing their "multiplying fractions" puzzle. 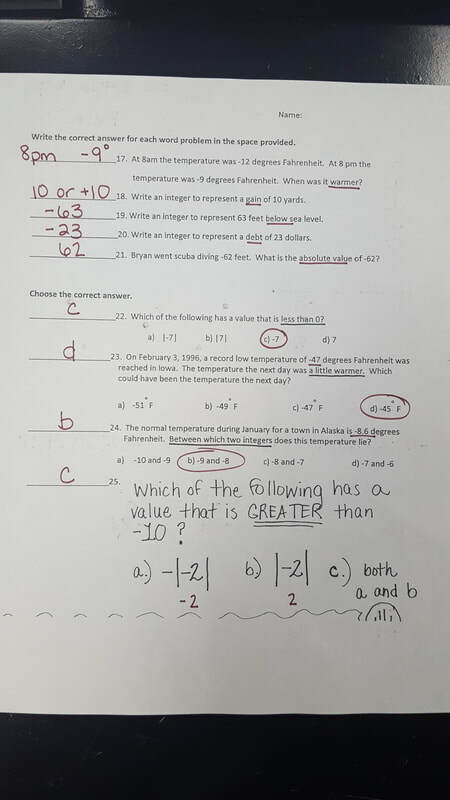 Students were told if they finished the back of the sheet and got it all correct they'd receive extra credit. Several chose to take it home and work on it. Today students received their Decimal quizzes back along with several other papers. We spent the entire class period learning how to correct mistakes on tests/quizzes properly & turn them back in to earn half credit back. Then, students received their weekly homework paper. Today students continued practicing Multiplying Fractions. We finished our notes today & completed a practice paper. We'll finish up and move on to Dividing fractions next week. Today students practiced multiplying fractions in small groups. Today students were given 4 minutes to work on homework and ask questions. Homework sheet is due TOMORROW!! Then, we watched a video about Multiplying Fractions. 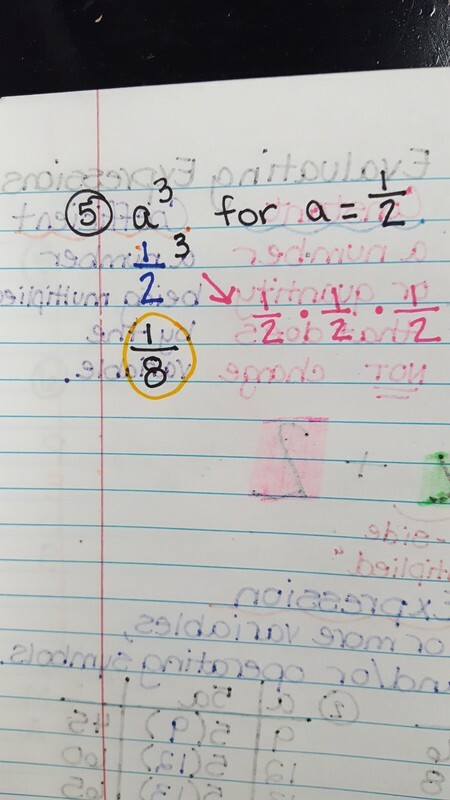 Afterwards, we took notes over Multiplying fractions. In 6th & 7th periods we'll need to finish our notes tomorrow! 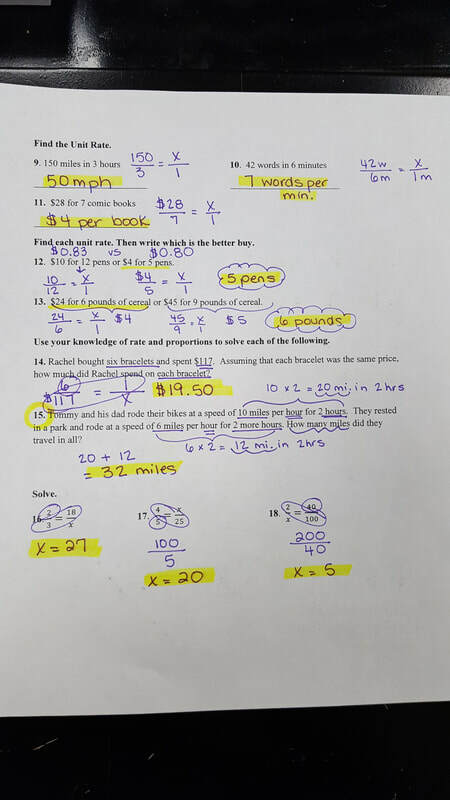 Today students were given 5 minutes to work on homework. Homework Sheet is DUE TOMORROW! 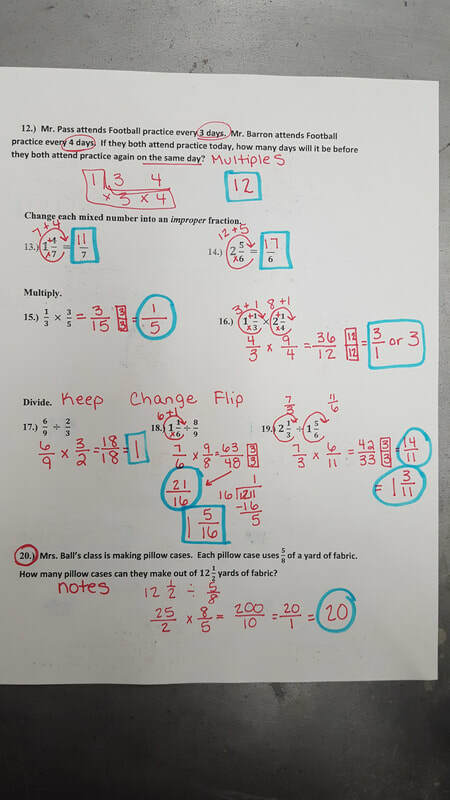 Then, we continued practicing changing mixed numbers into improper fractions and changing improper fractions into mixed numbers. Afterwards we watched a video about multiplying fractions and began taking simple notes. 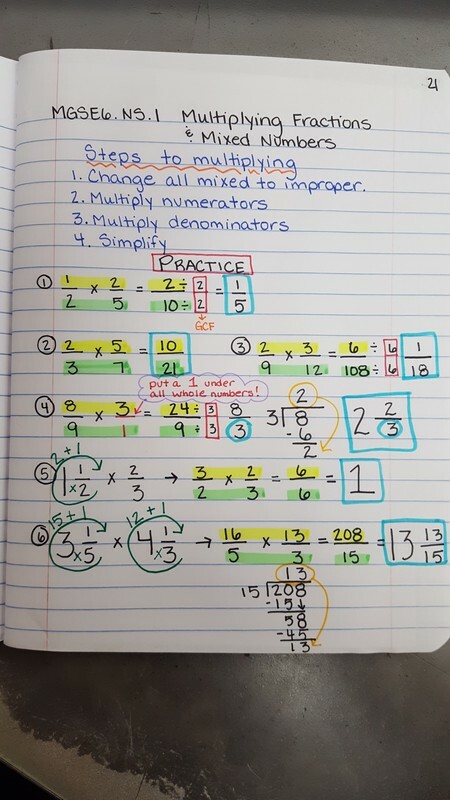 Today students recalled how to change mixed numbers into improper fractions and turn improper fractions into mixed numbers. Then, we reviewed multiplying simple fractions on the white board. In 1st period we began taking notes on simple fractions, but in 6th & 7th we only got to review on the whiteboard. Make sure Monday, Tuesday, & Wednesday night's homework is completed! Today students that didn't quite finish their test went with Mr. Queen to finish. The rest of us worked on Wednesday night's homework problems for about 5 minutes. 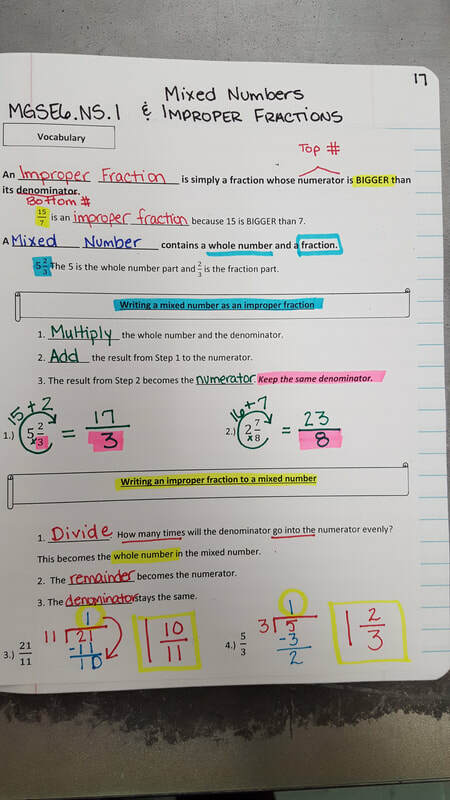 Then, we took notes over Mixed Numbers & Improper fractions. 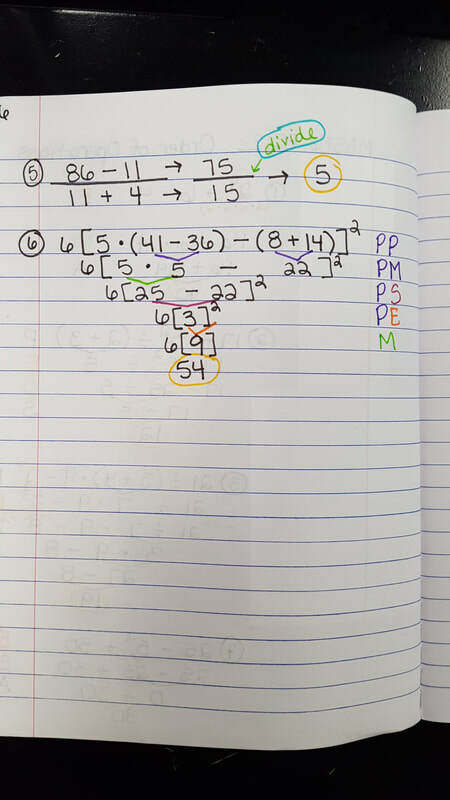 Then, students were asked to complete 5 problems on a sheet containing mixed and improper fractions. 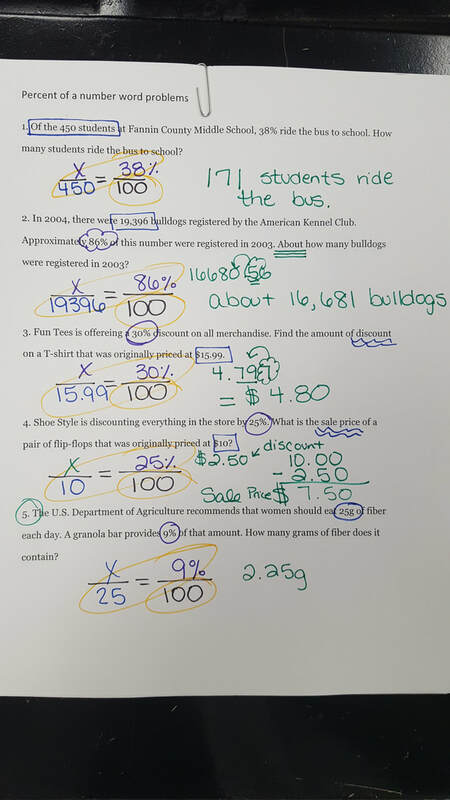 Today students turned in their study guide and took their Decimals quiz. 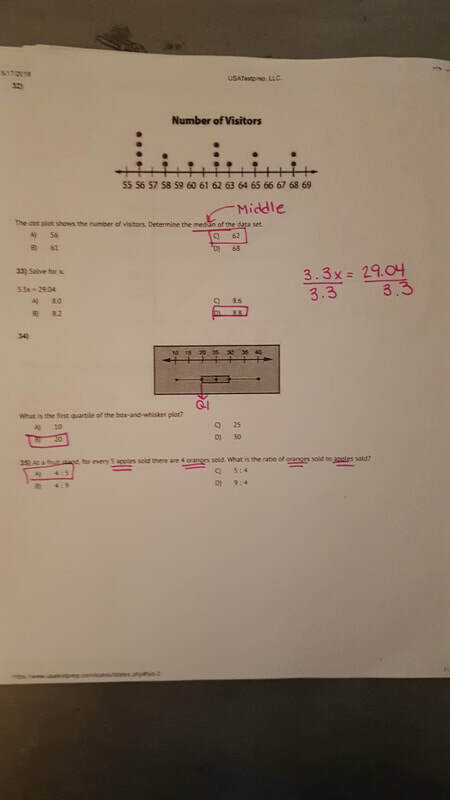 Tomorrow we'll begin reviewing mixed numbers & improper fractions. Today students received this weeks copy of their homework sheet. The homework sheet is a GREEN piece of paper. It is due in class on Friday. 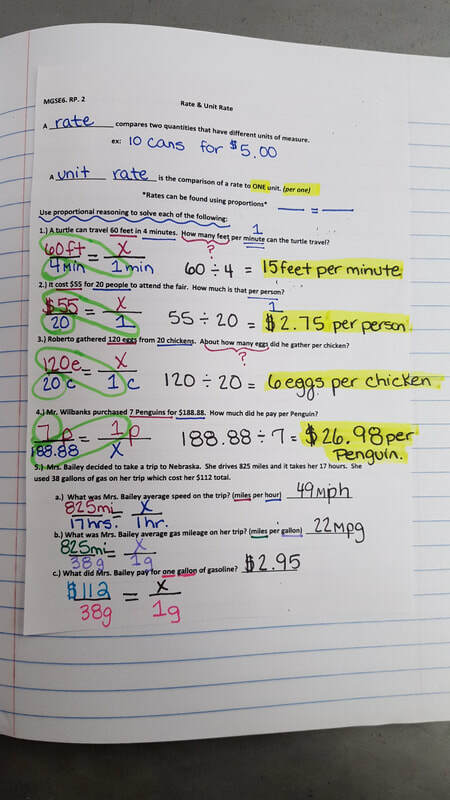 Students worked through a mini study guide today over all operations with decimals. Tomorrow we'll have a brief quiz over decimals. 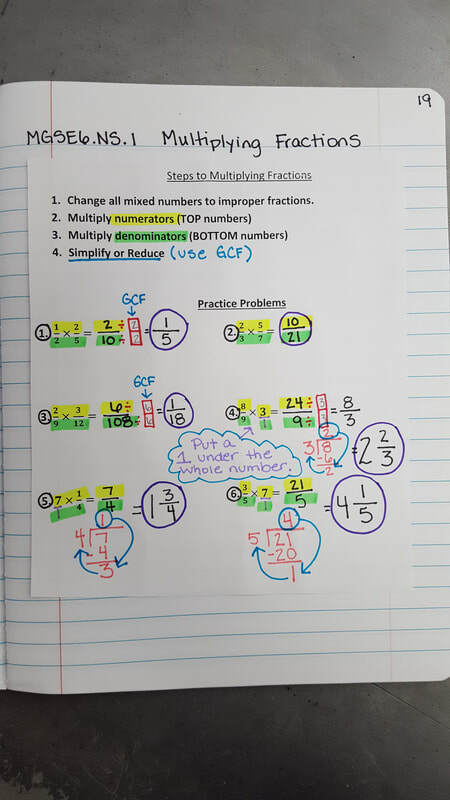 Then, we'll move on to reviewing how to changed mixed numbers into improper fractions and how to change improper fractions into mixed numbers. Today we checked and turned in our weekly homework paper. Then, we moved on to learning Long Division. See notes below. Today students turned in their weekly homework paper for a grade. Then, we reviewed simple division with remainders in small groups. 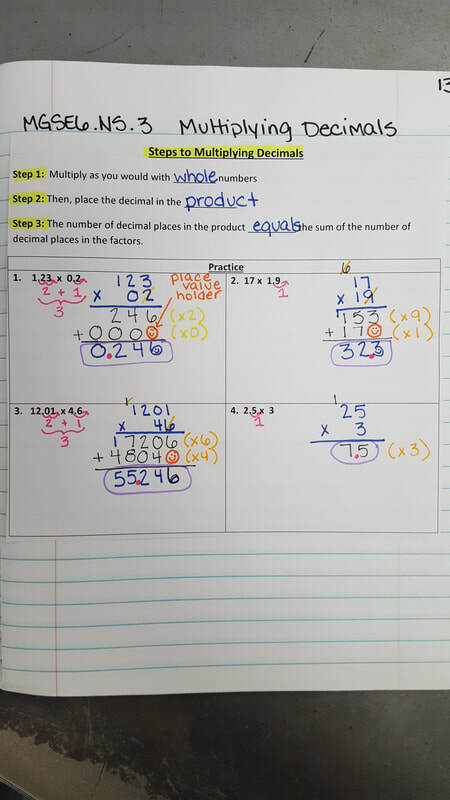 Today students finished their practice sheet over multiplying decimals and dividing decimals. Tomorrow we'll move on to Long division. Today students checked their addition and subtraction practice problems in small group. Then, we moved on to learning how to multiply decimals. After notes we completed #1-5 on a practice paper. 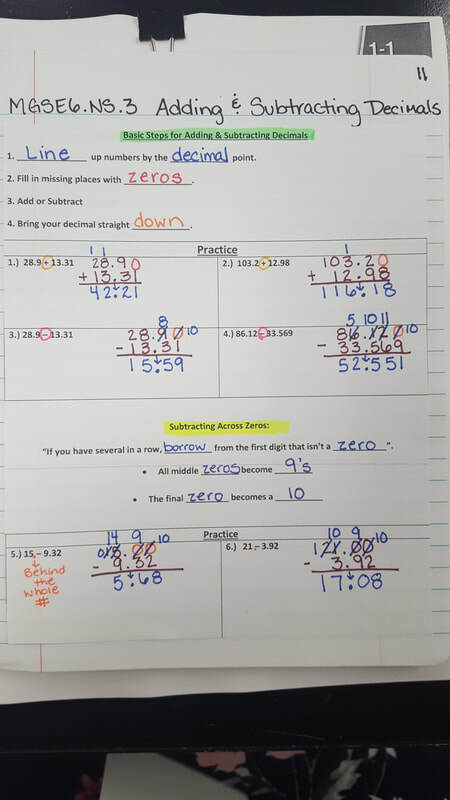 Today we checked #1-6 on the adding & subtracting decimals practice sheet students had to have completed. Those who had their assignment completed were surprised by a "gift". I gave them a "no homework pass" for being responsible and completing their work. Good job guys!! Then, we reviewed multiplying decimals. After working through a flipchart students had class time to complete #1-5 on the back of the paper from yesterday. We'll check these 5 problems at the start of class tomorrow. Today students practiced adding & subtracting decimals in small groups. We even worked through a few word problems. 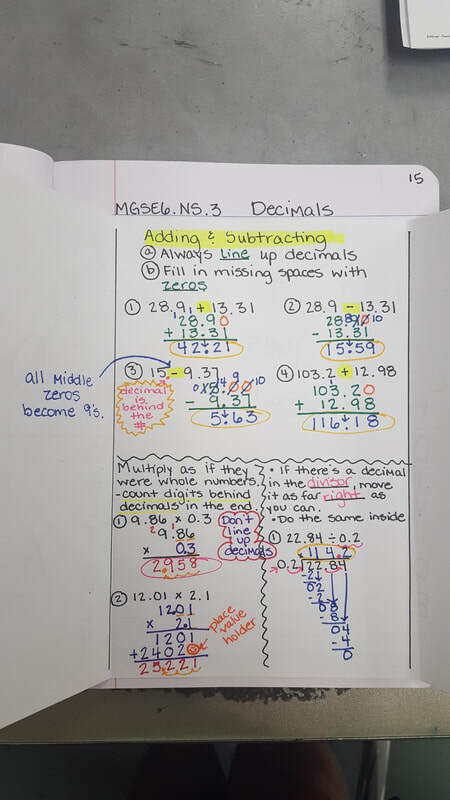 Then, we glued our notes for multiplying decimals into our notebook. We'll finish our notes tomorrow. 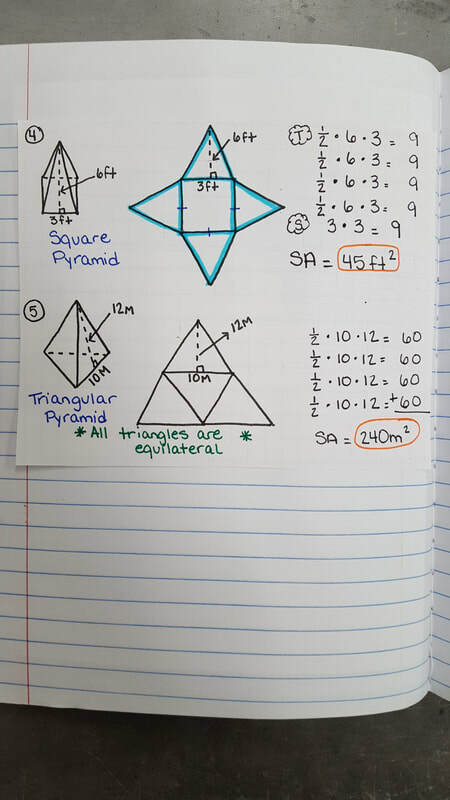 Today students received this weekends homework sheet (on green paper) and then we took notes in a "Decimal Foldable". 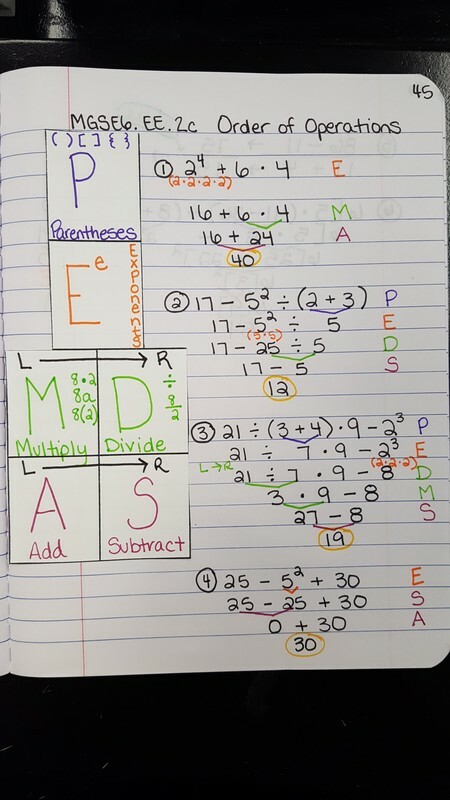 Then, students began practice on one side of a decimal operations sheet. Students are to have #1-7 completed by class tomorrow. Today students received their homework sheet for this week (green paper). Then, they took notes over adding and subtracting decimals. 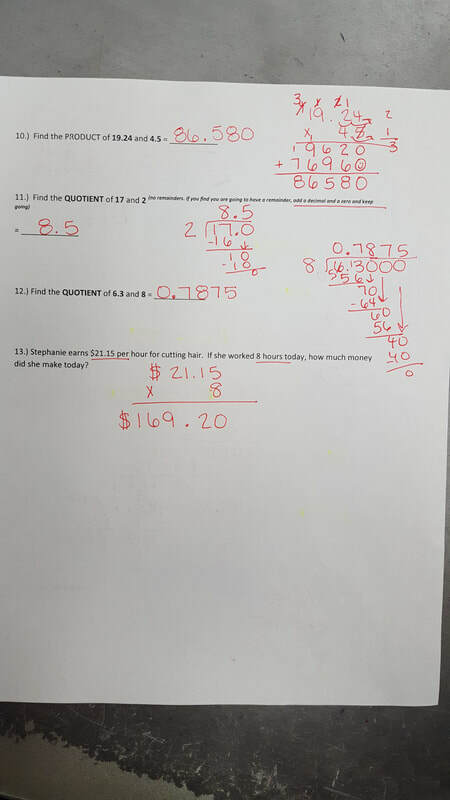 Afterwards, those who needed to finish their quiz from Friday were able to complete that and the other worked on a decimal practice sheet. Today we checked this weeks homework in class. Then, students took their quiz over GCF and LCM. Today students turned in their GCF/LCM practice paper they finished for homework last night. 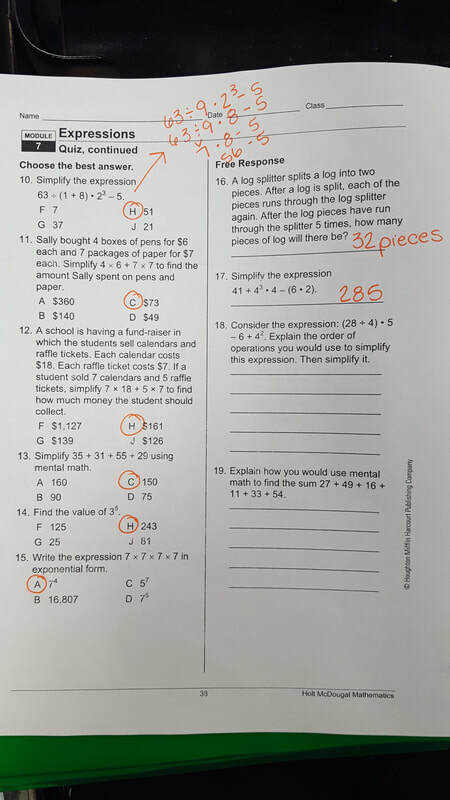 Then, they learned how to pick apart word problems. 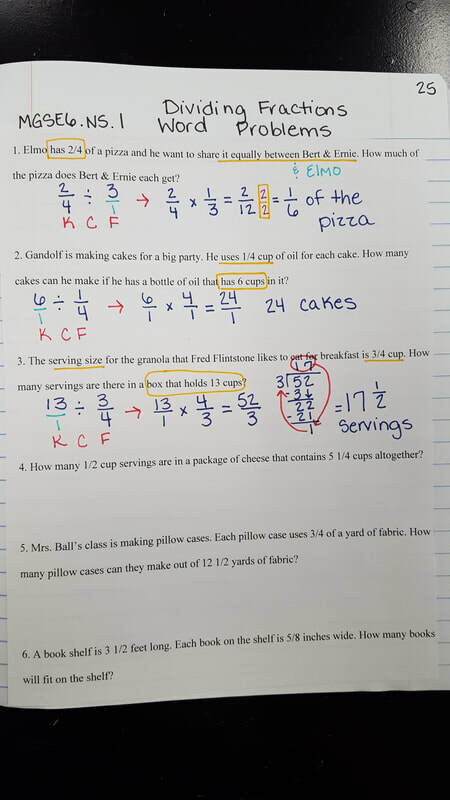 We worked through GCF/LCM real world applications (word problems). Quiz over GCF/LCM tomorrow! Study your notes. Also, green homework sheet is due tomorrow! 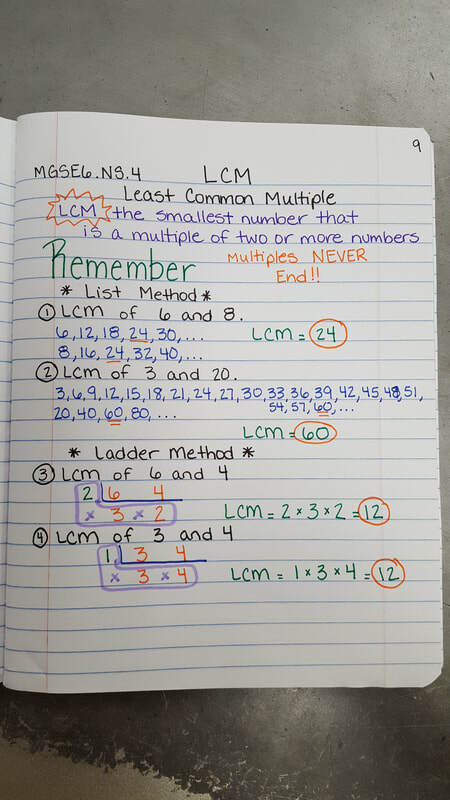 Today students finished practicing finding LCM and multiples. Brief 10 question quiz over GCF and LCM tomorrow. Also, homework sheet is due tomorrow. 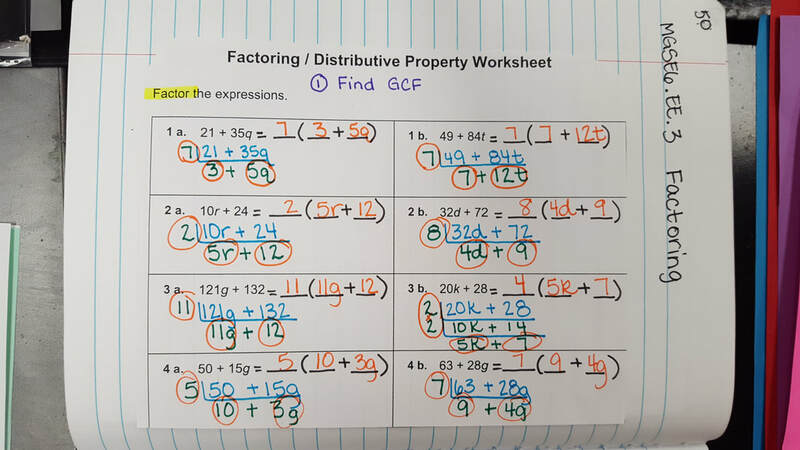 1st & 7th period: Today students learned how to illustrate the sum of two numbers by factoring out the GCF and using the distributive property. See notes below. 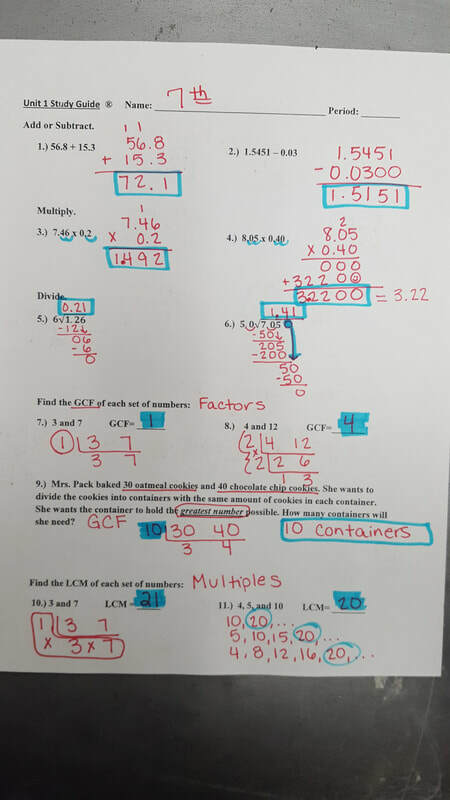 Also, students worked through a practice paper on GCF and LCM. Those who did not finish in class need to finish tonight for homework. 6th period: Today students finished their LCM notes and worked on a GCF/LCM practice paper. Those who did not finish the practice paper in class will need to complete tonight for homework. Several students were NOT prepared for class today! This has put this class period an entire day behind 1st & 7th period. 4th period: Today students finished their factor and GCF practice in small groups. 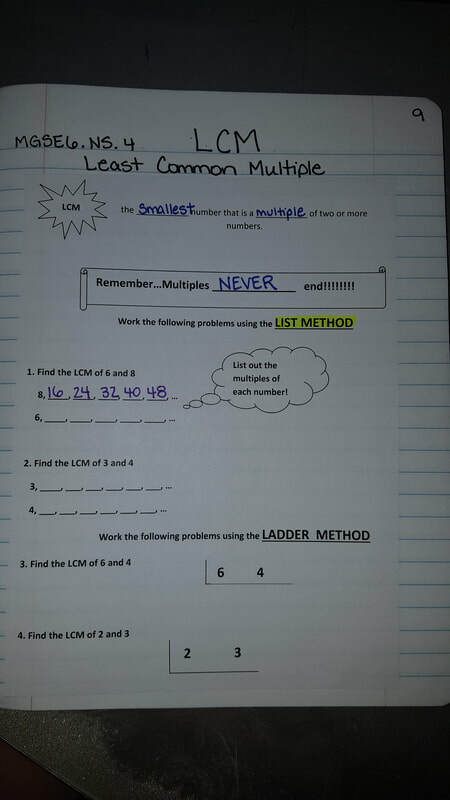 Then, we learned how to find the Least Common Multiple of two numbers. We'll finish our multiple notes tomorrow in class. 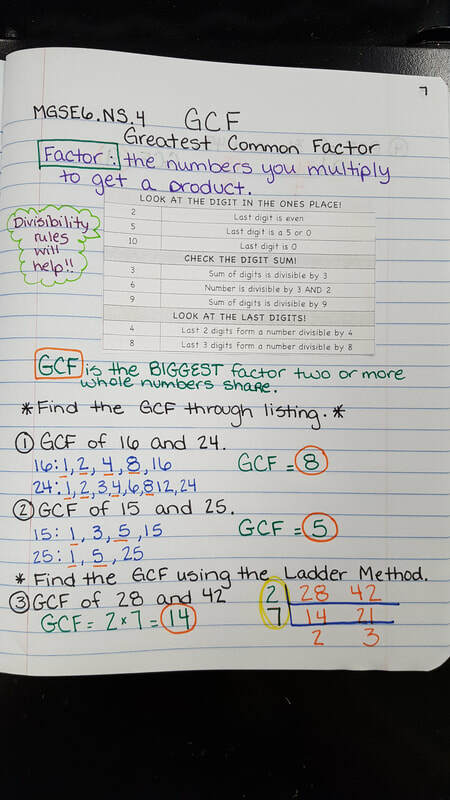 Today we reviewed GCF and moved on to finding the LCM of 2 or more numbers. 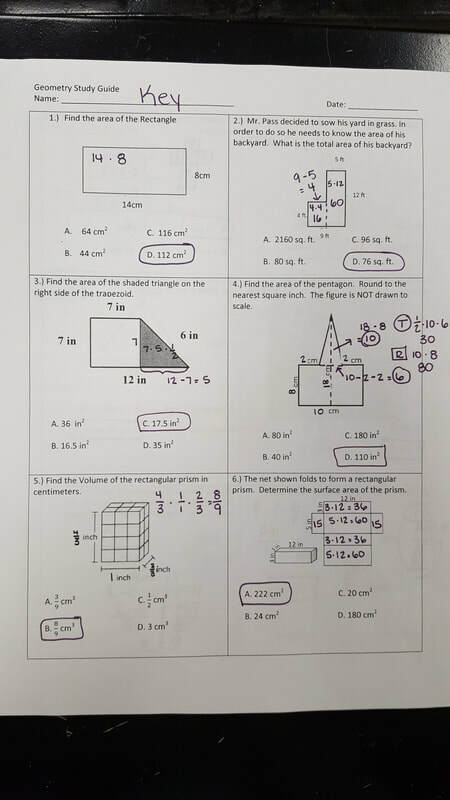 Homework: Be sure to have Tuesday night's problems completed. 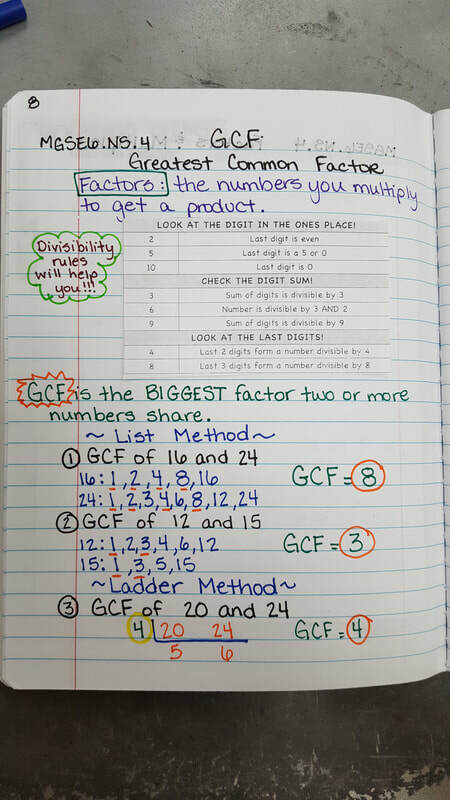 Today students learned how to apply their understanding of factors to finding the biggest factor two or more numbers share...the GCF! After a quick video clip, we took notes, and then students worked #1-10 on a practice paper. Today we reviewed factors & multiples from last week. Students also received their very first weekly homework sheet. This sheet is GREEN and is due on FRIDAY, AUGUST 18th! Students will have about 3-4 minutes in class each day to work through it and ask questions. 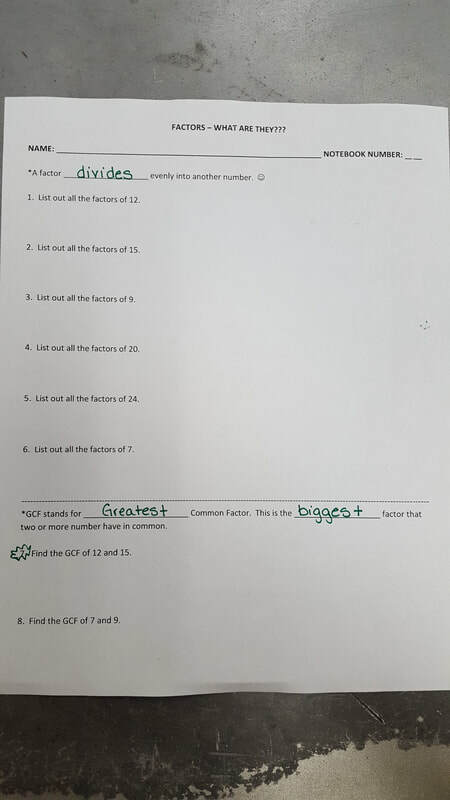 Students also learned how to find the Greatest Common Factor of two numbers today. We watched a brief video & then took notes. 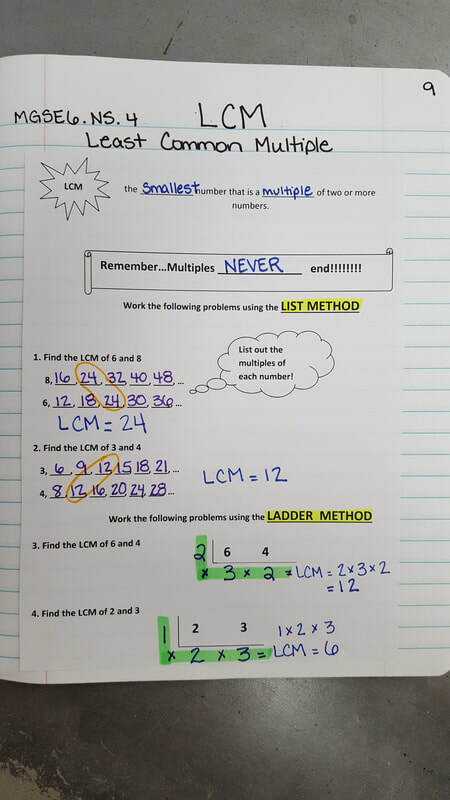 We'll finish notes tomorrow and learn how to find the Least Common Multiple. Today students received their very first weekly homework sheet. This sheet is GREEN and is due on Friday, August 18th. 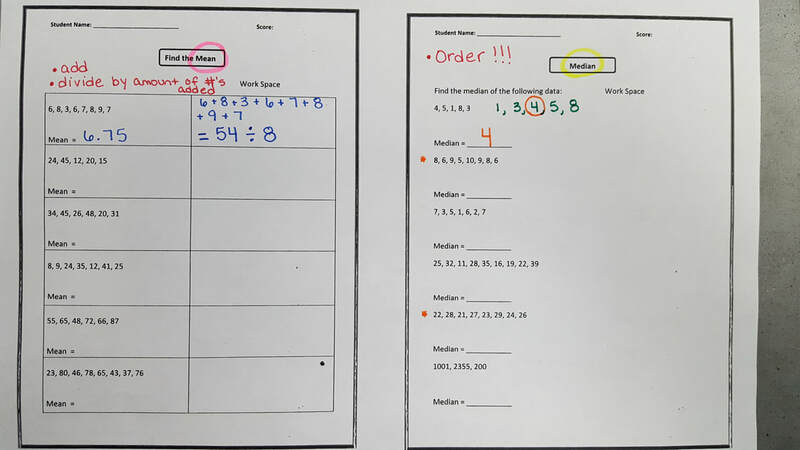 Students will receive 4 minutes in class each day to work on this and ask questions. Then, students worked through an interactive flipchart with Mr. Queen. Afterwards, we glued in some slotted notes into our notebooks and answered the problems in the notes together. Today we reviewed what we learned yesterday about factors and discussed multiples. 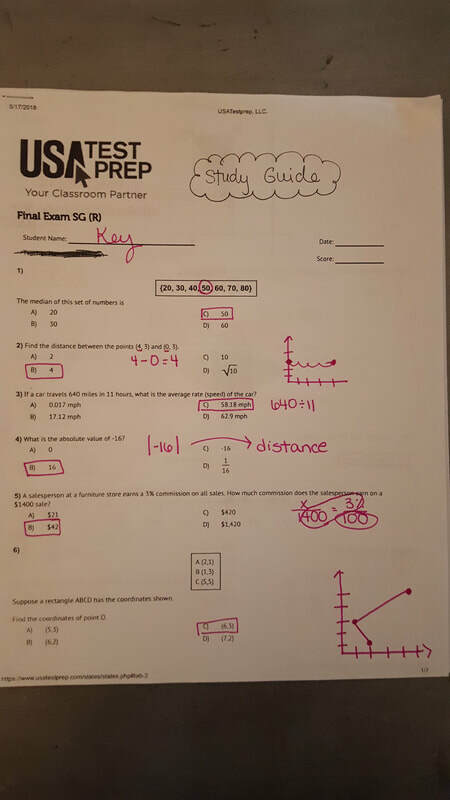 Students completed 2 practice papers over factors & multiples. Today we finished our practice sheet over Place Value & Rounding. We seem to be having several interruptions in class that have put us a day behind. 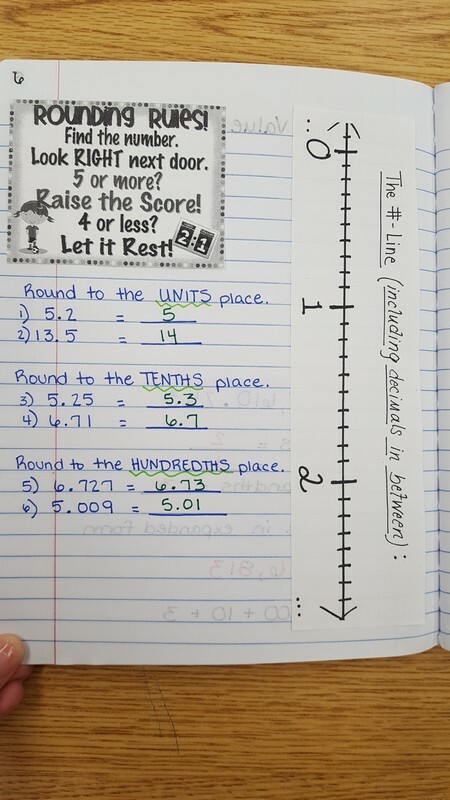 Today students reviewed Place Value & Rounding notes from yesterday. Then, we moved on to review Factors & Multiples. 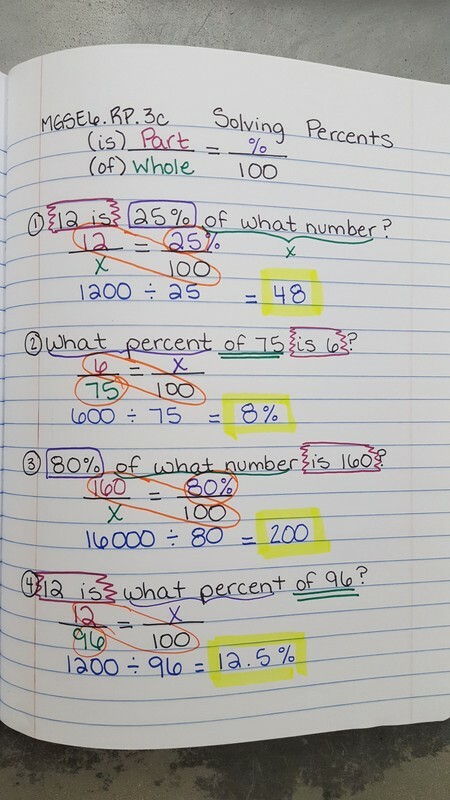 Many students remembered what a factor and a multiple is, but tend to get them jumbled at times. After a brief class discussion we worked through an interactive flipchart. 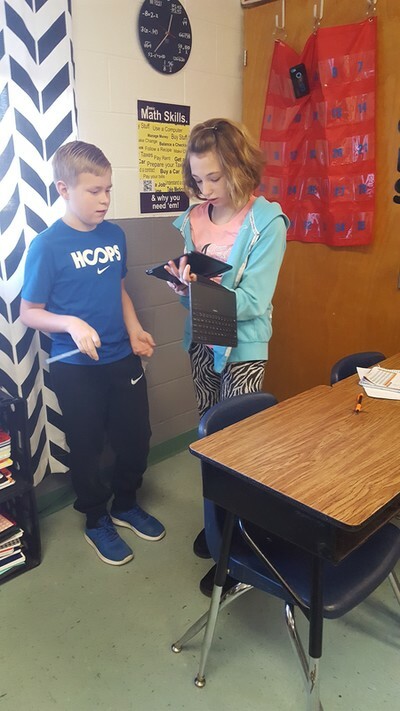 The flipchart was designed so students can come to the board and interact by dragging or placing certain objects/Numbers in their appropriate locations. Students did VERY well with the flipchart. 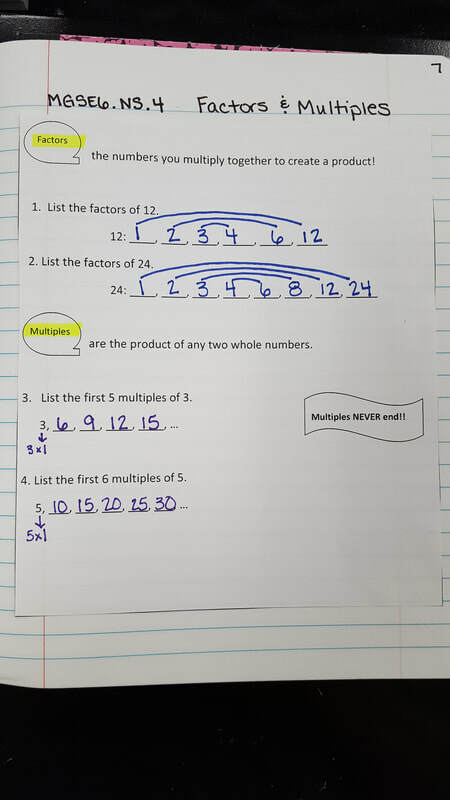 Tomorrow, we'll practice what we learned about factors & multiples today. Today we continued reviewing Place Value & Rounding. 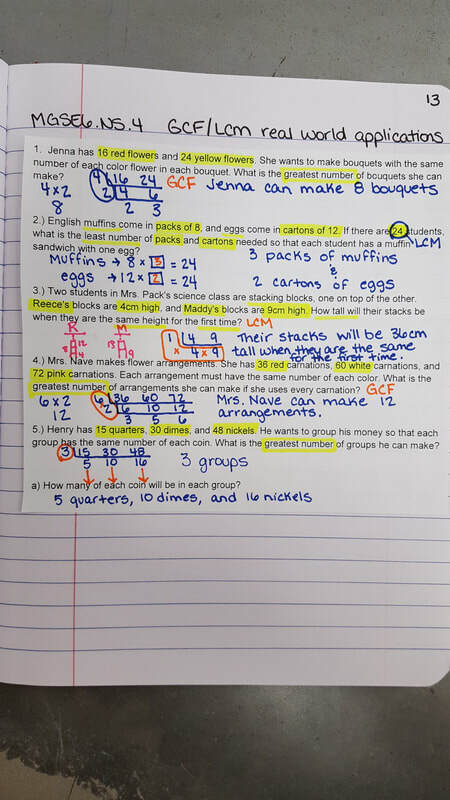 After we finished our notes students worked through a practice sheet. We didn't quite finish the practice sheet, but we'll finish tomorrow. 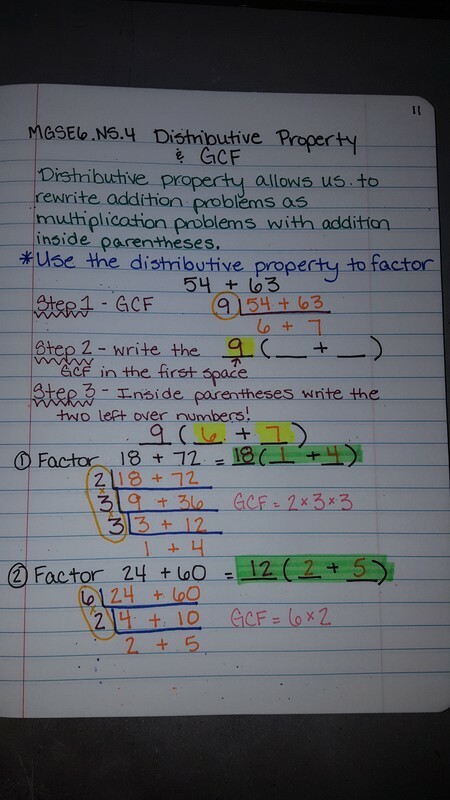 We'll also move on to Factors & Multiples tomorrow. Today students completed their first Warm-up in the math class. Warm-ups are completed when students enter the classroom. These are recorded in the composition book they leave in the classroom. 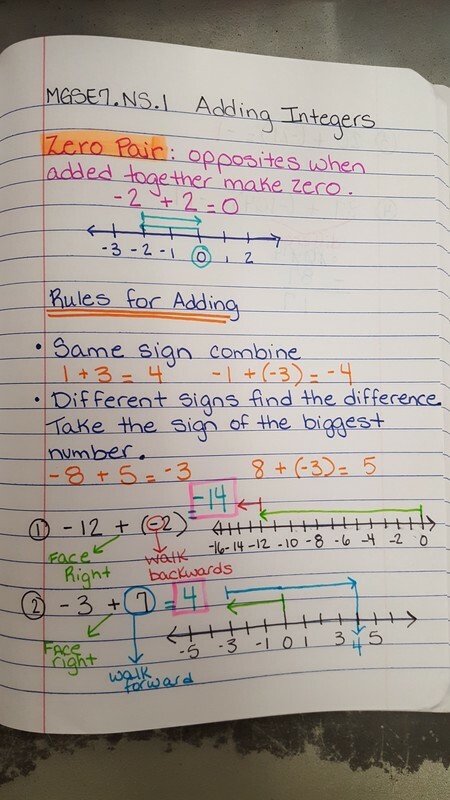 Then, students set their math notebook up. We made the first 2 pages the "Table of Contents" pages. Then, we began our first page of notes on page 5. Today students reviewed "Place Value & Rounding". This is an Elementary standard that students often forget. We watched a brief BrainPop video and then took the notes pictured below. Tomorrow we'll discuss Factors! Today students took a pre-assessment over 6th grade math standards. We will use this assessment to monitor and record student growth throughout the school year. Please have your composition books in class tomorrow!! 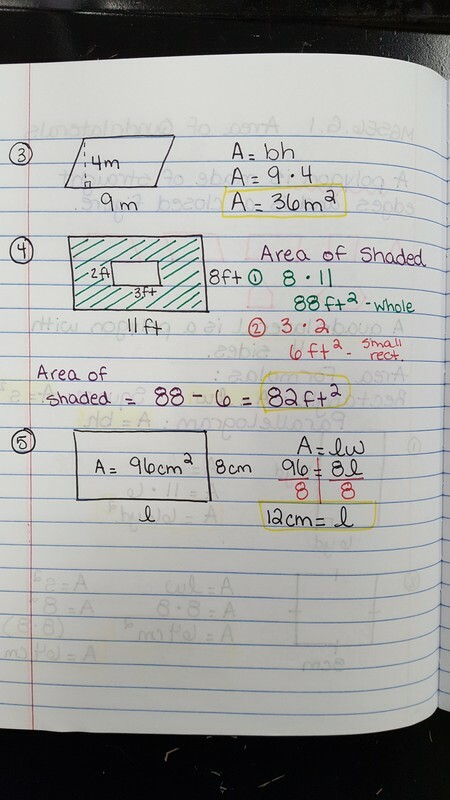 Students will need 2 composition books for math class by Wednesday! We will be using BOTH in class on Wednesday! Today was a great first day of school. Today we had several items to discuss in each class. Students received their Agenda's and a packet of paperwork in 1st period today. Students also read the Student Handbook throughout each class today. ​All colored papers in each packet are due back Monday! 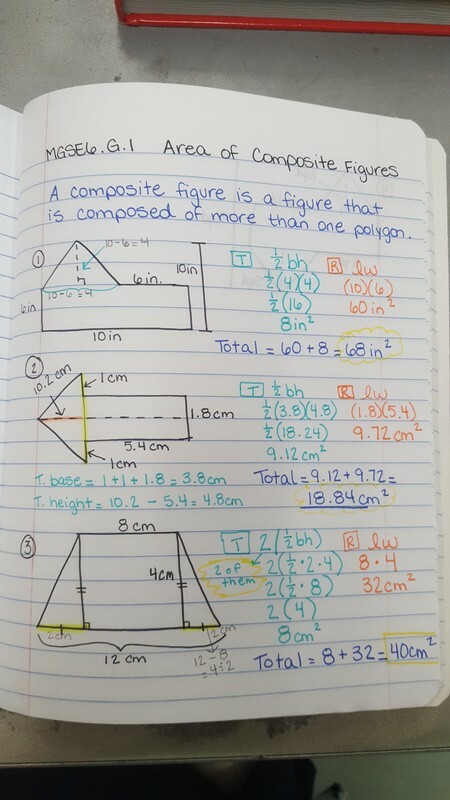 Please try to have 2 composition books for Math Class by Tuesday, August 8th.